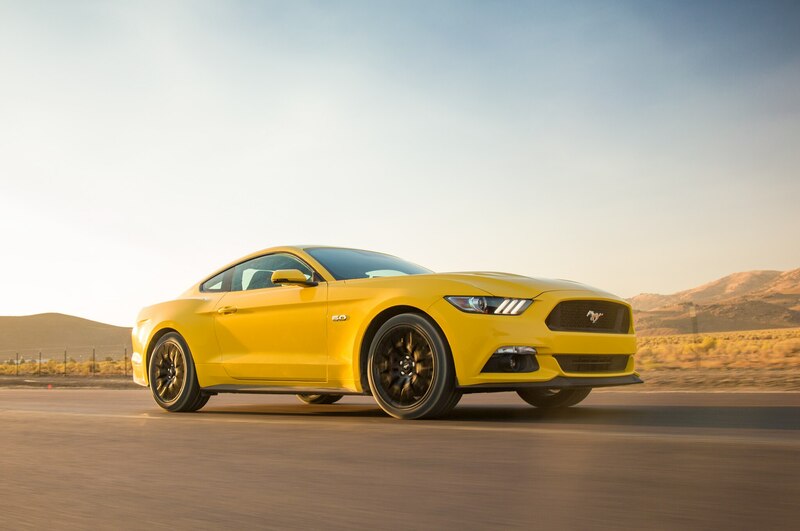 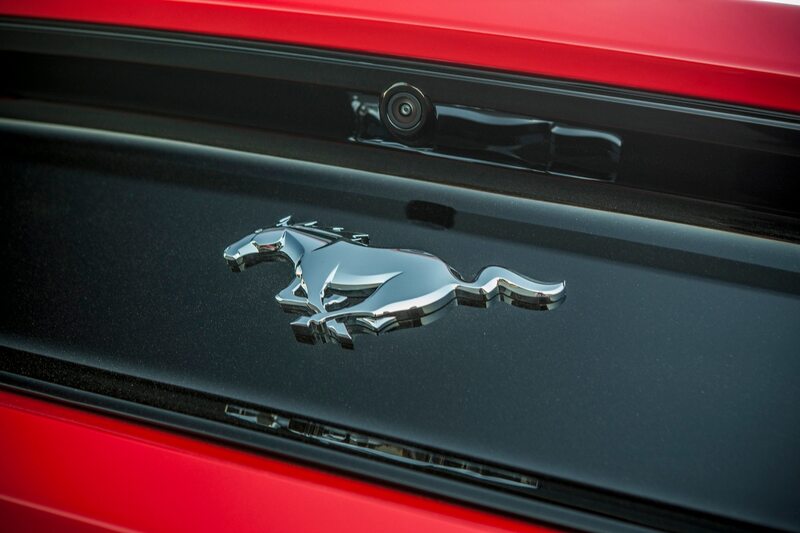 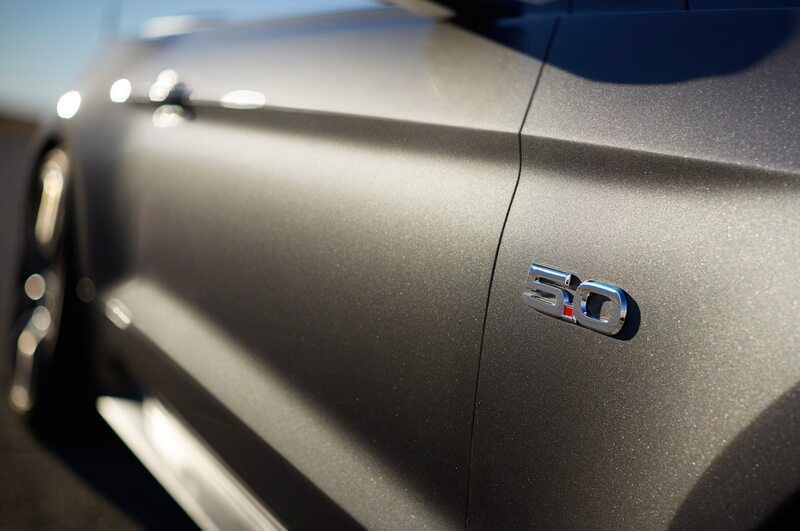 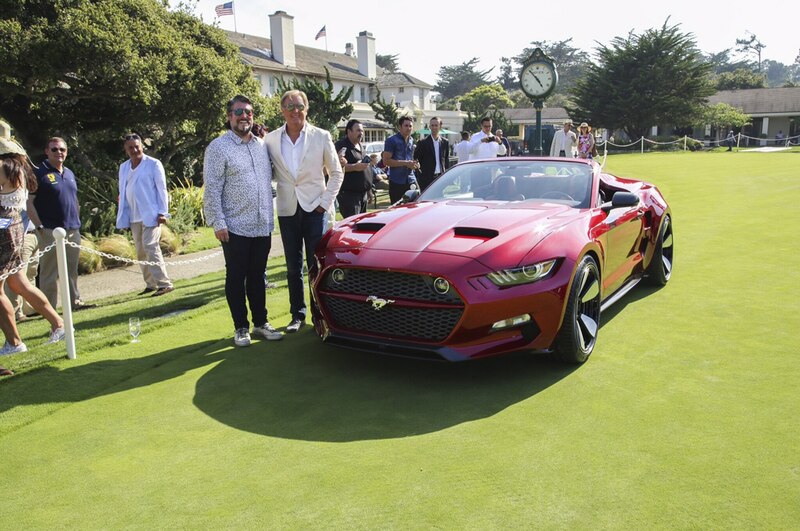 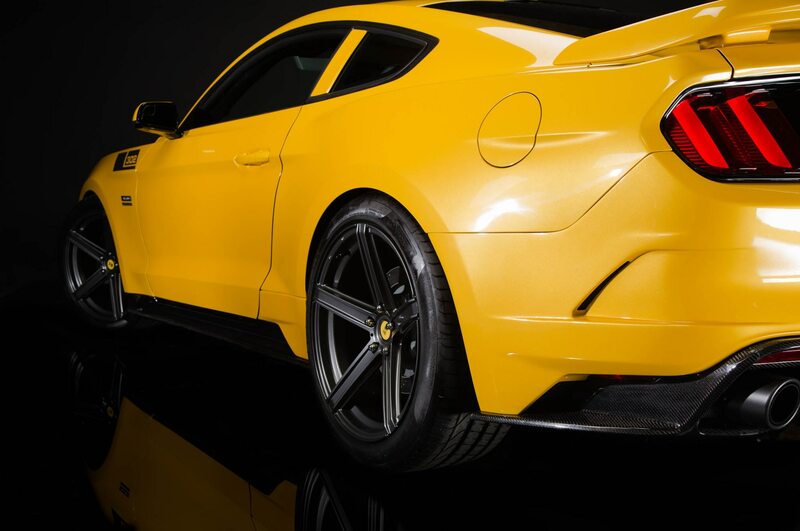 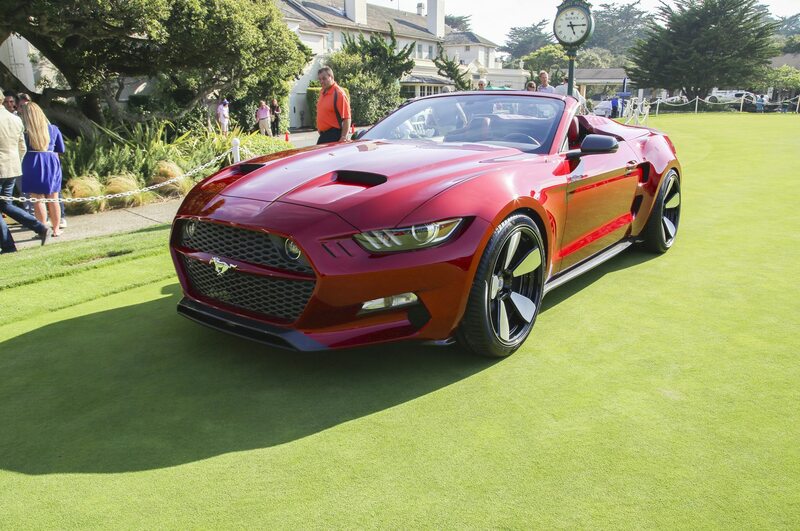 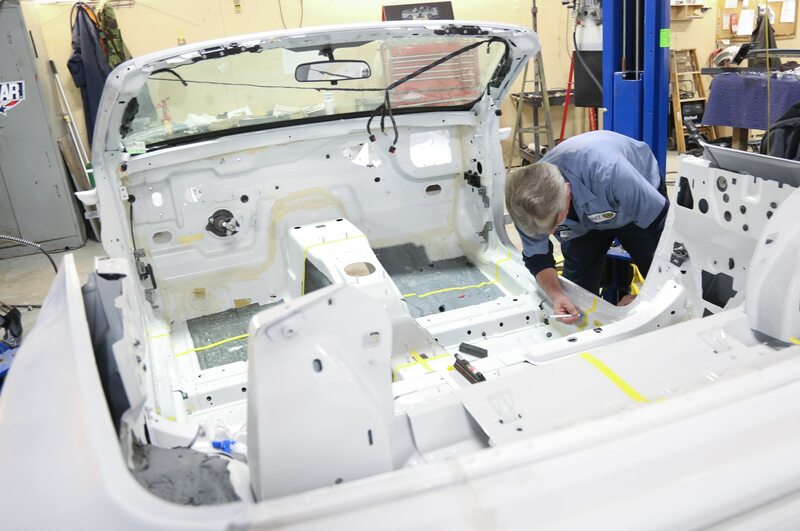 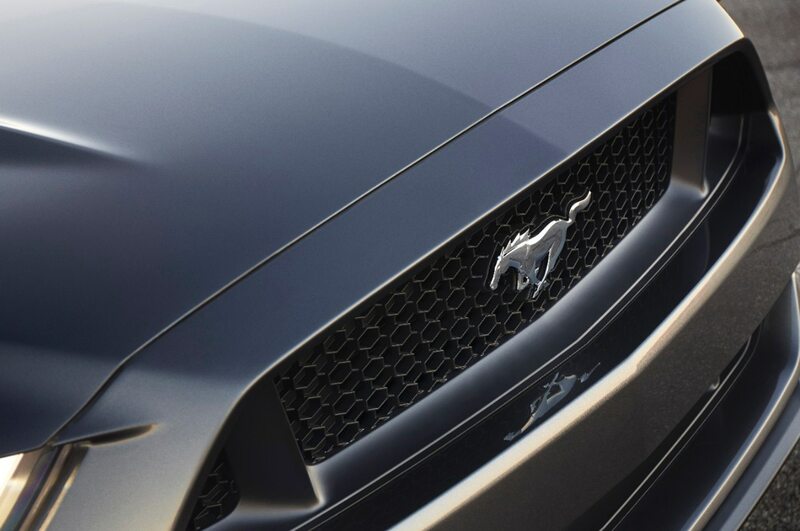 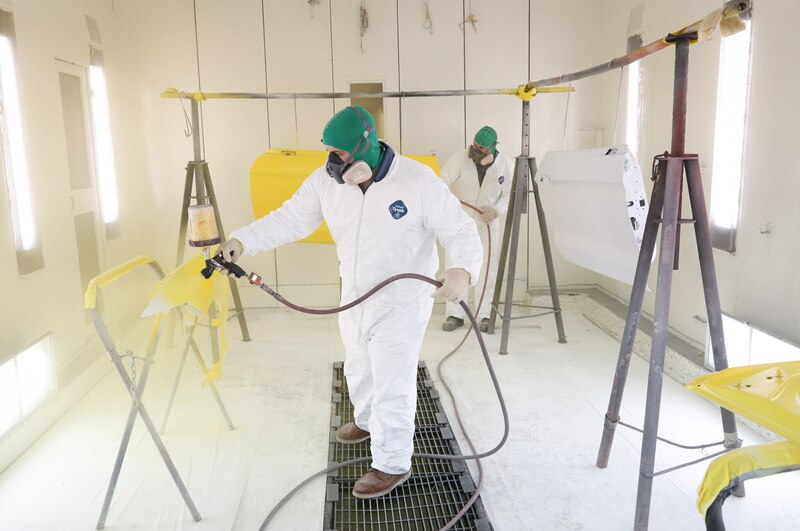 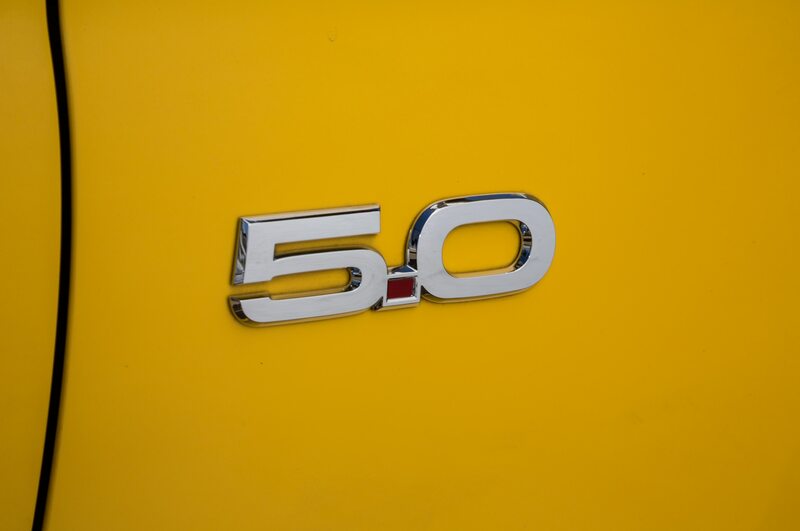 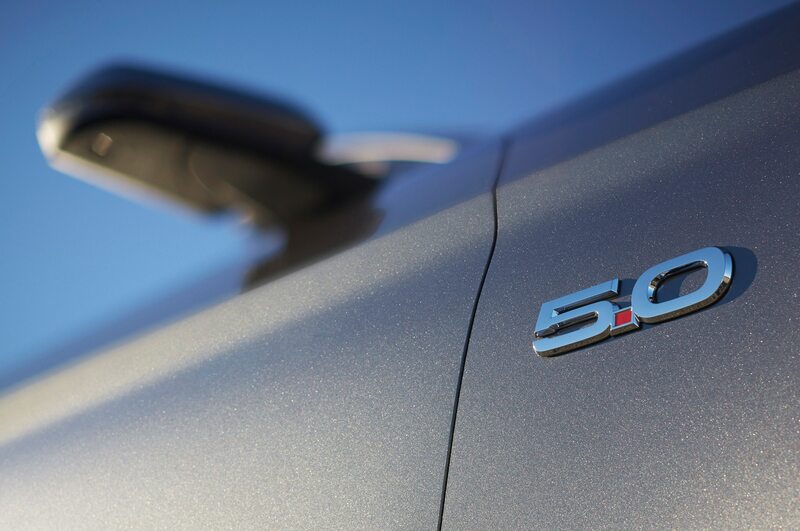 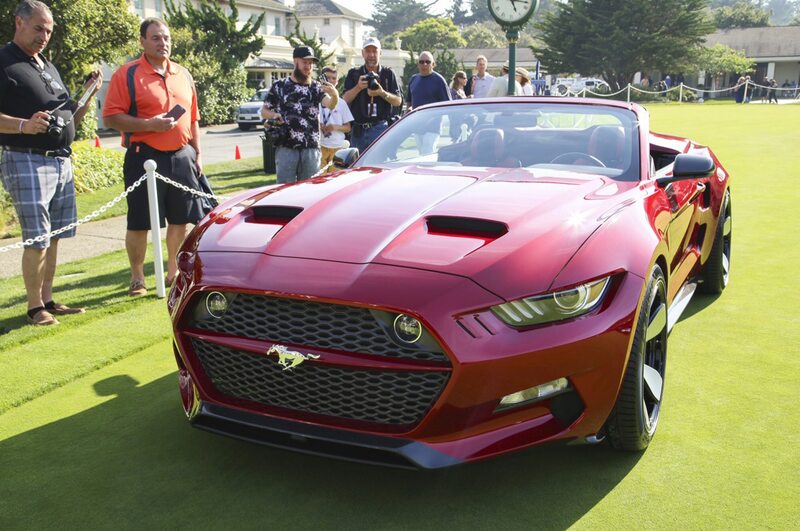 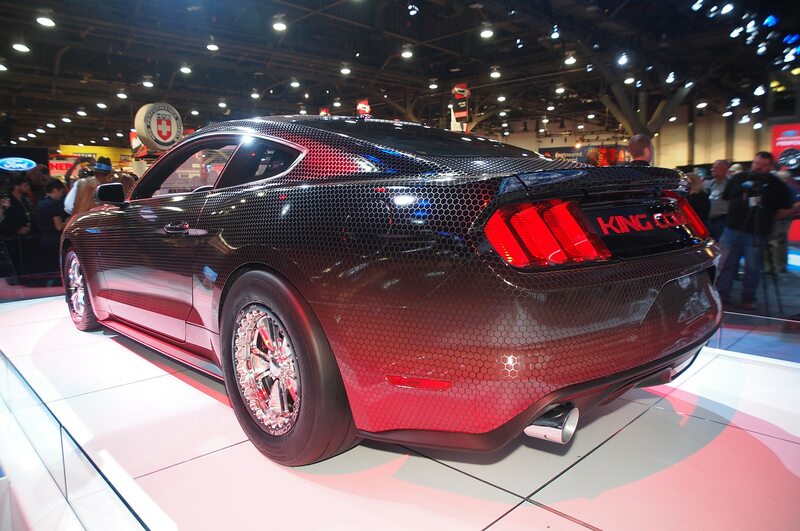 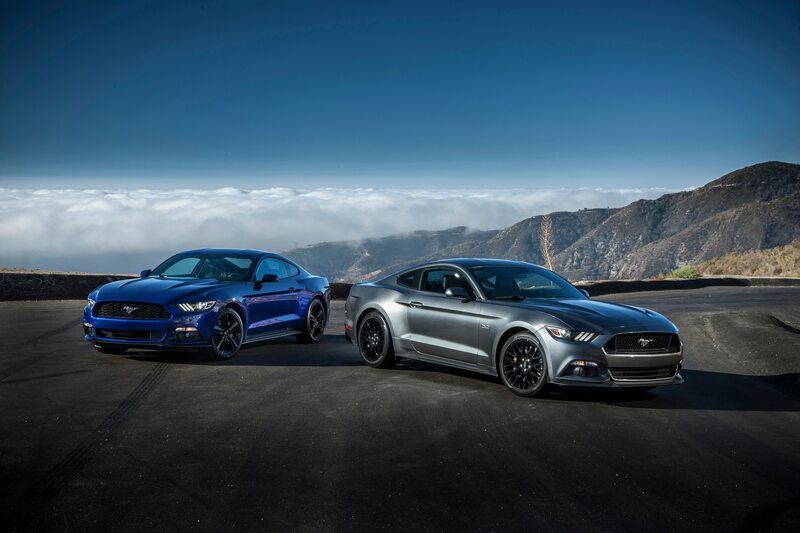 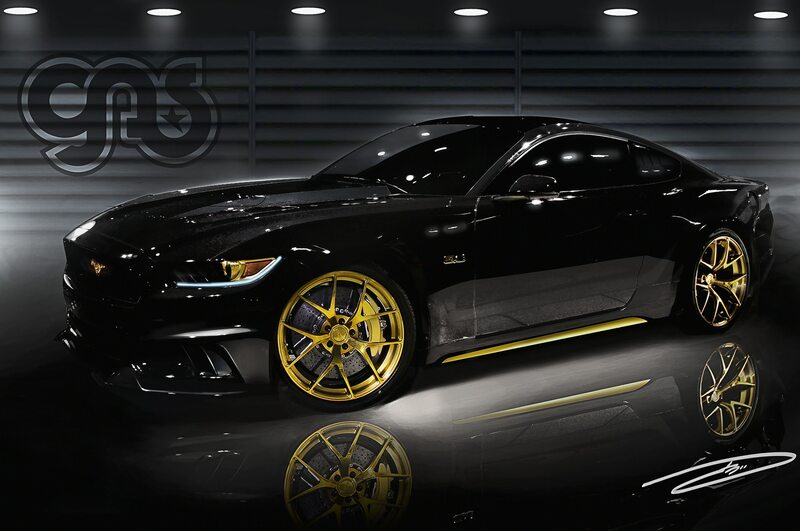 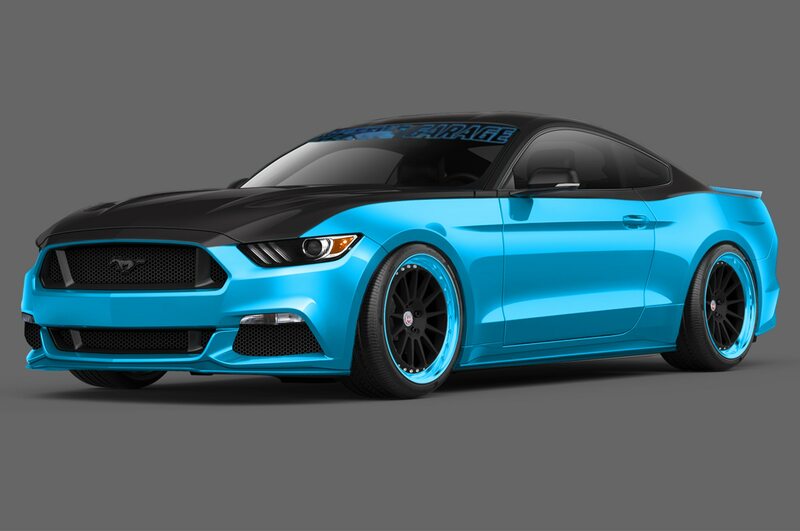 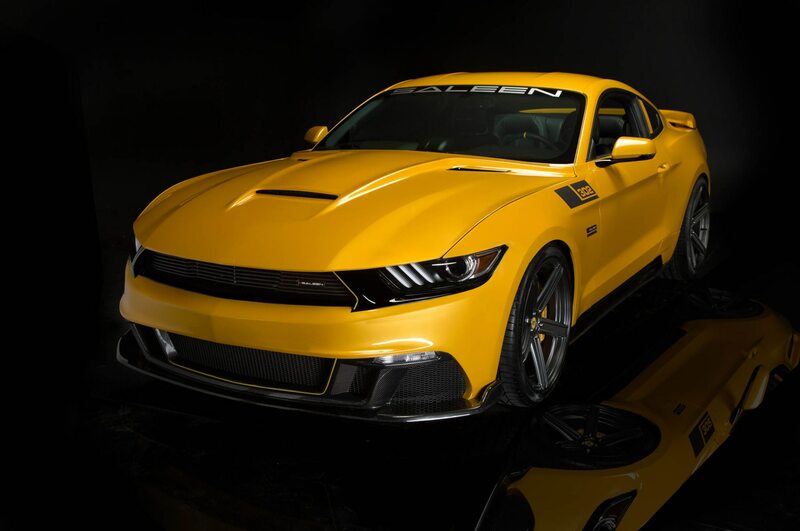 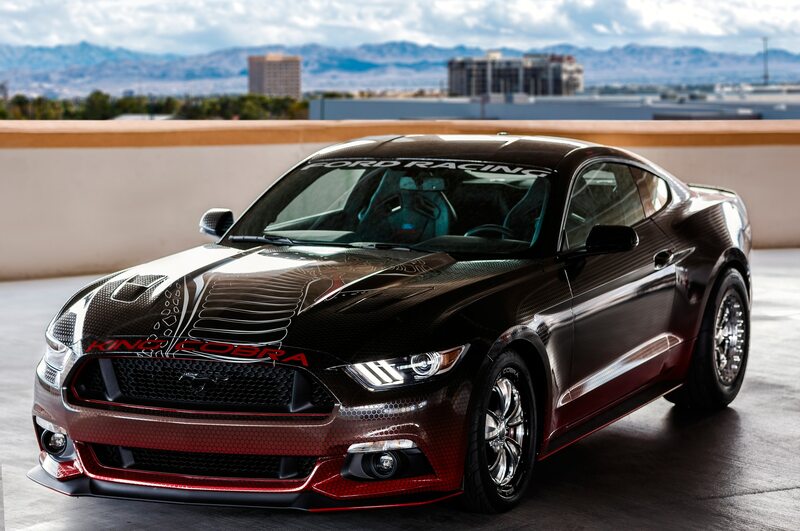 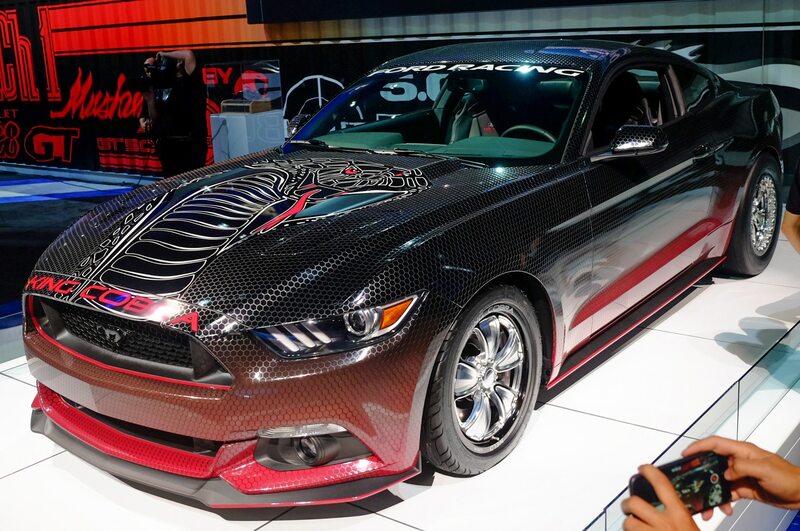 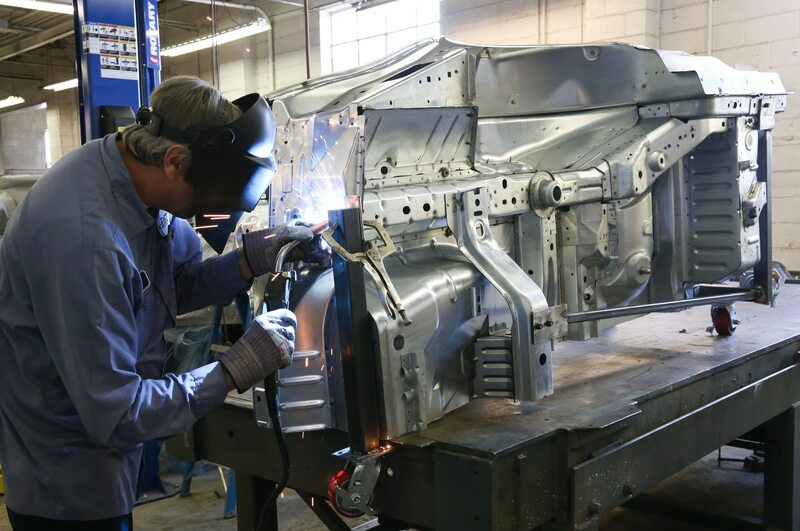 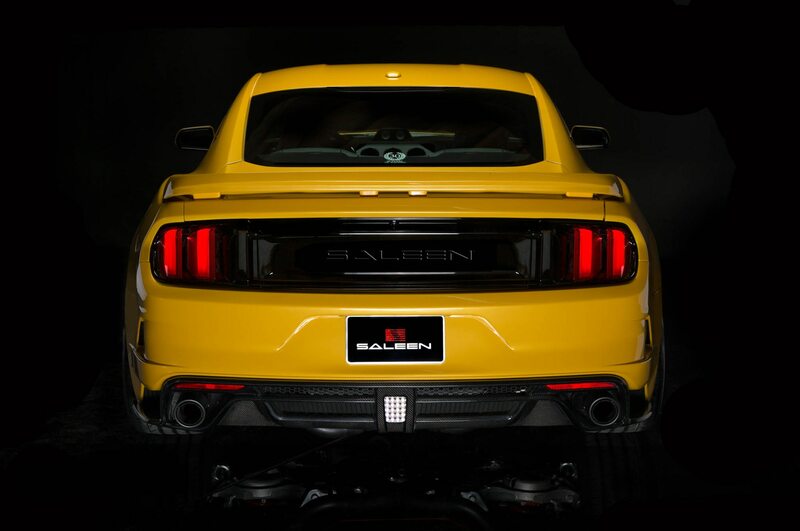 Fifty years after the debut of the Ford Mustang, the all-new sixth-generation version of the original ponycar sets new standards for the segment it created back in 1964. 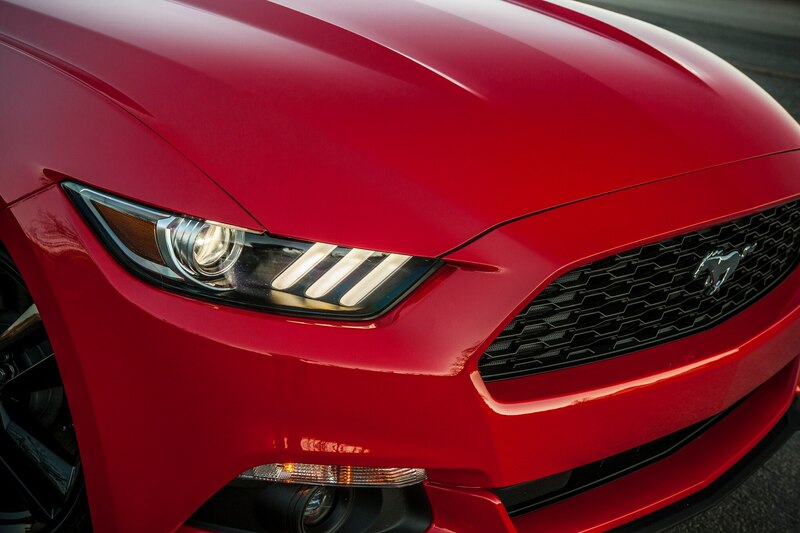 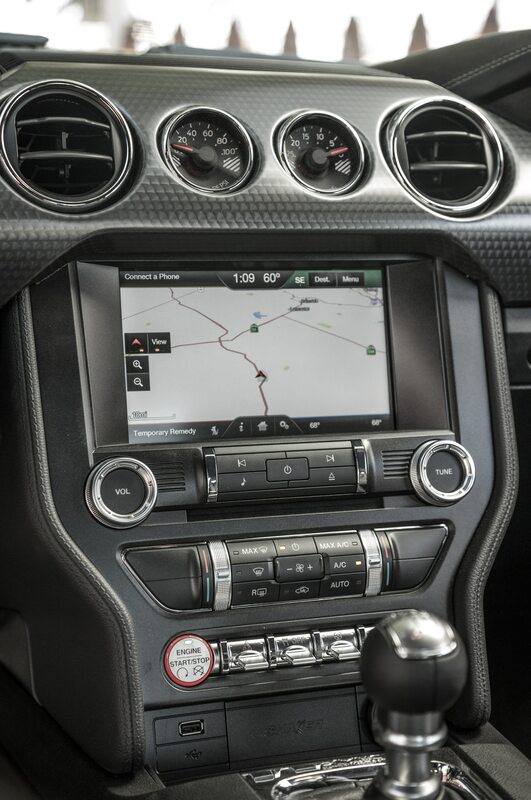 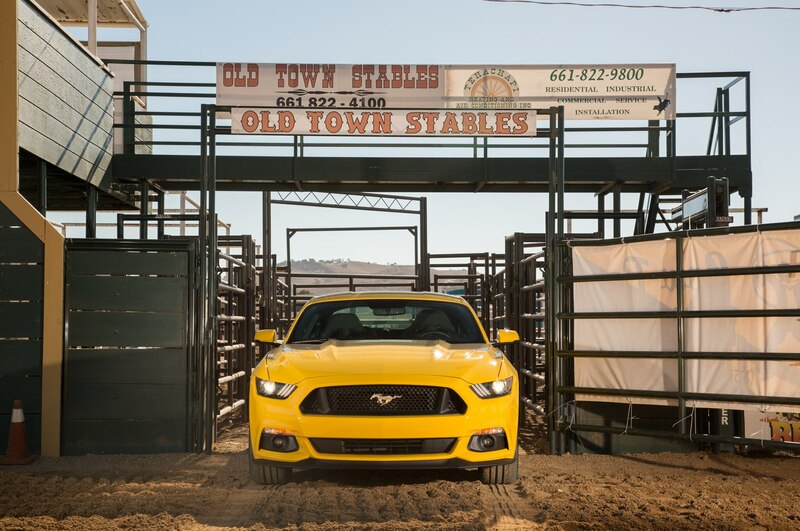 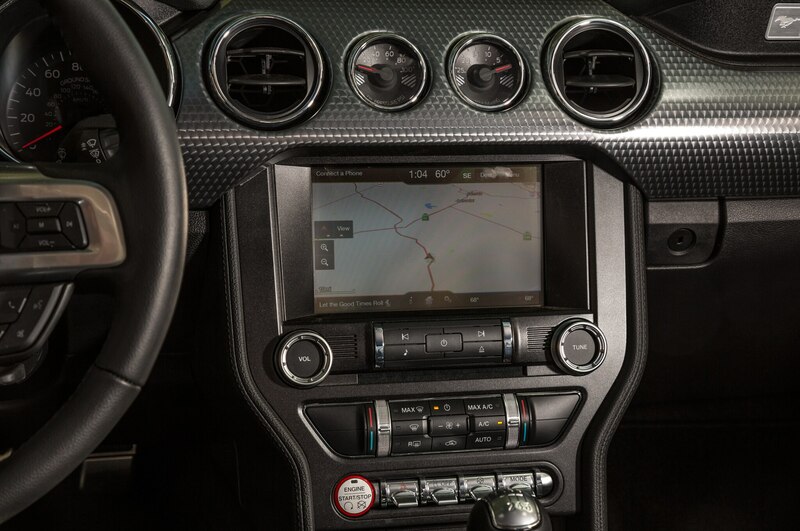 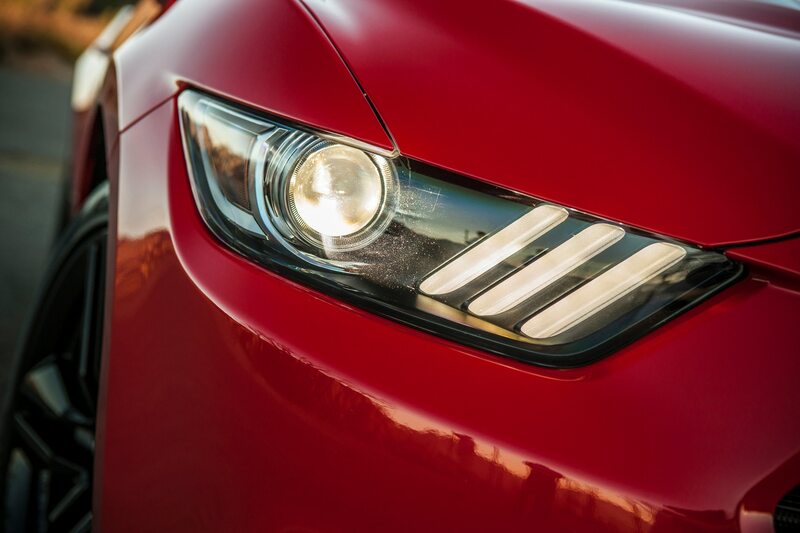 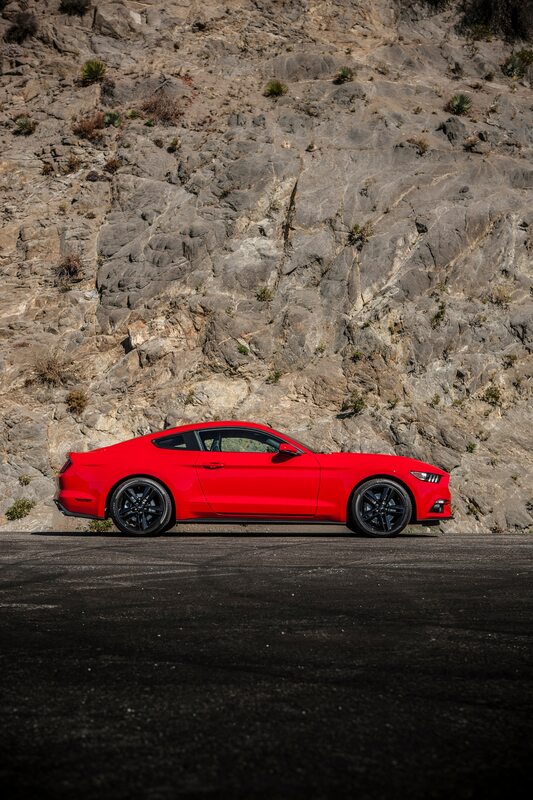 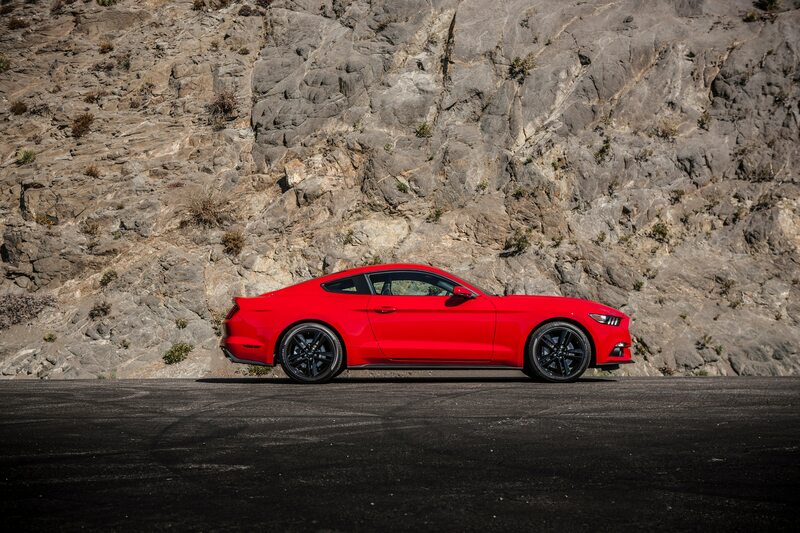 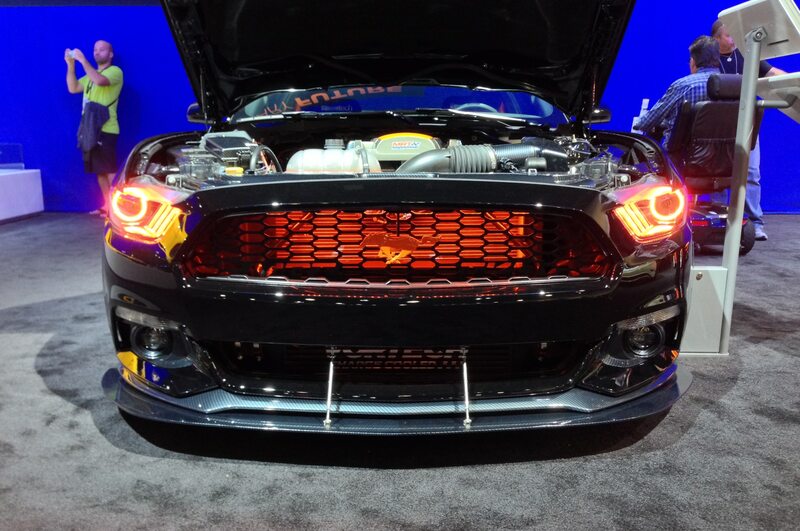 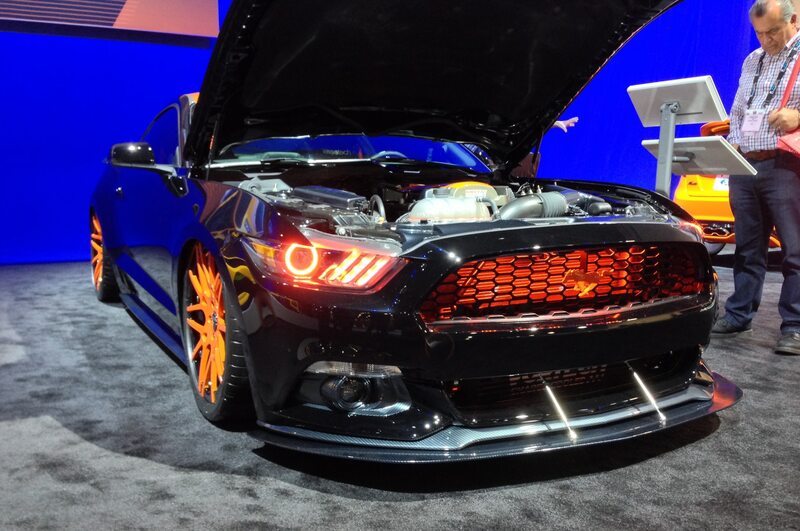 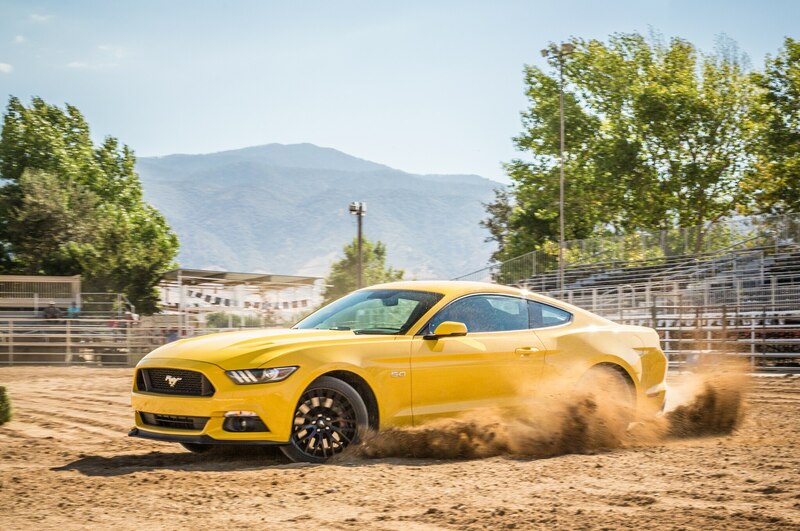 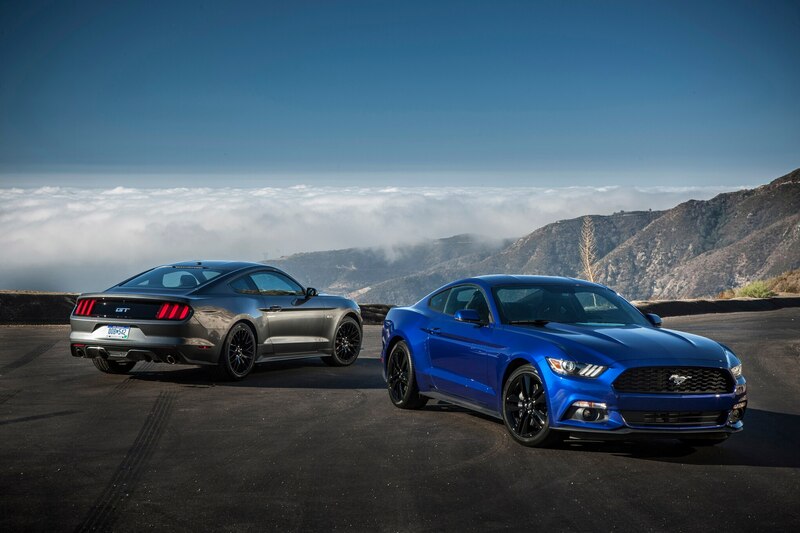 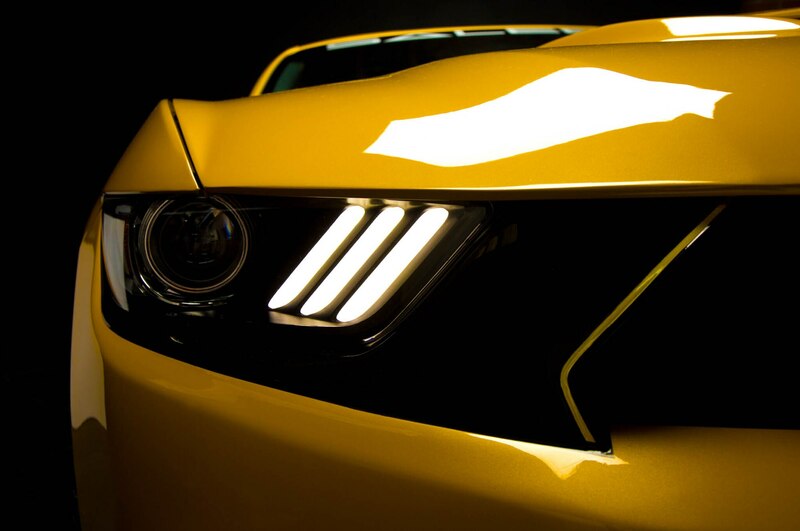 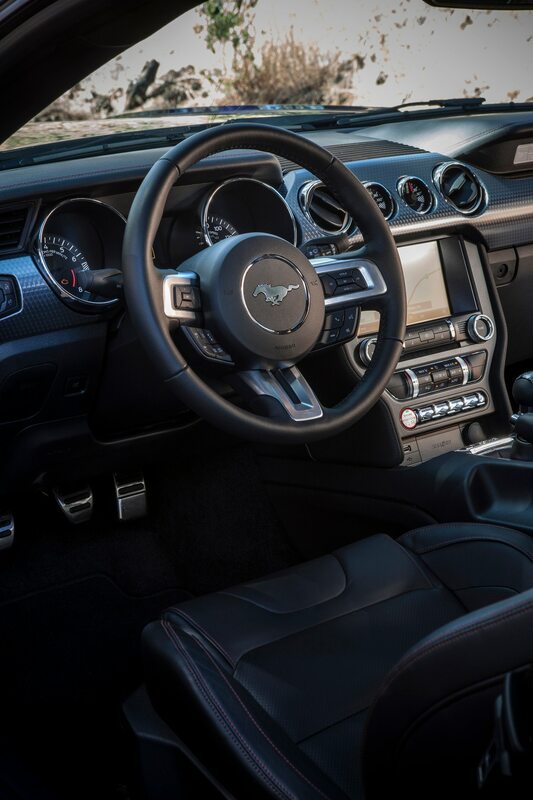 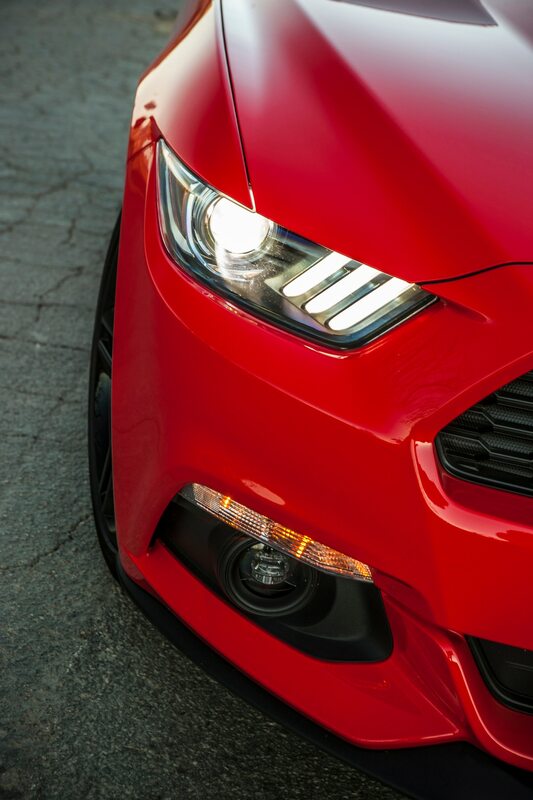 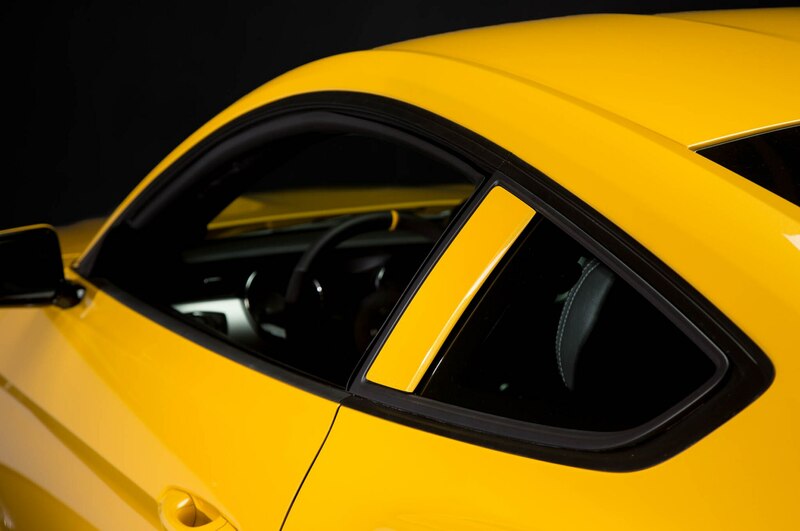 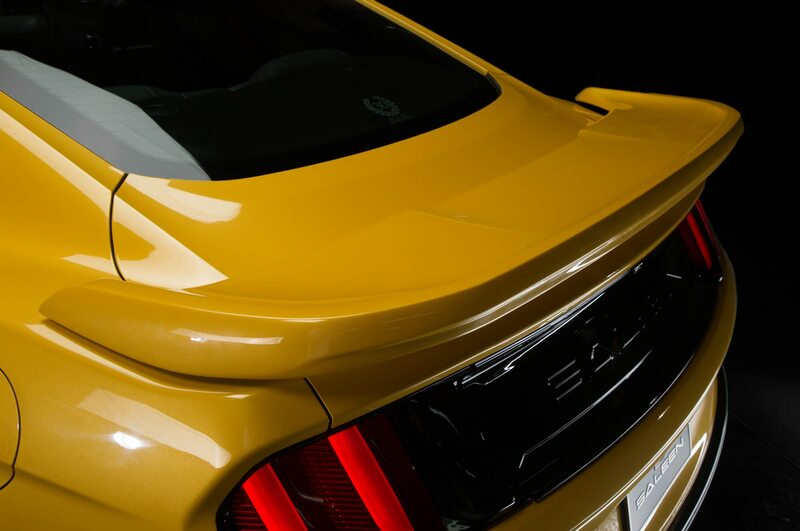 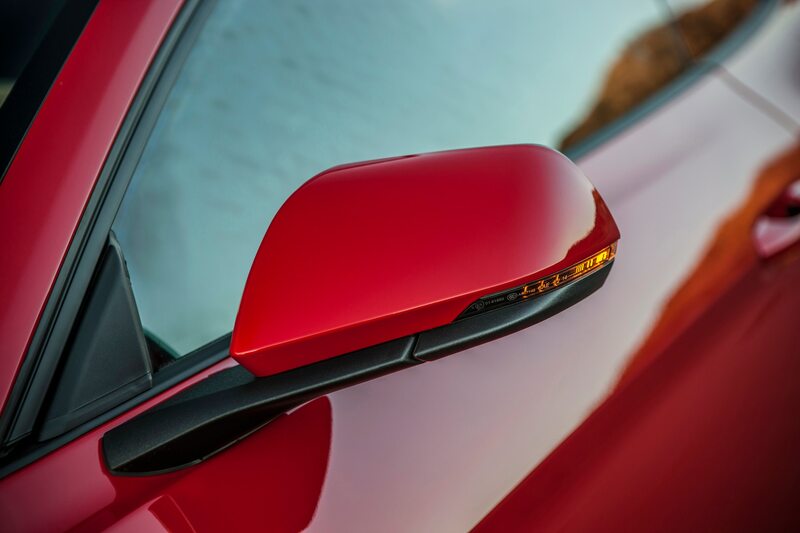 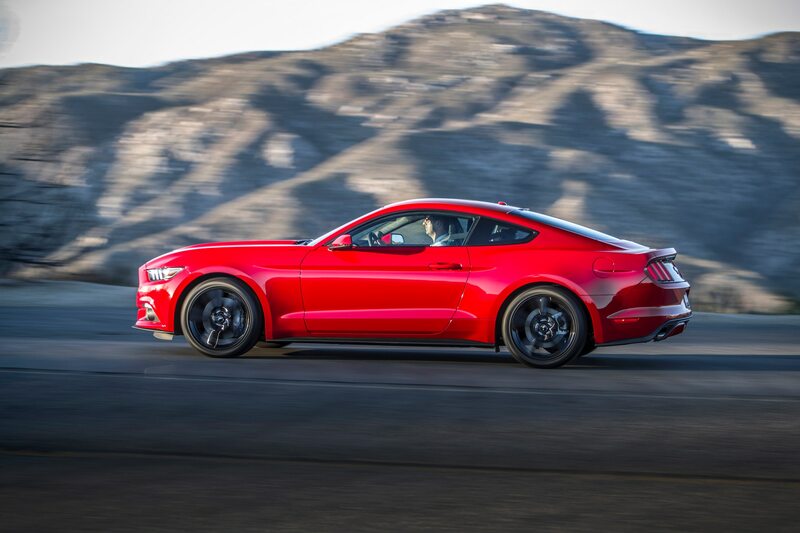 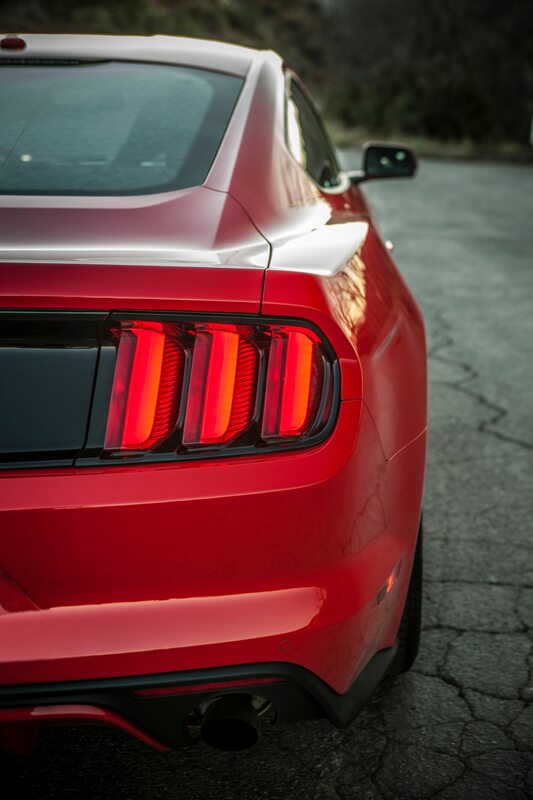 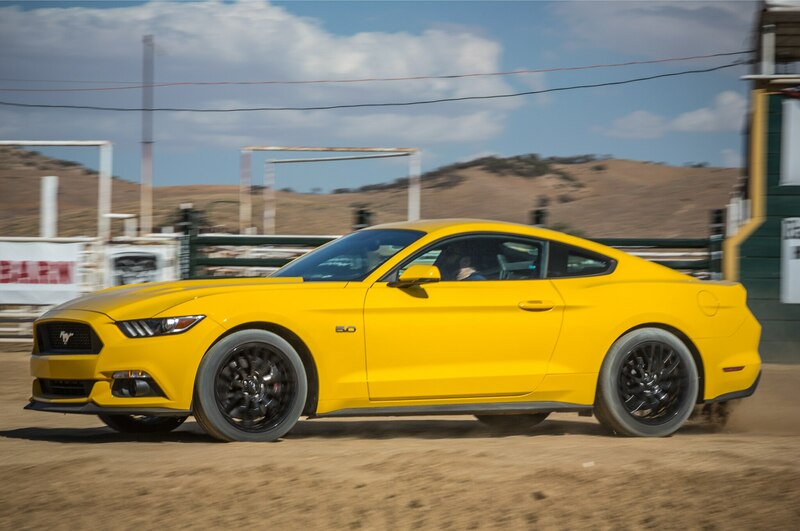 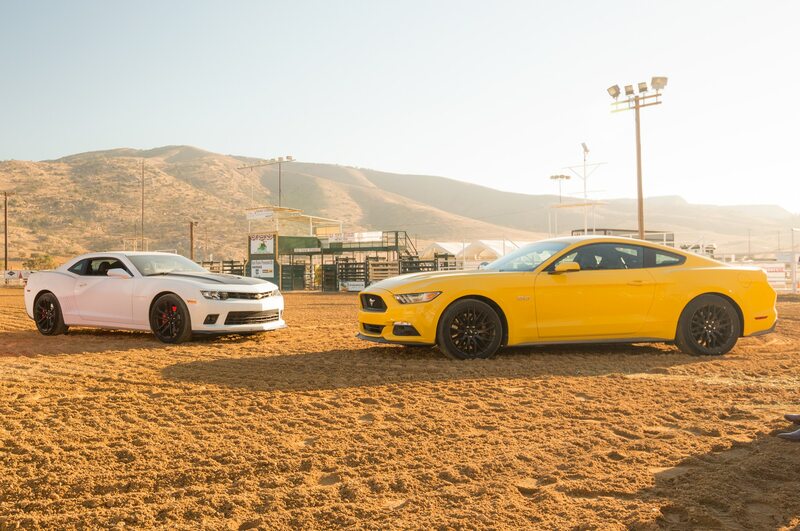 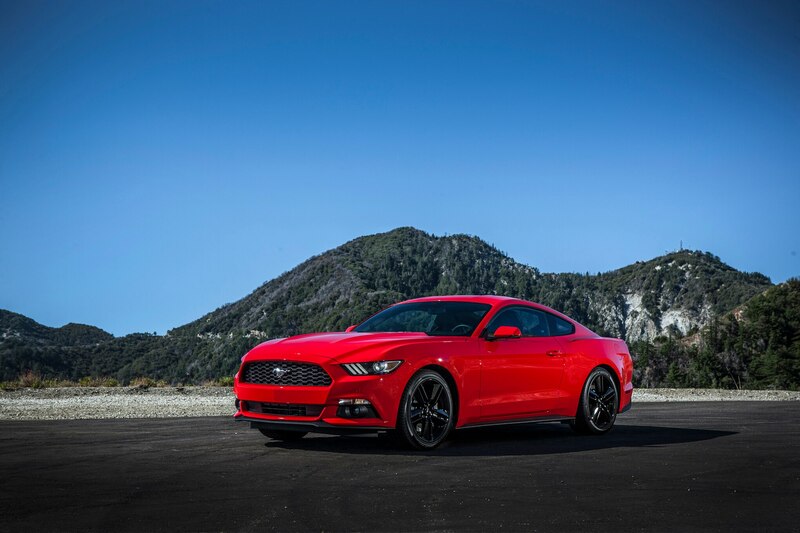 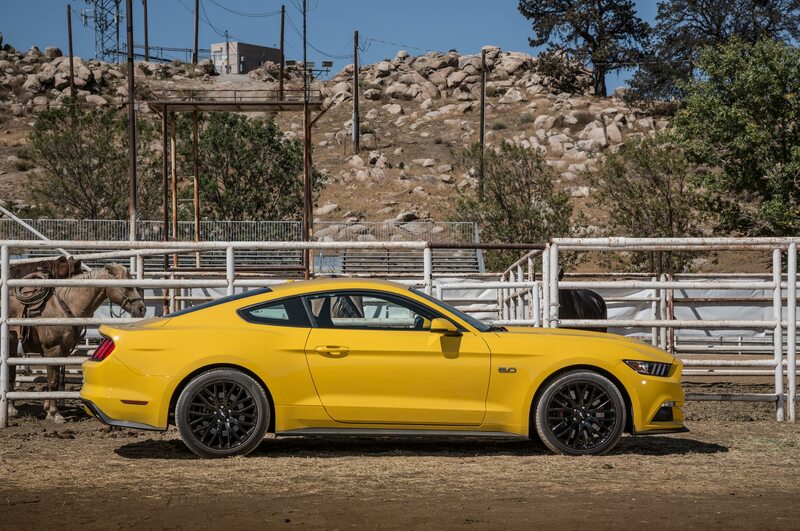 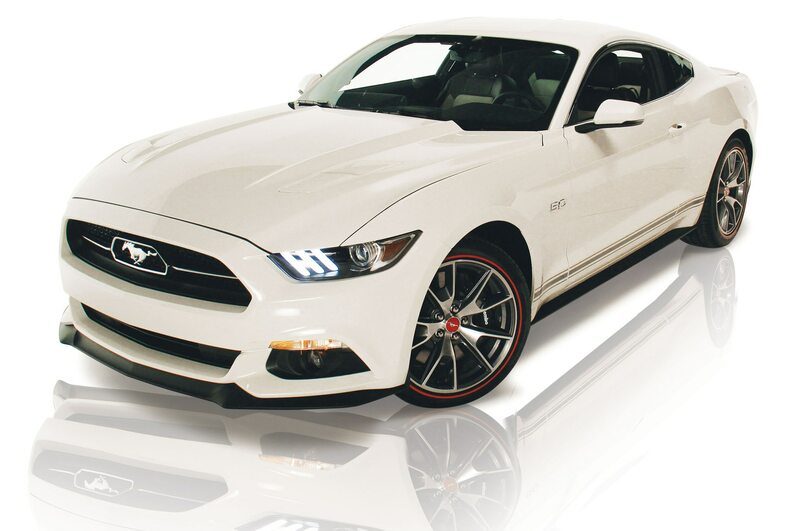 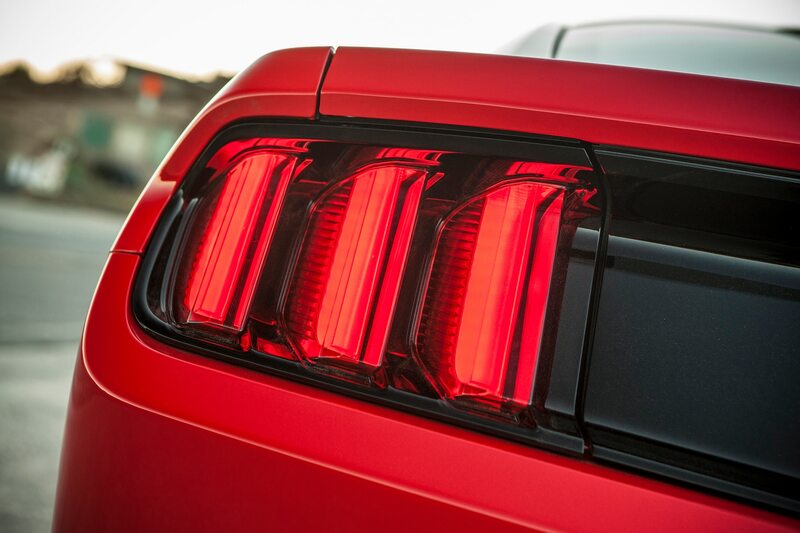 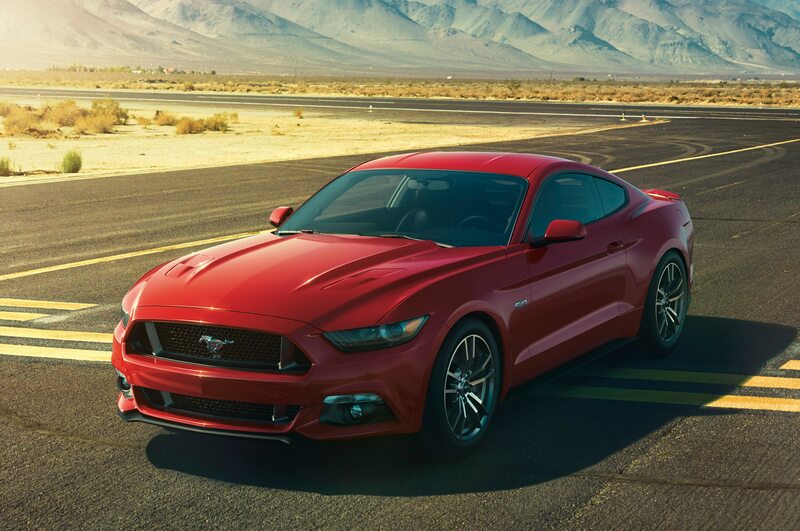 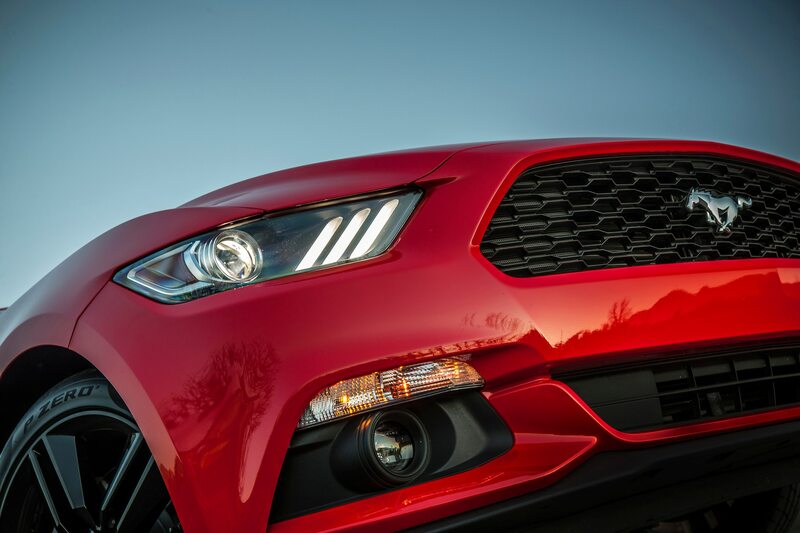 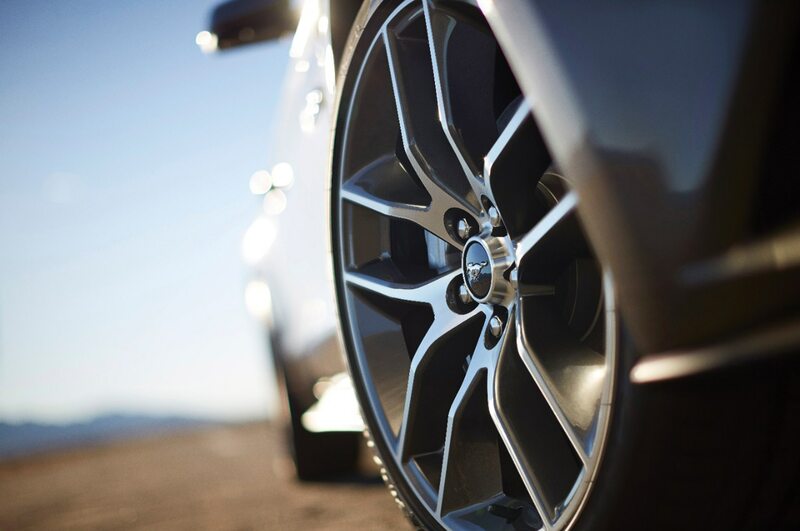 The 2015 Ford Mustang represents a fresh take on a formula that had grown stale, making a car that was meant to evoke carefree youth seem faintly middle-aged. 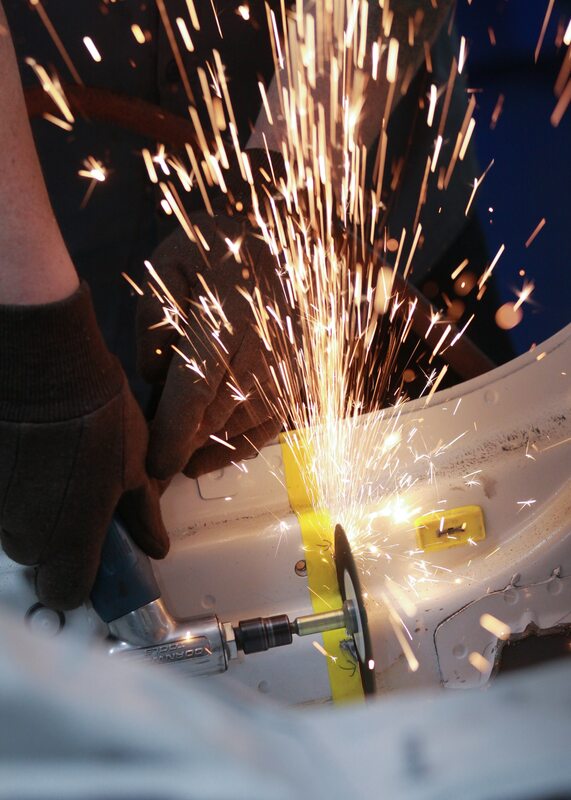 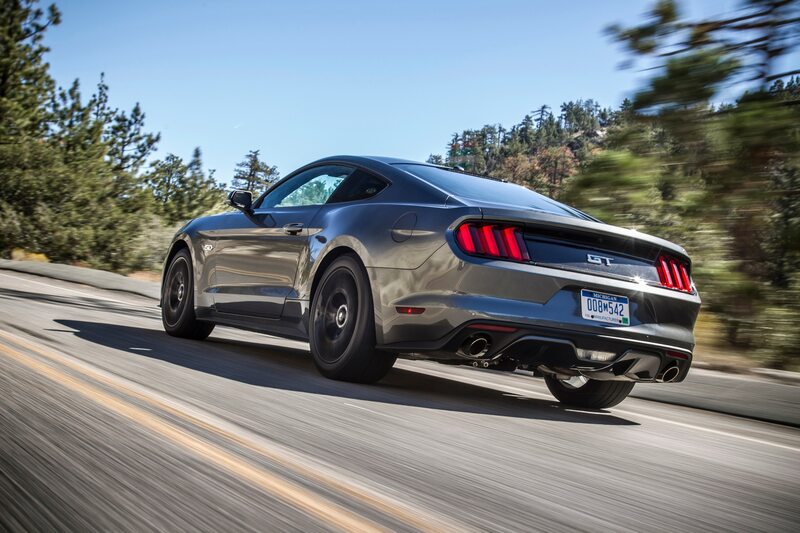 Gone — finally, finally — is the solid rear axle, belatedly replaced by a fully independent suspension that soaks up bumps and road imperfections. 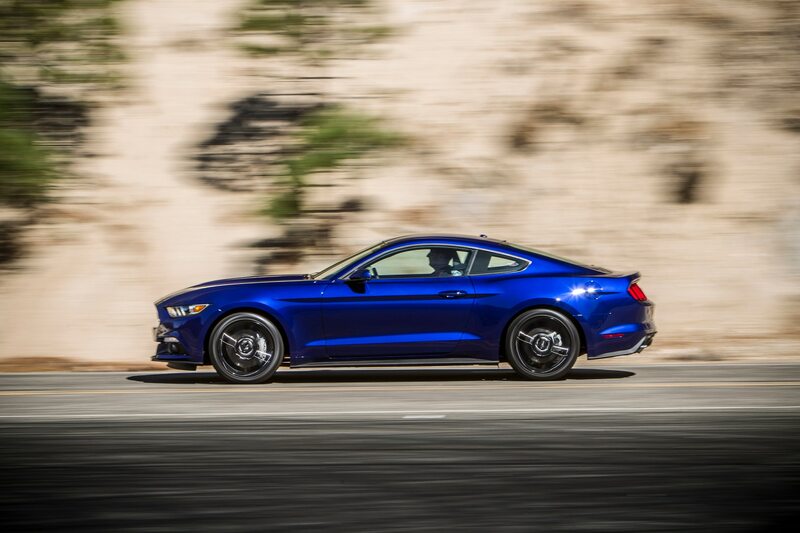 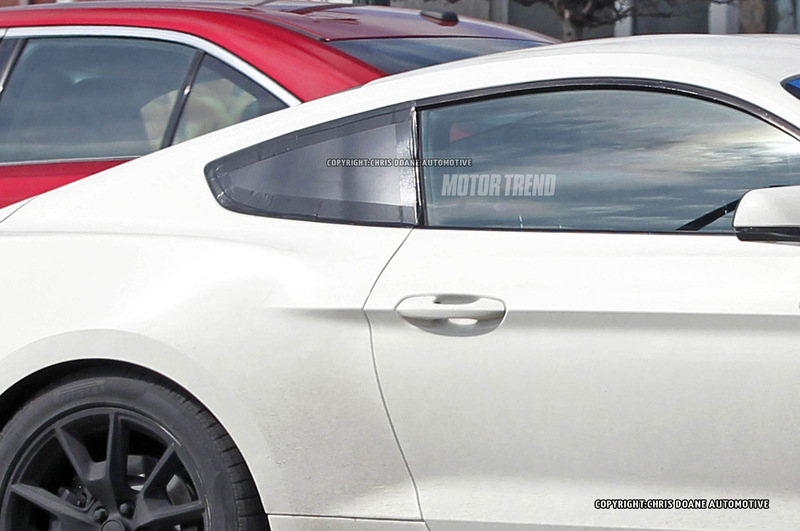 Ford also navigated a nifty escape from the straitjacket of retro design by embracing a sleeker, more contemporary shape whose general contours and proportions still scream Mustang. 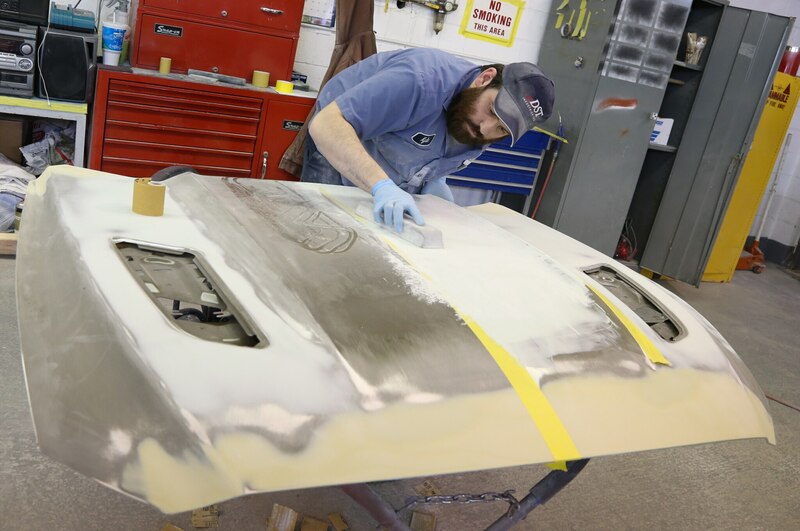 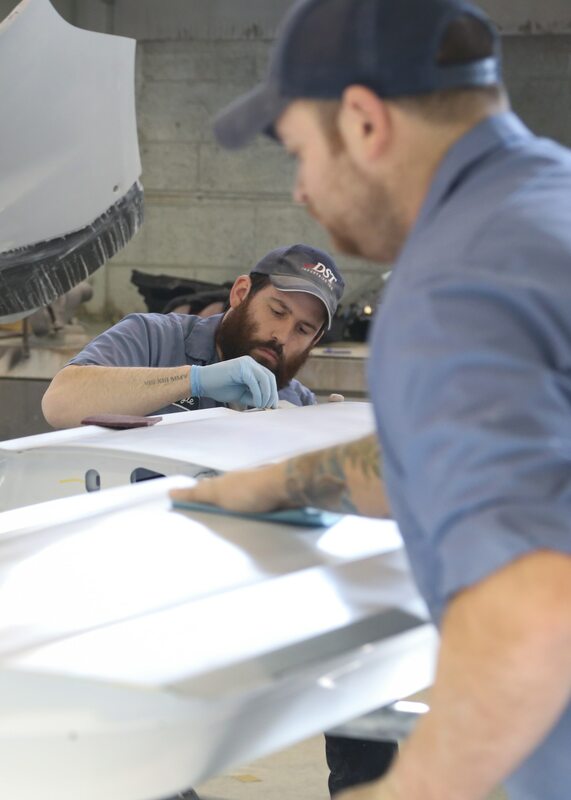 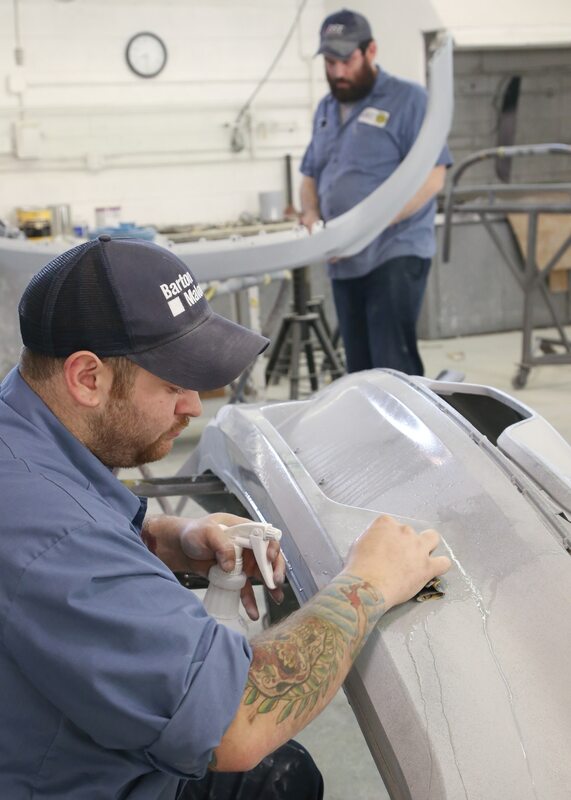 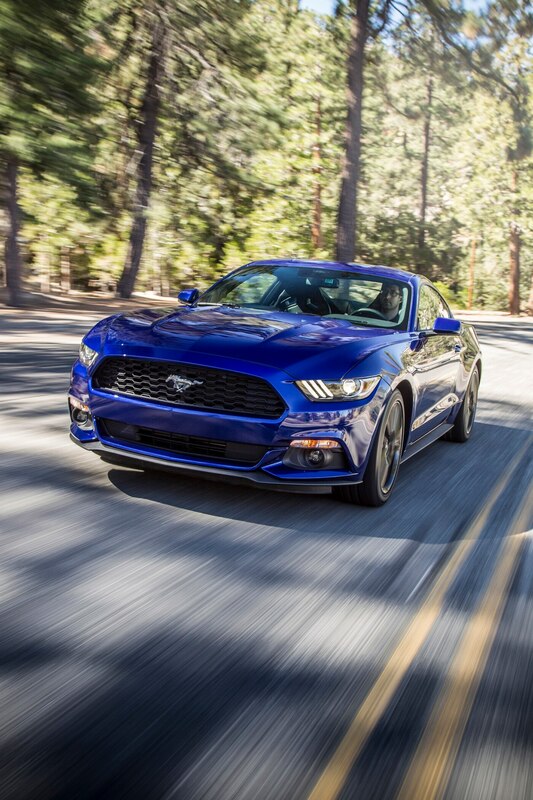 But even as the car moves boldly into the 21st century, it continues to embody all-American automotive verities such as distinctive styling, bang for the buck, and, best of all, brawny Detroit muscle. 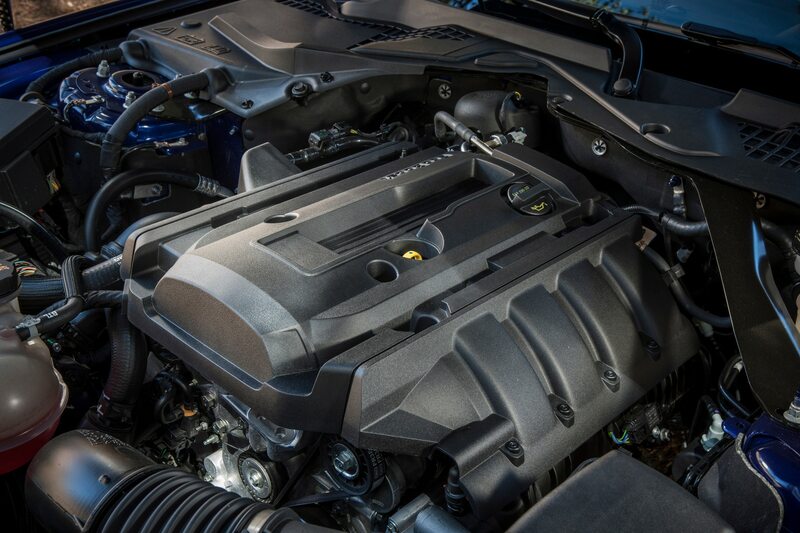 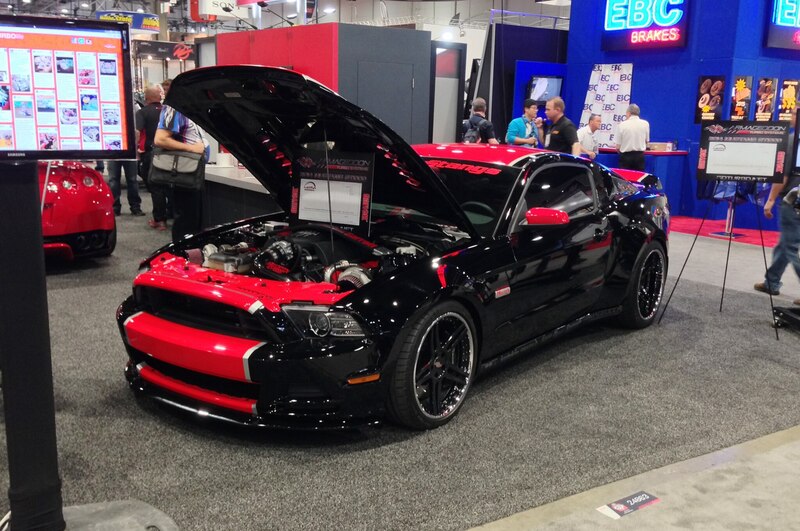 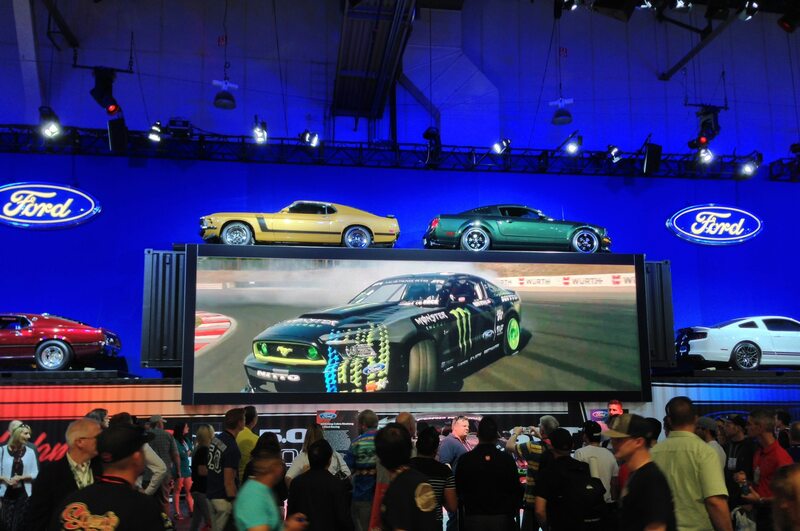 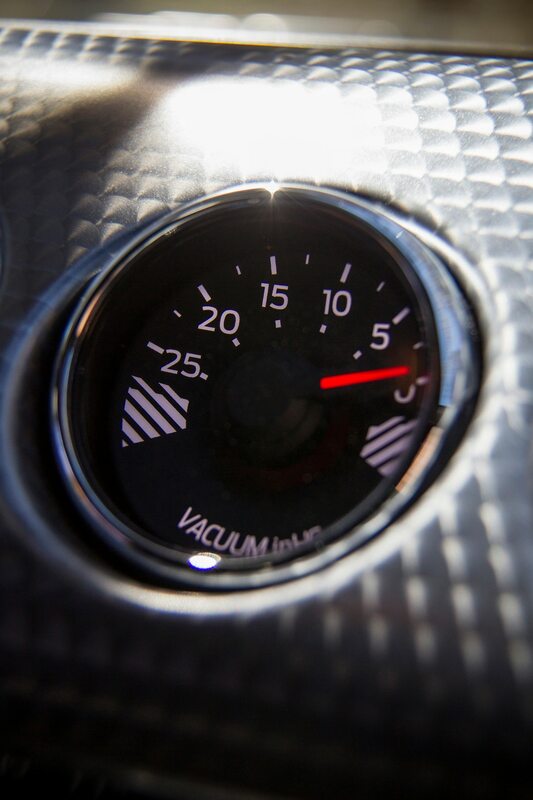 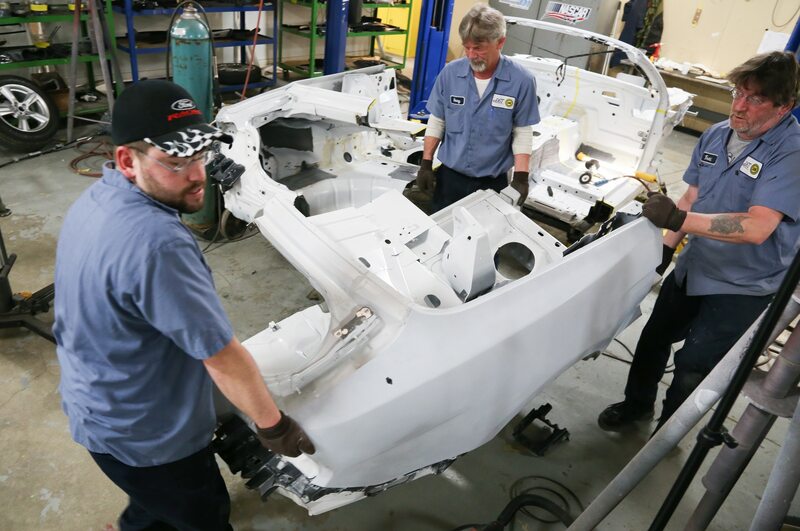 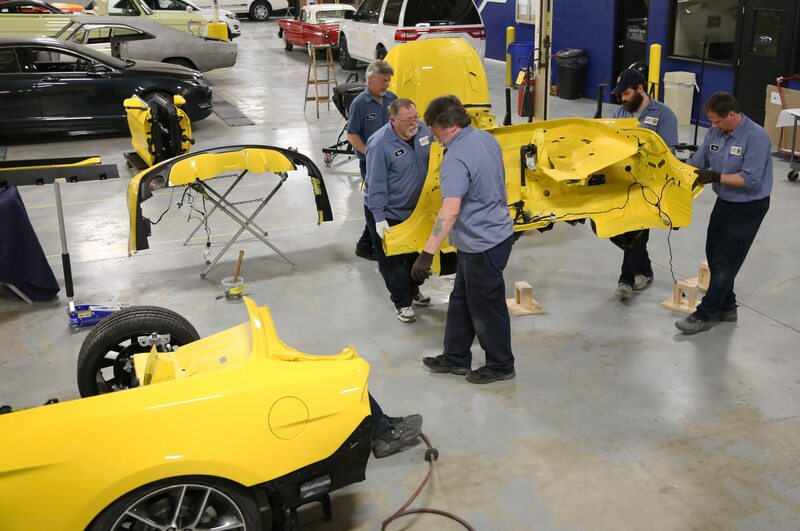 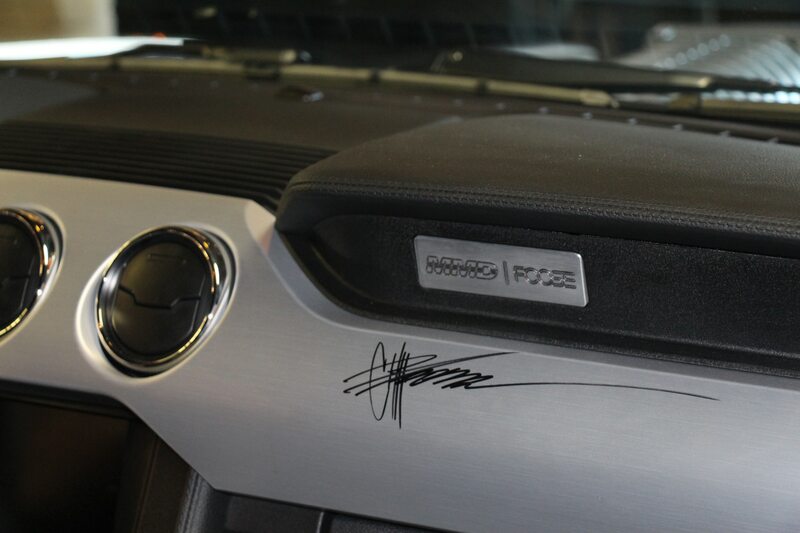 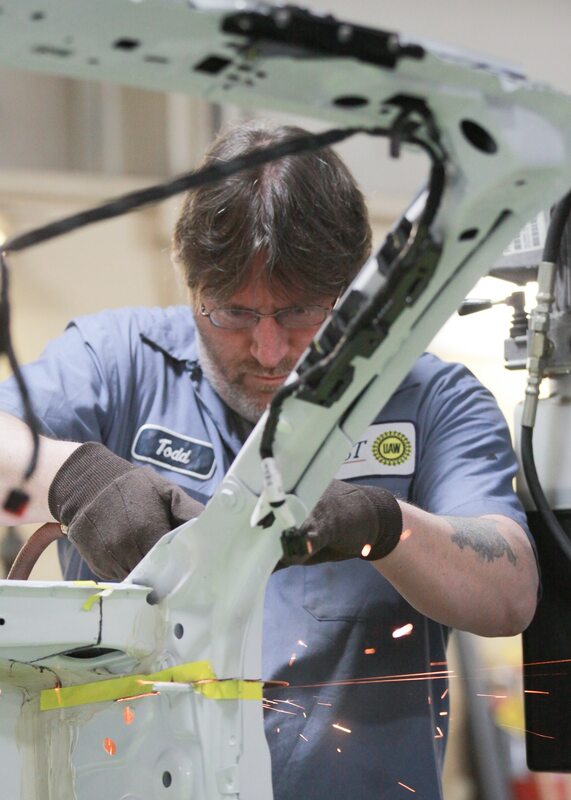 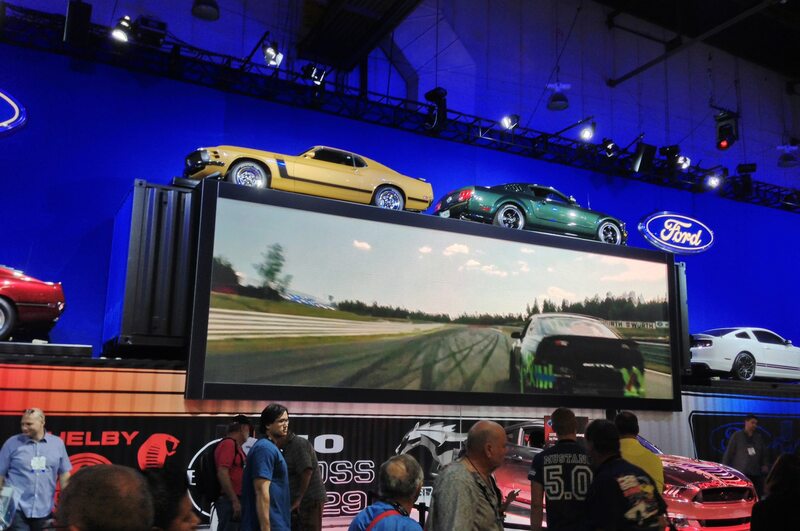 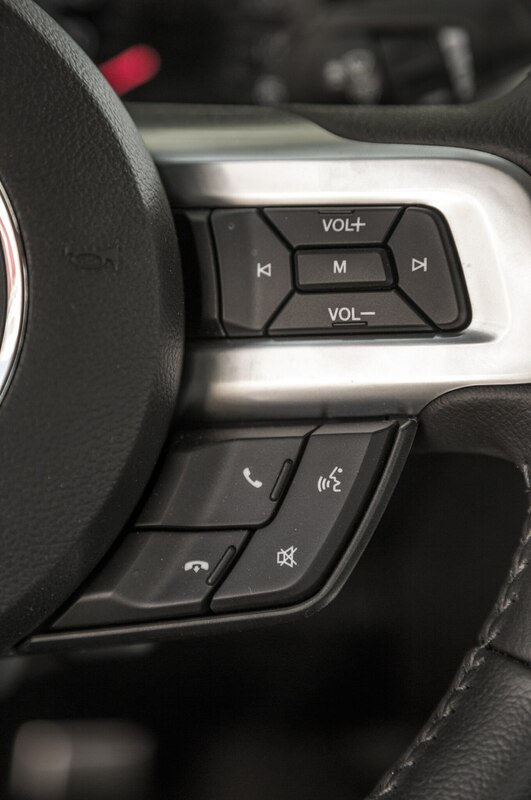 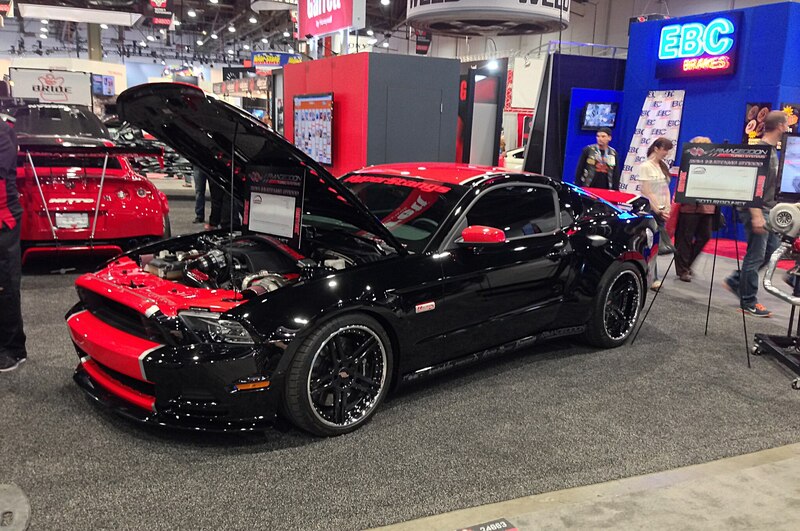 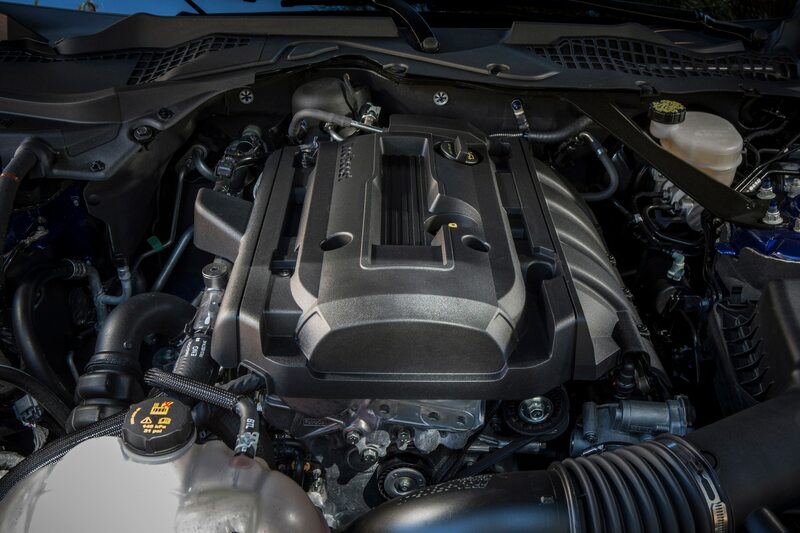 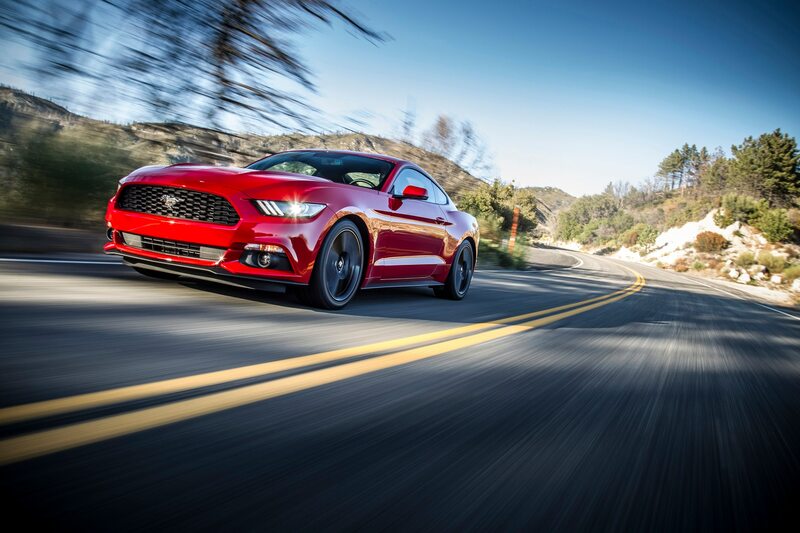 The volume sellers are bound to be models featuring a capable 300-horsepower V-6 or the more fuel-efficient EcoBoost inline-four (which actually makes 310 horsepower, thanks largely to turbocharging). 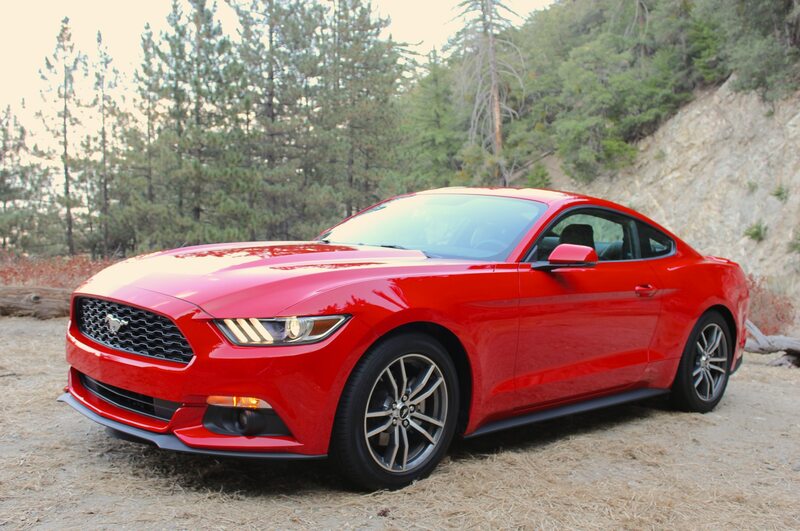 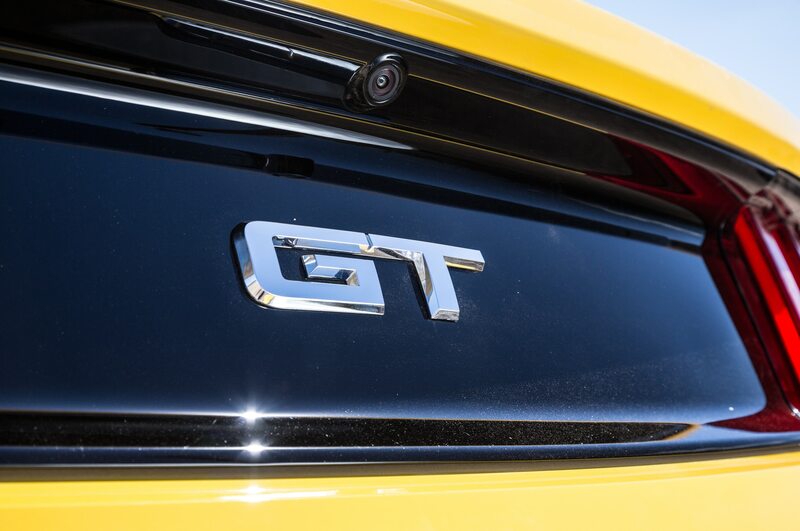 But buyers who can afford it will opt for a Ford Mustang GT, whose V-8 is now rated at 435 horsepower and 400 lb-ft of torque. 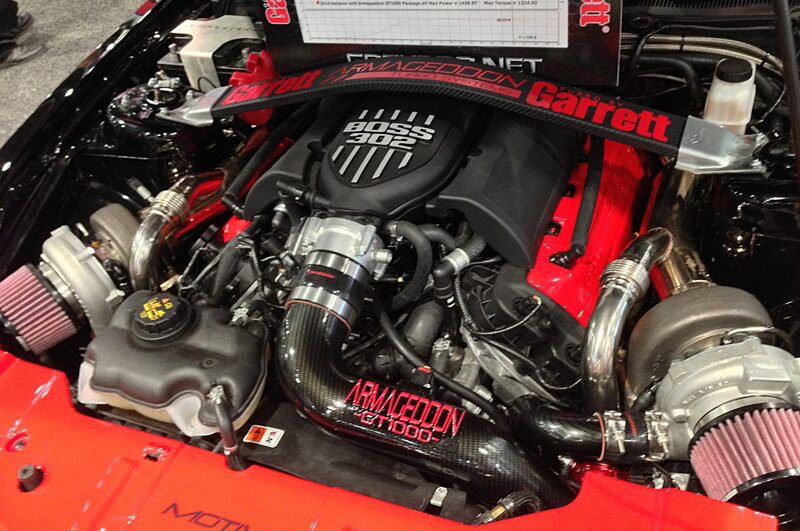 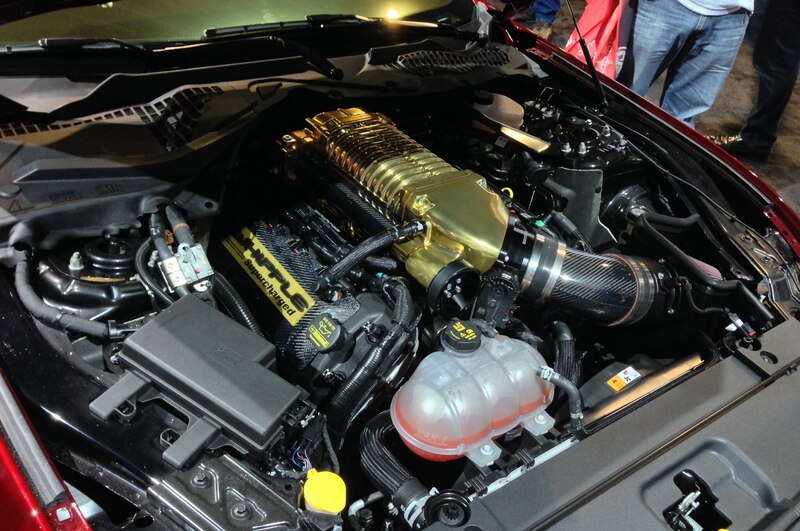 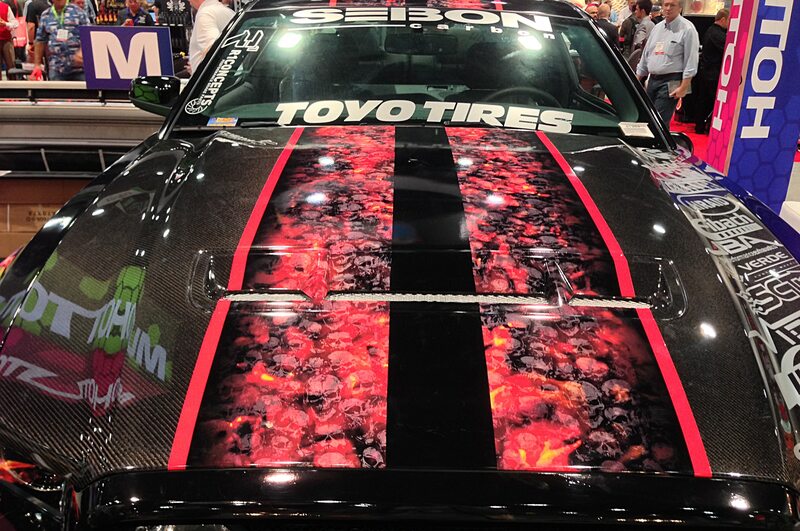 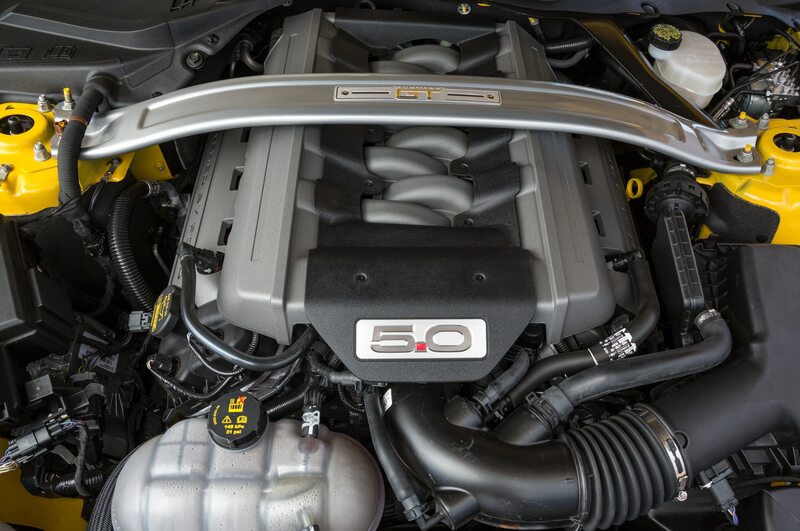 Although it displaces 302 cubic inches, this isn’t the 5.0-liter of yore. 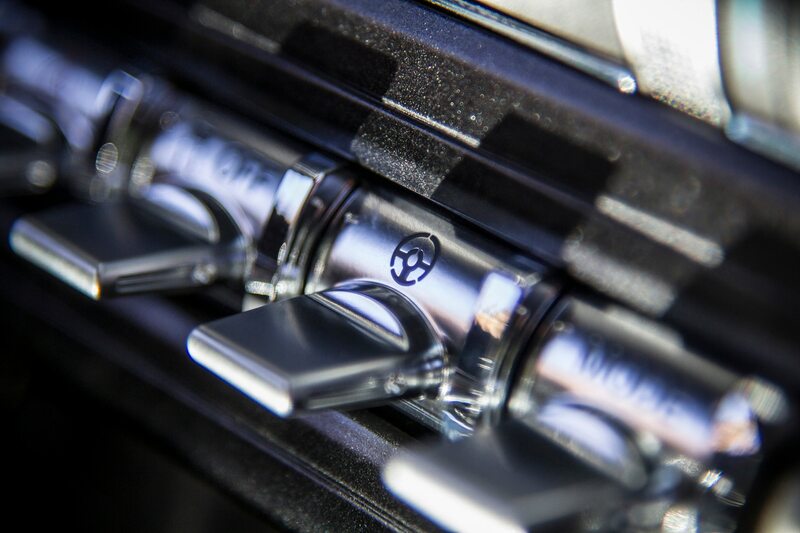 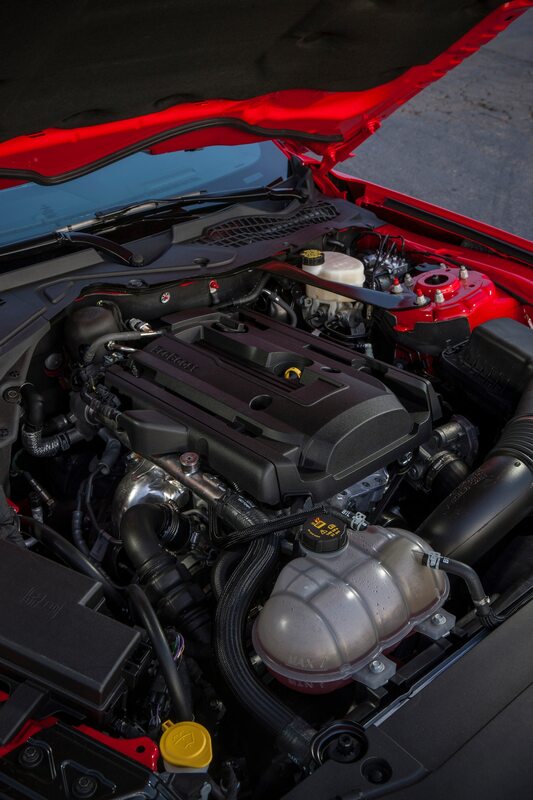 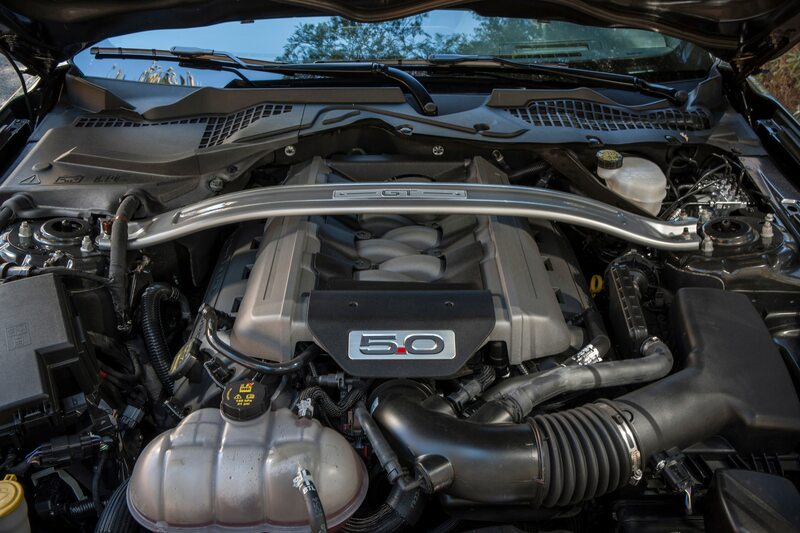 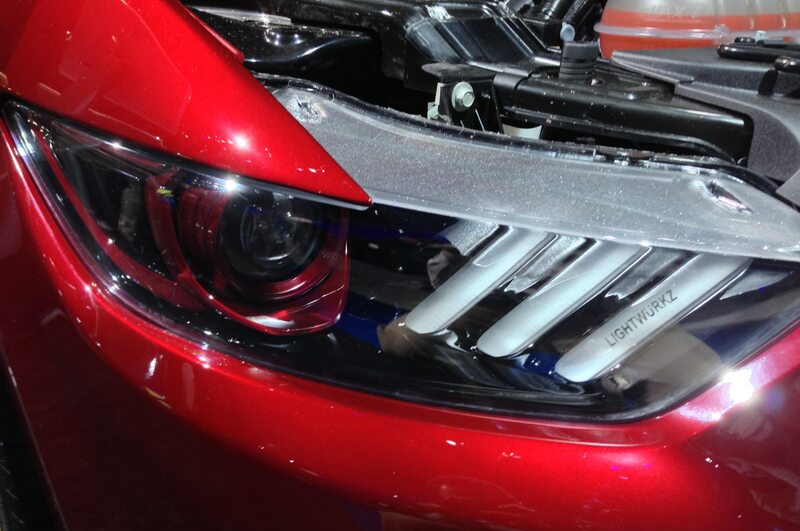 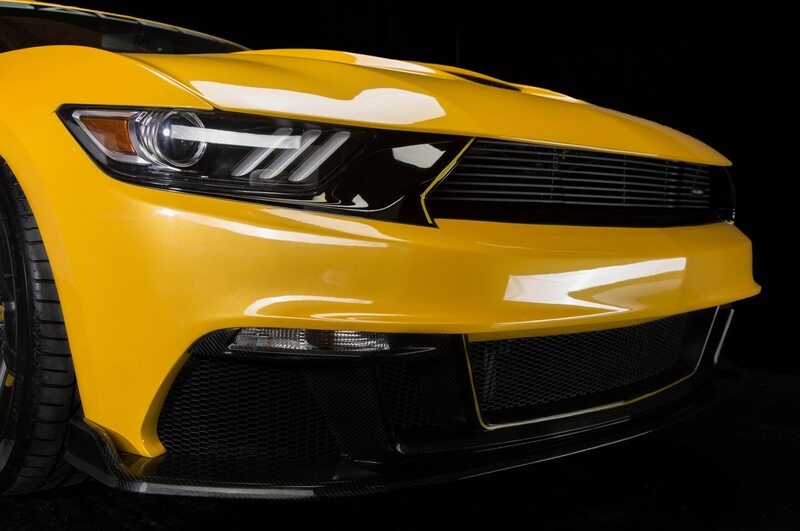 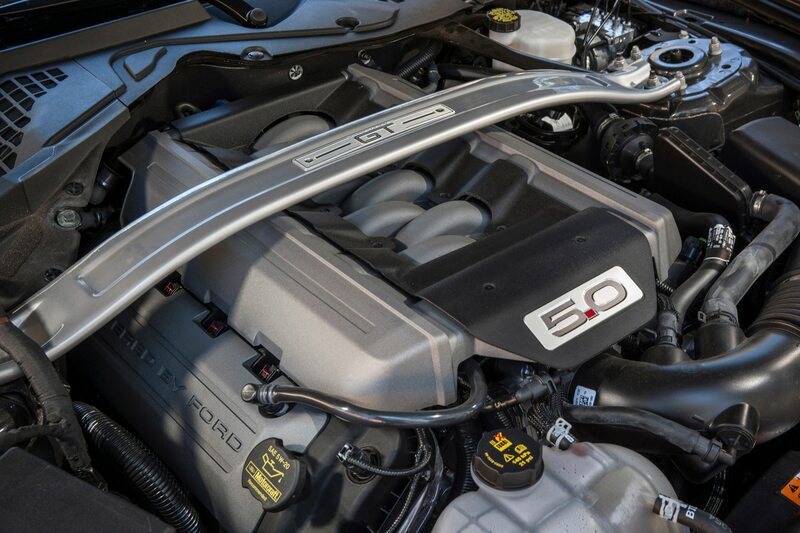 It’s a new iteration of the all-aluminum, four-cam Coyote engine, and it’s a sweet piece of work, not only generating serious speed but also making all the right noises. 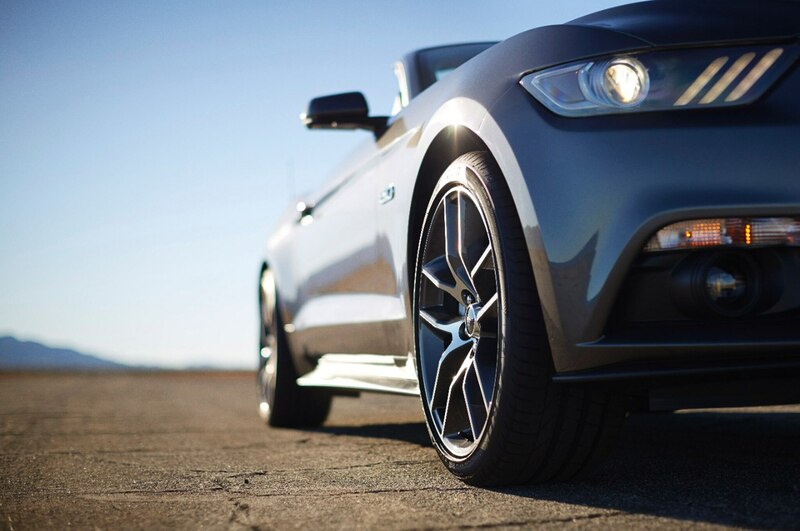 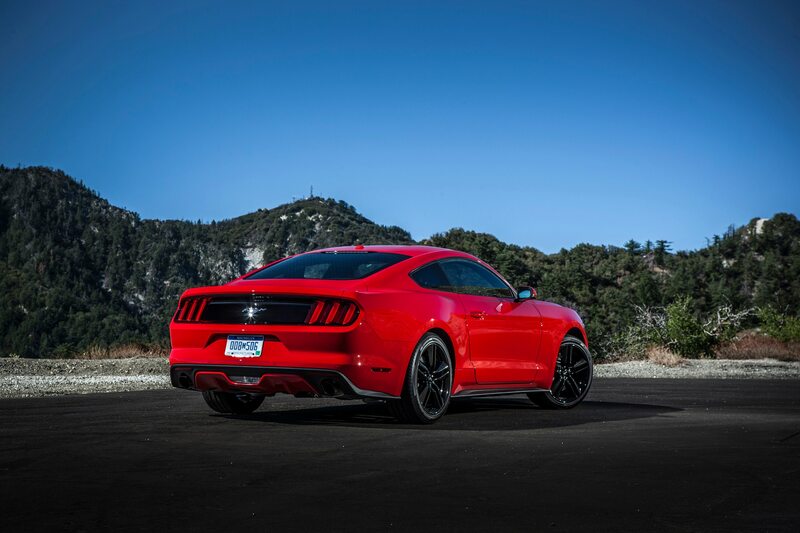 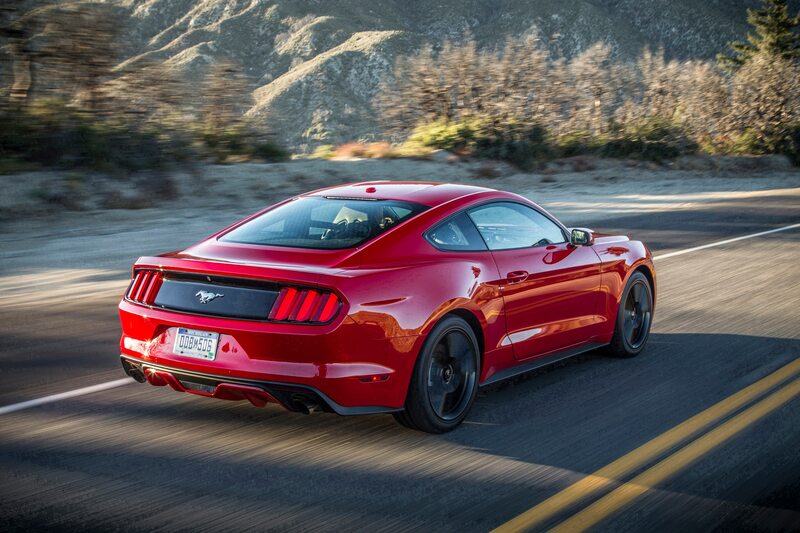 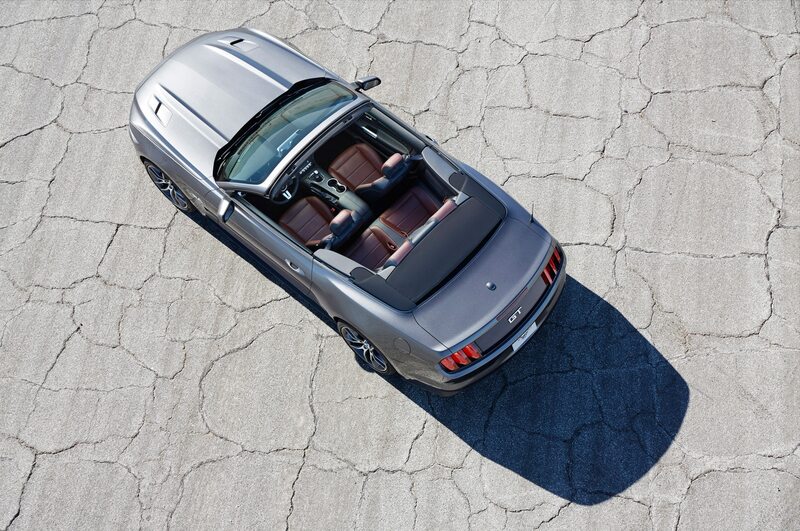 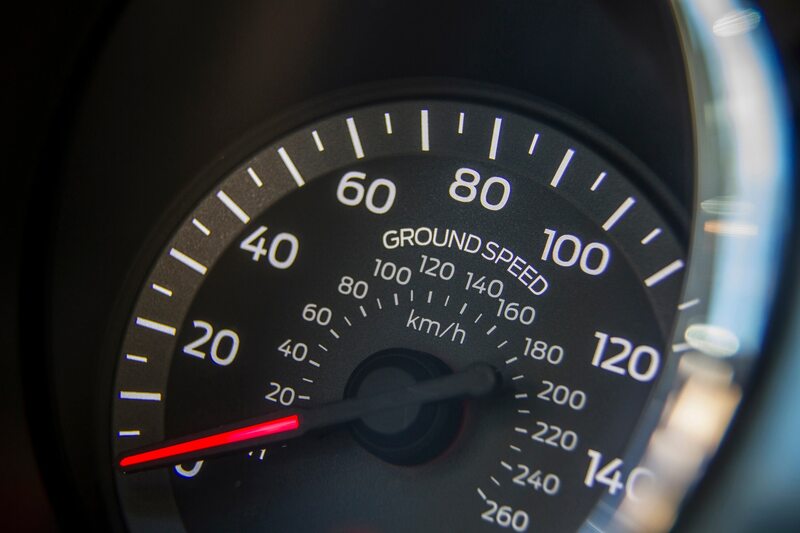 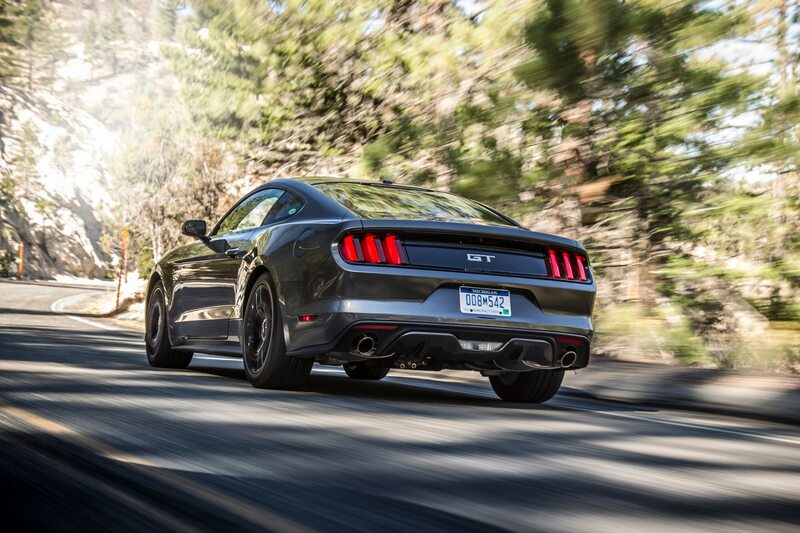 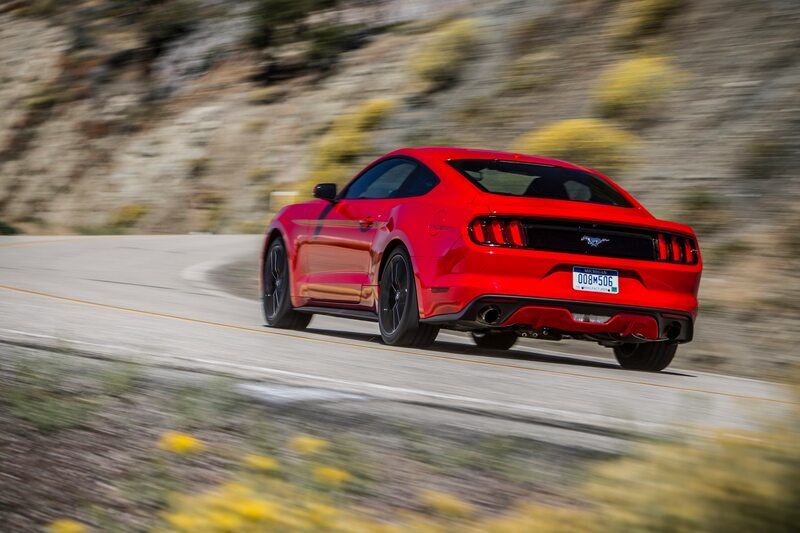 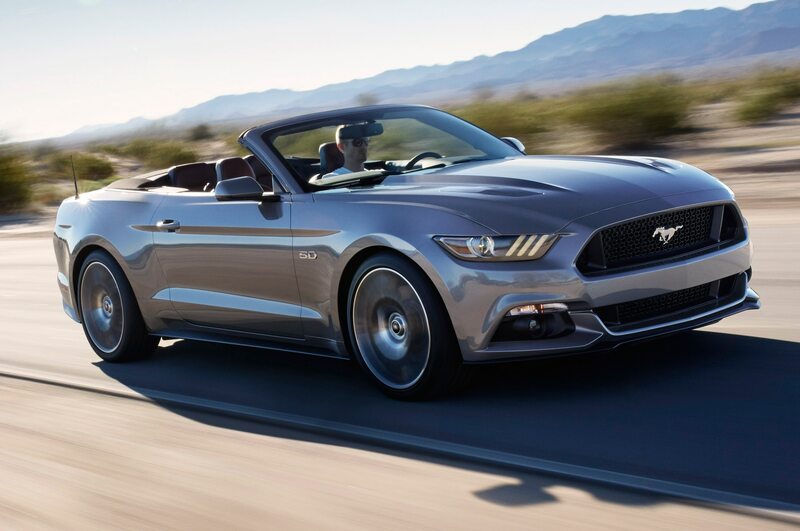 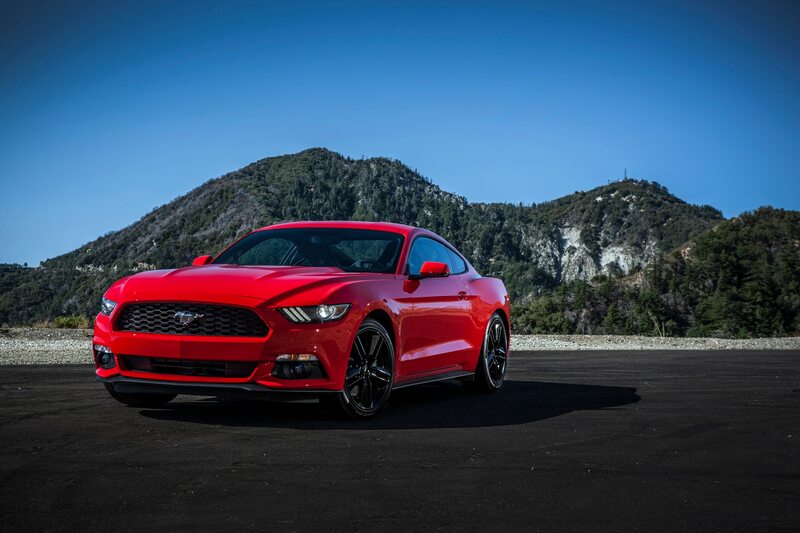 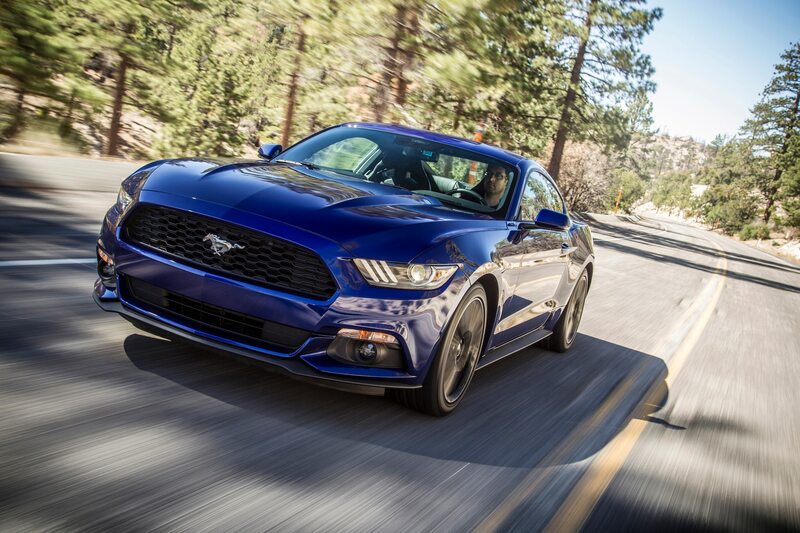 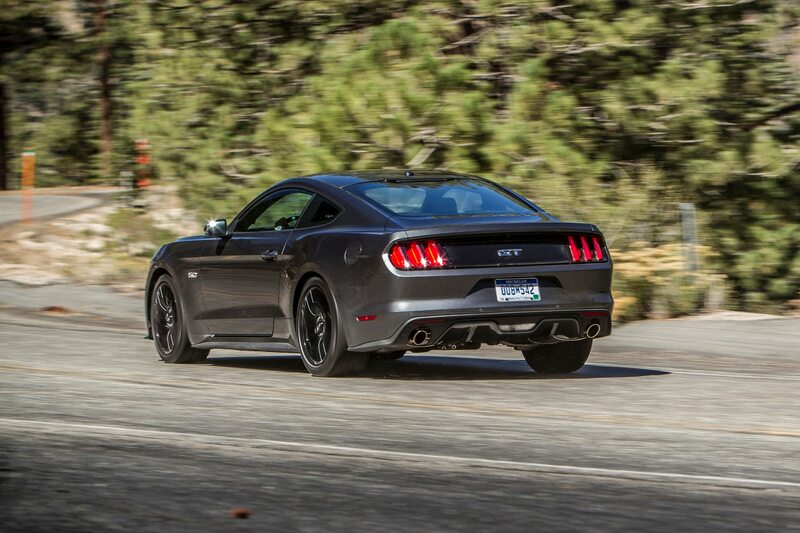 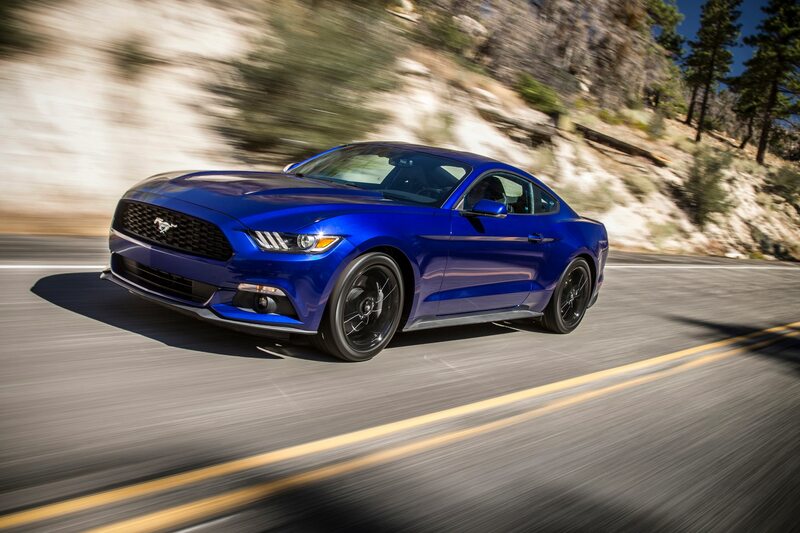 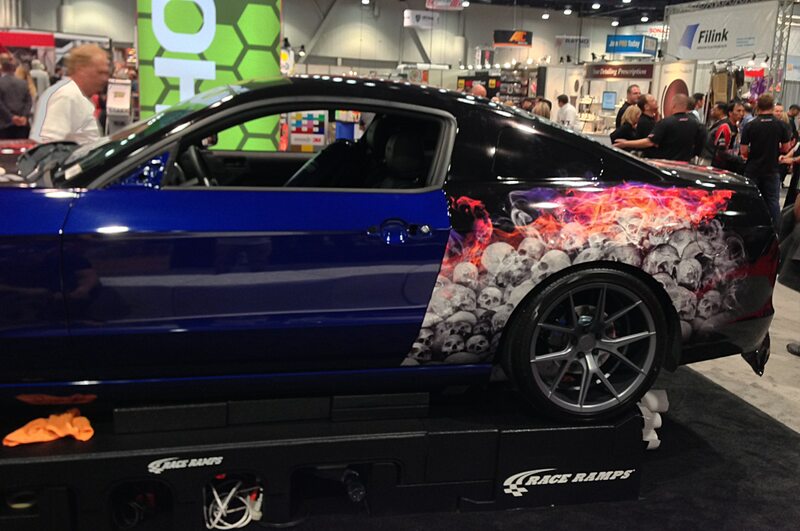 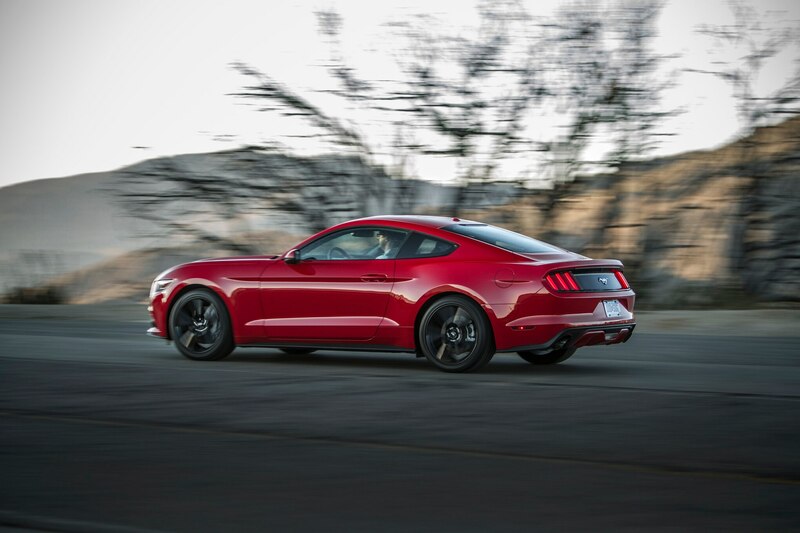 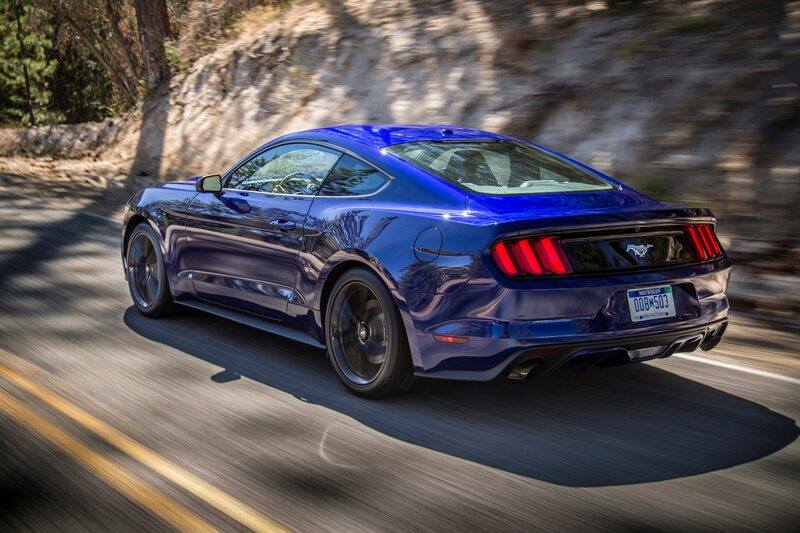 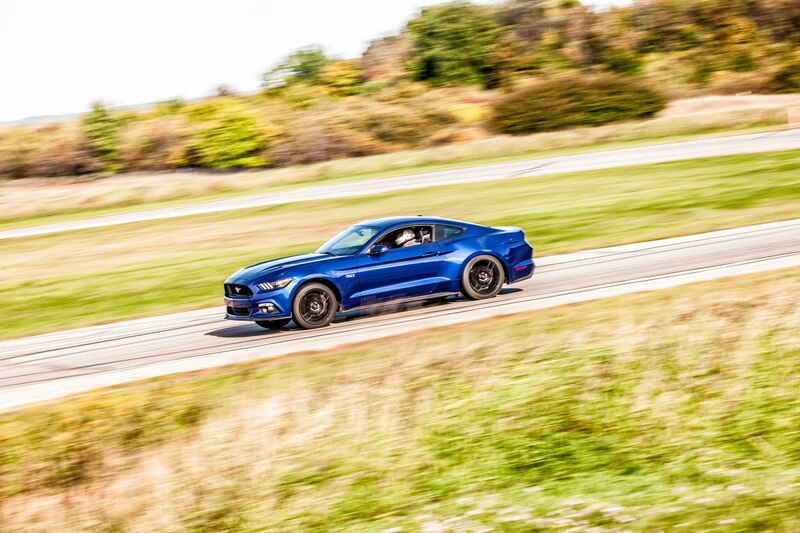 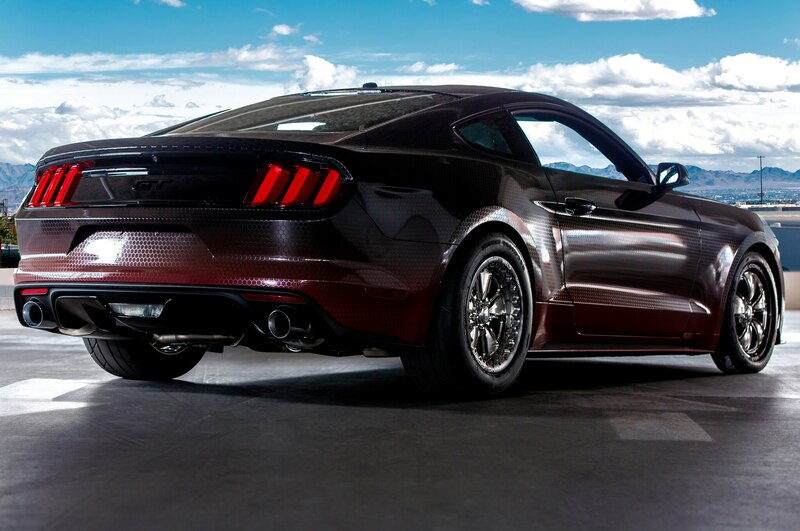 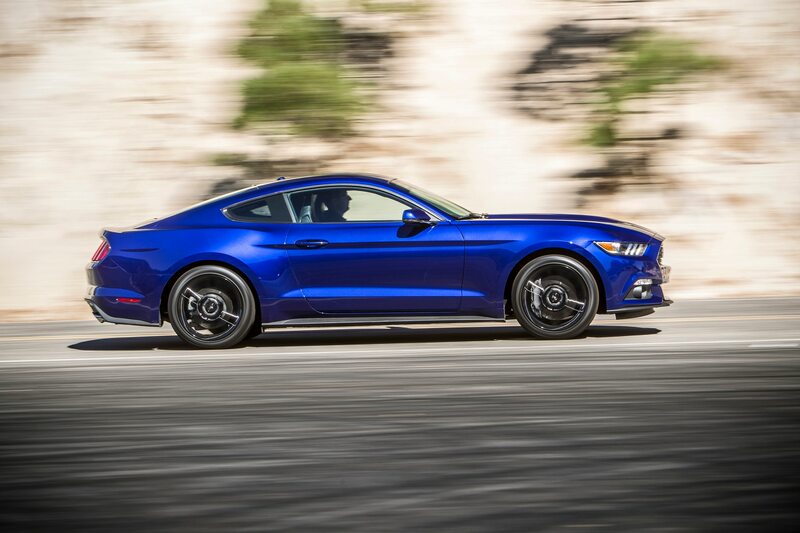 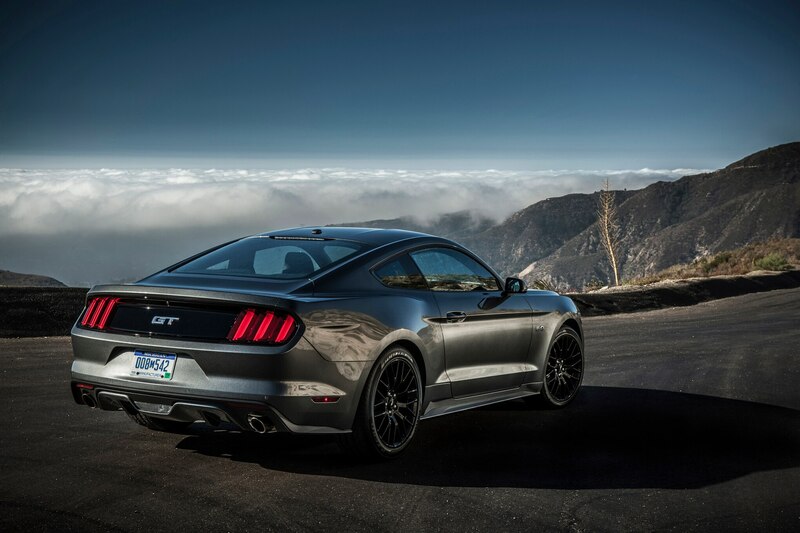 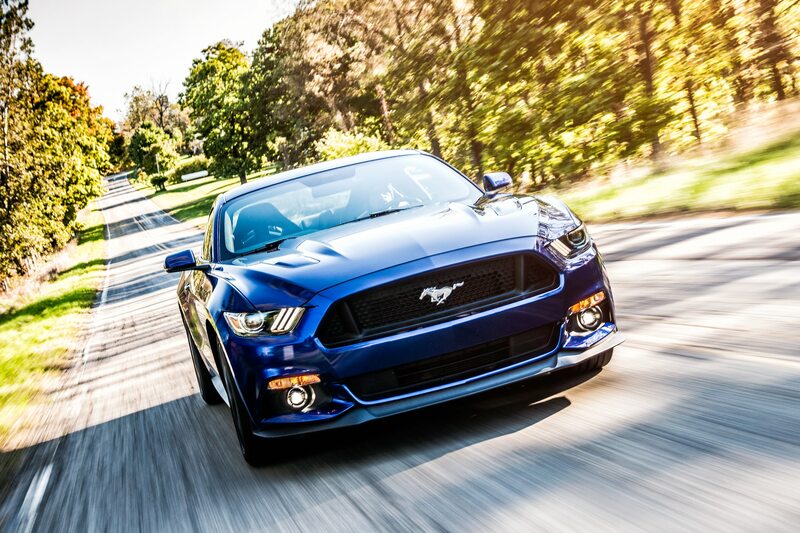 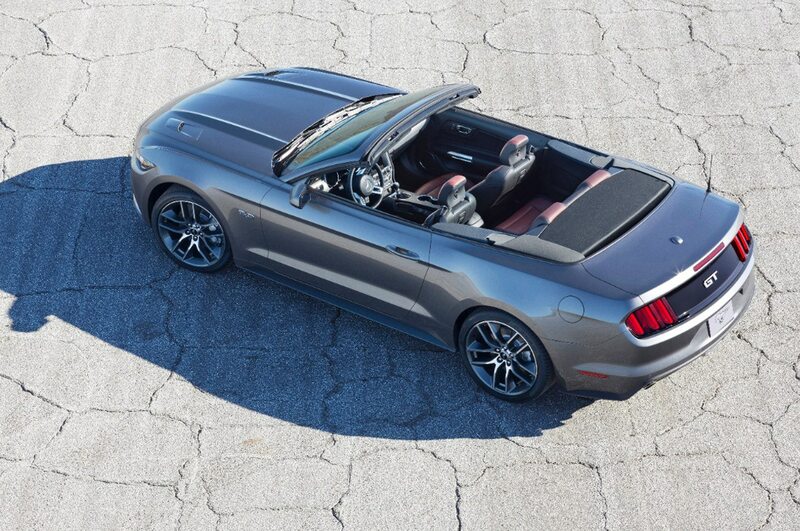 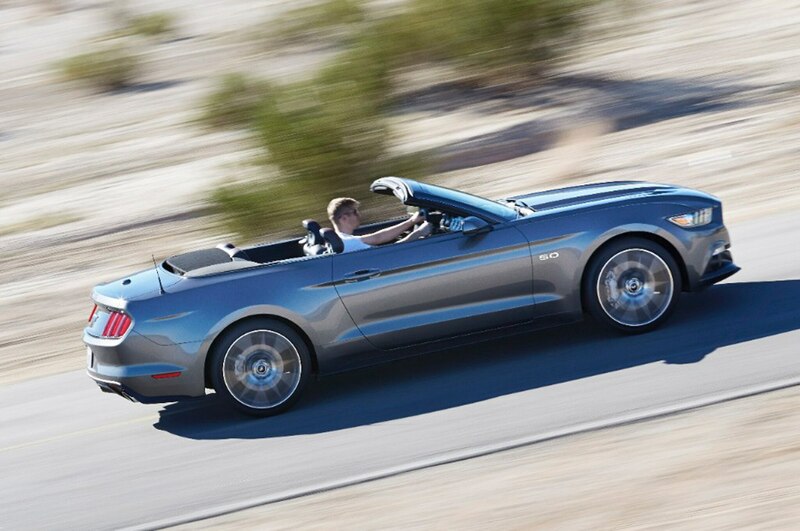 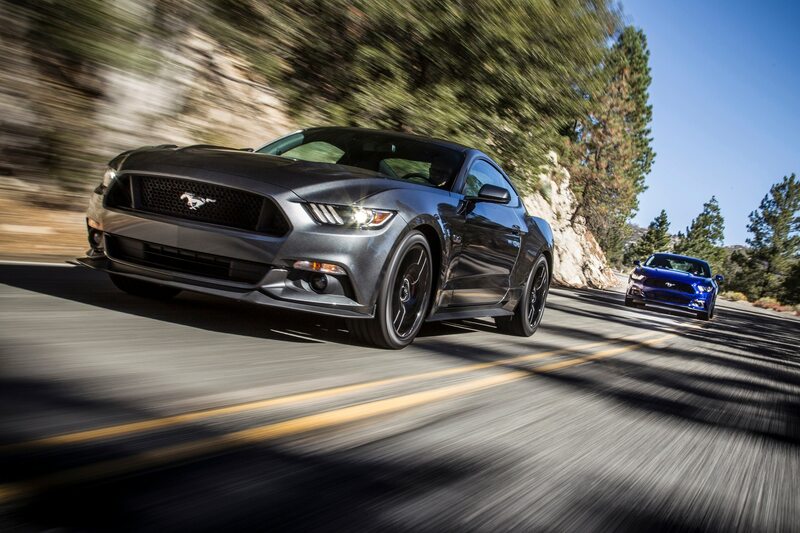 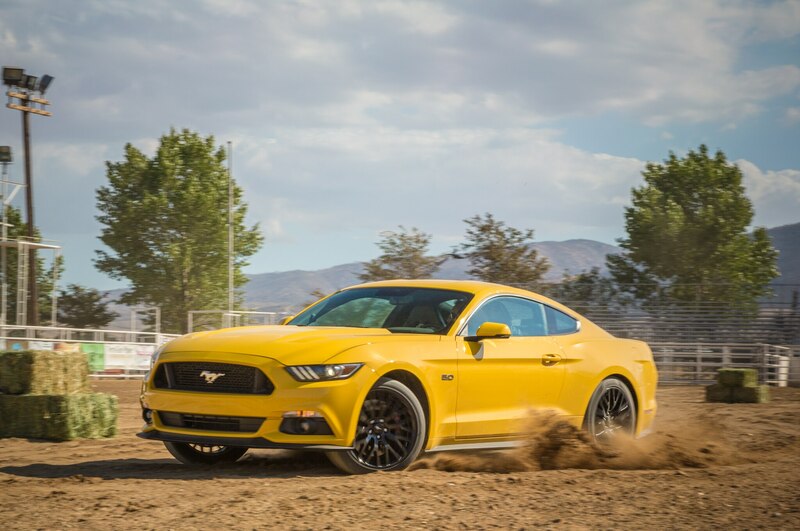 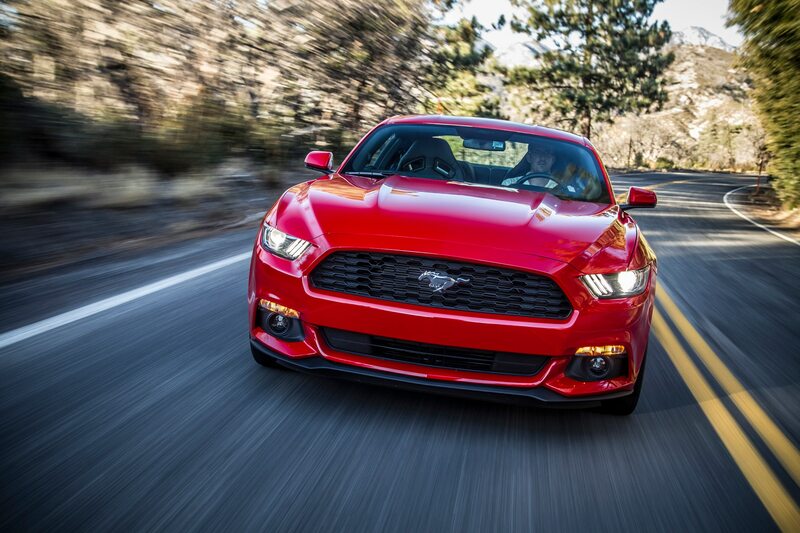 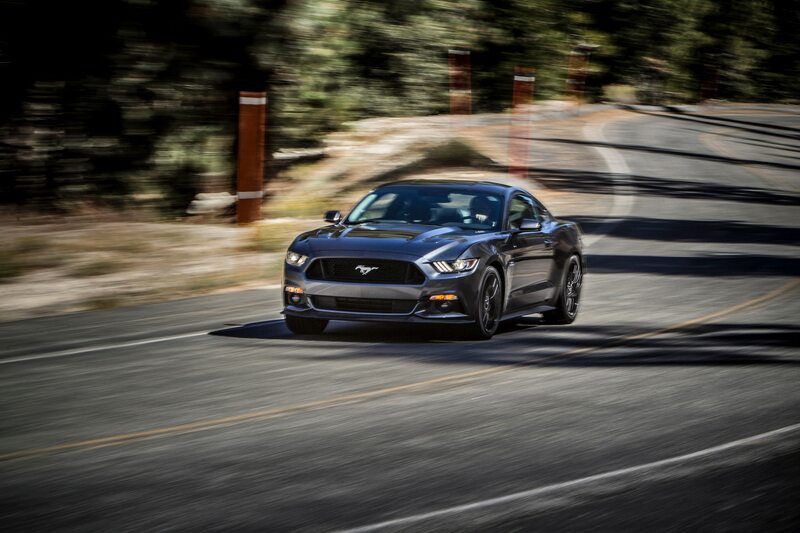 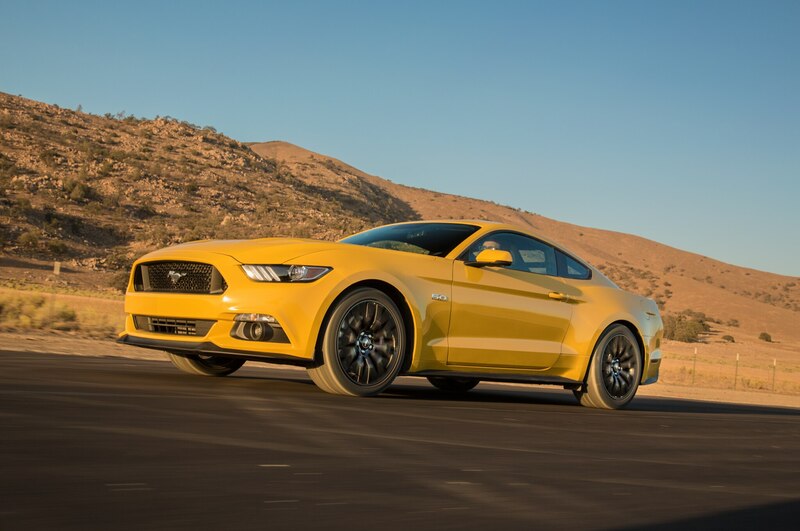 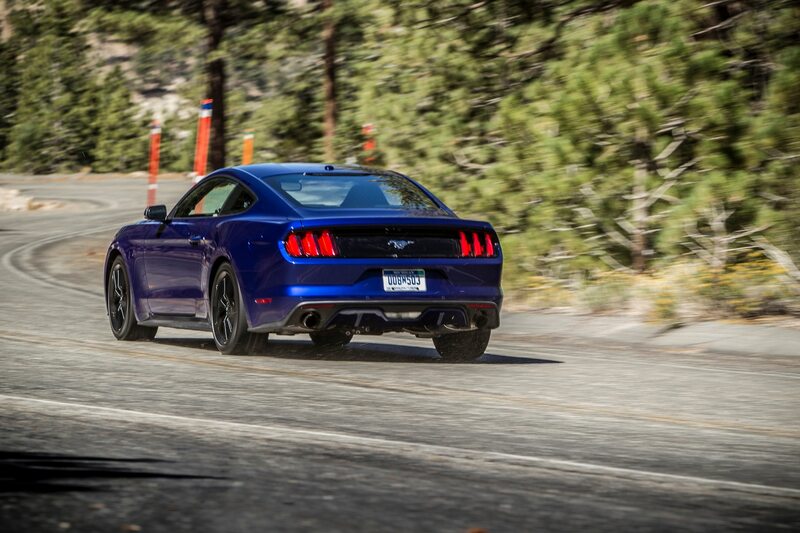 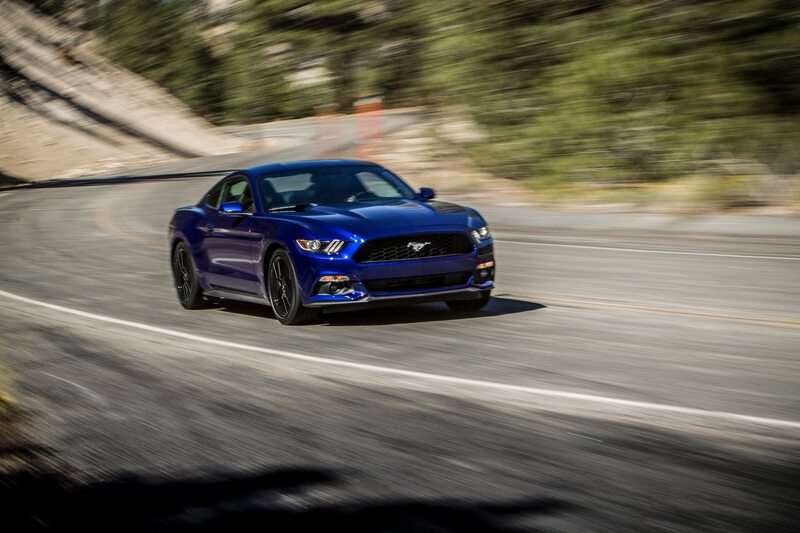 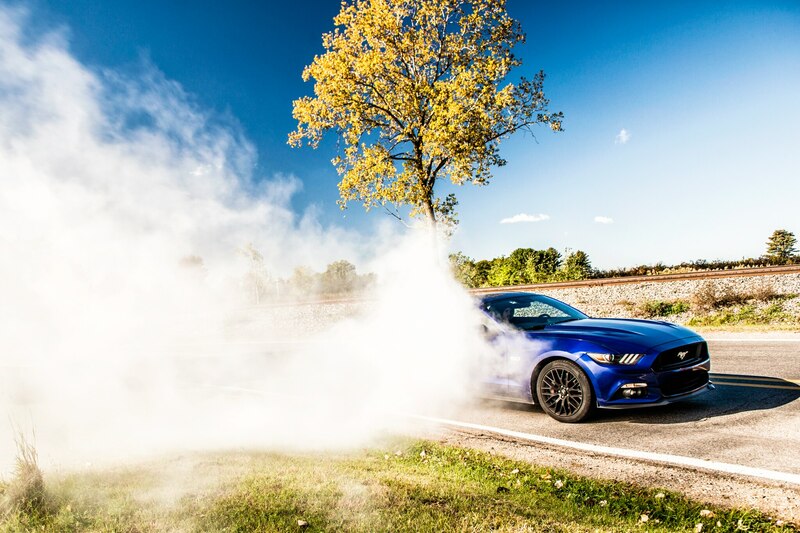 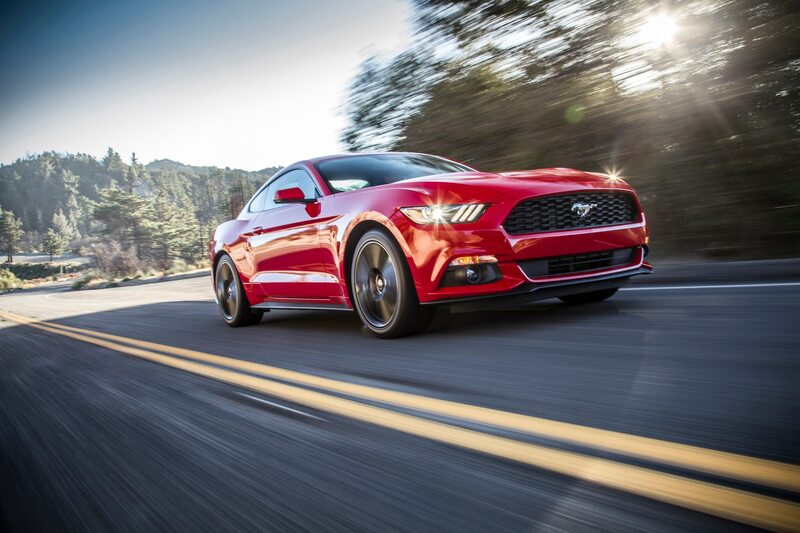 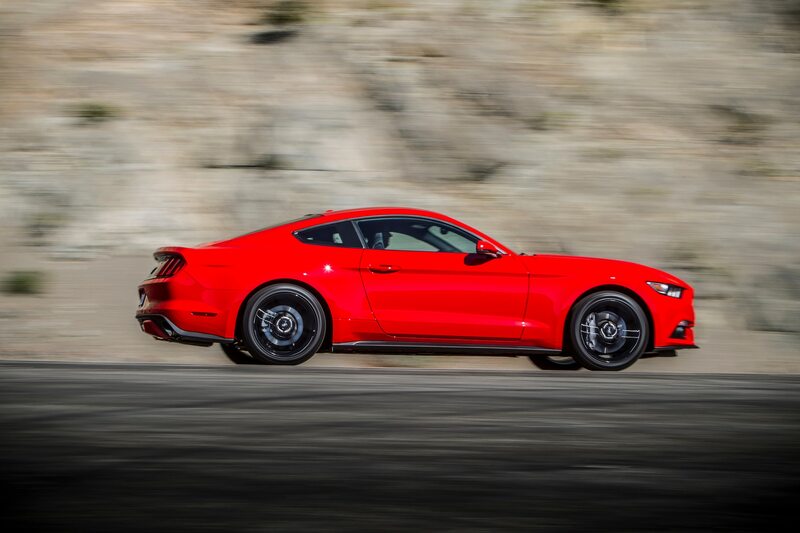 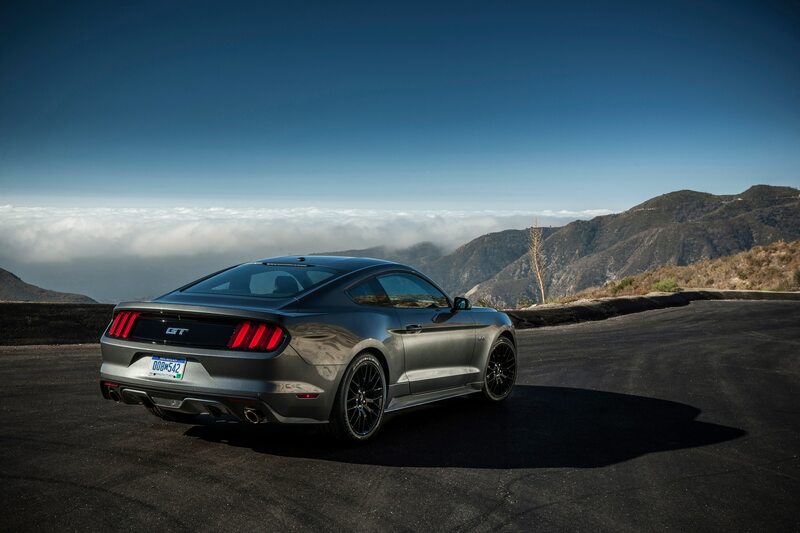 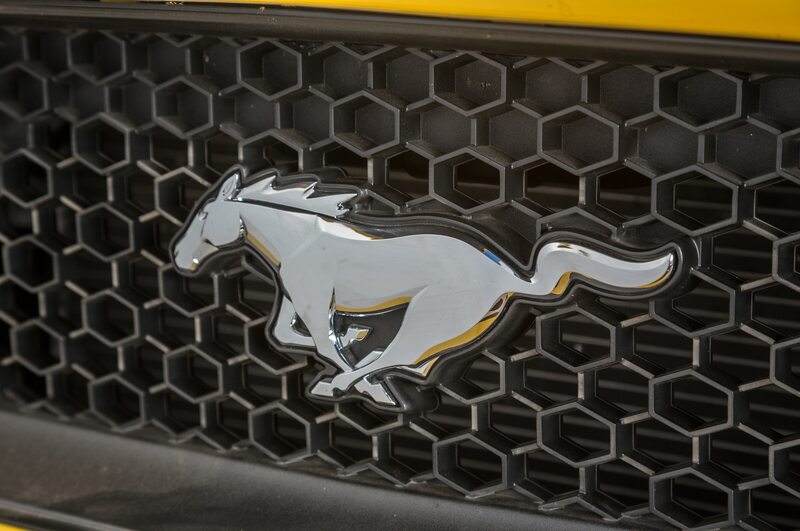 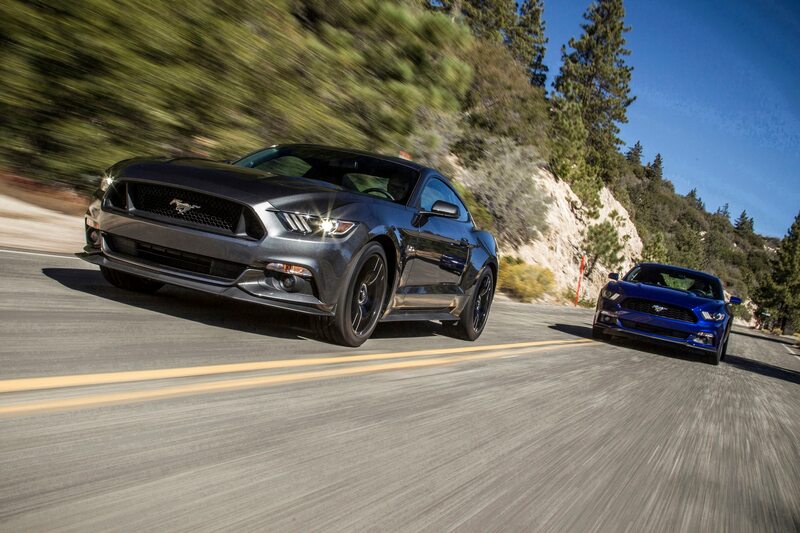 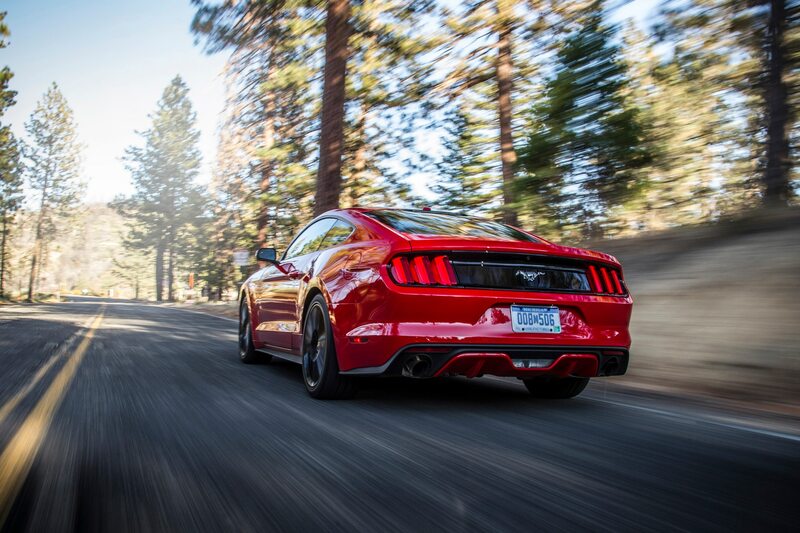 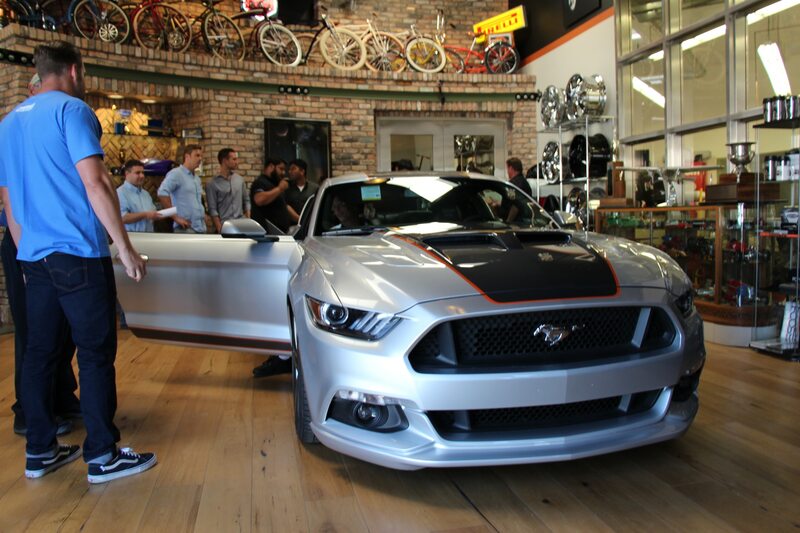 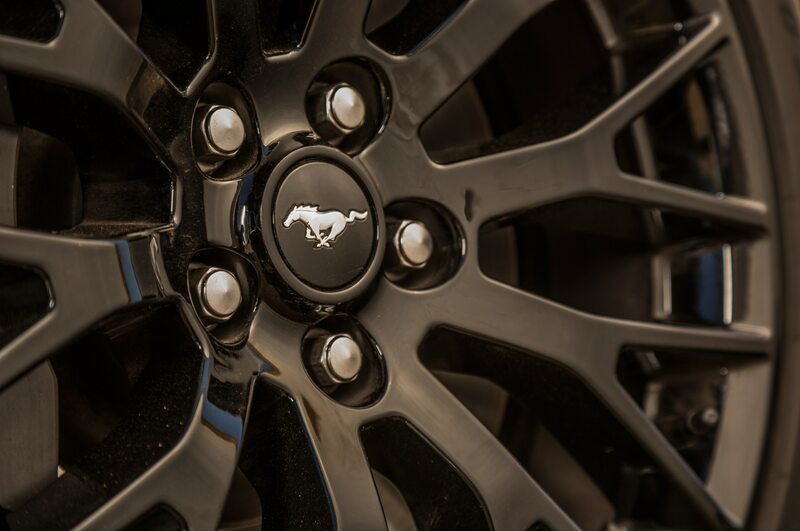 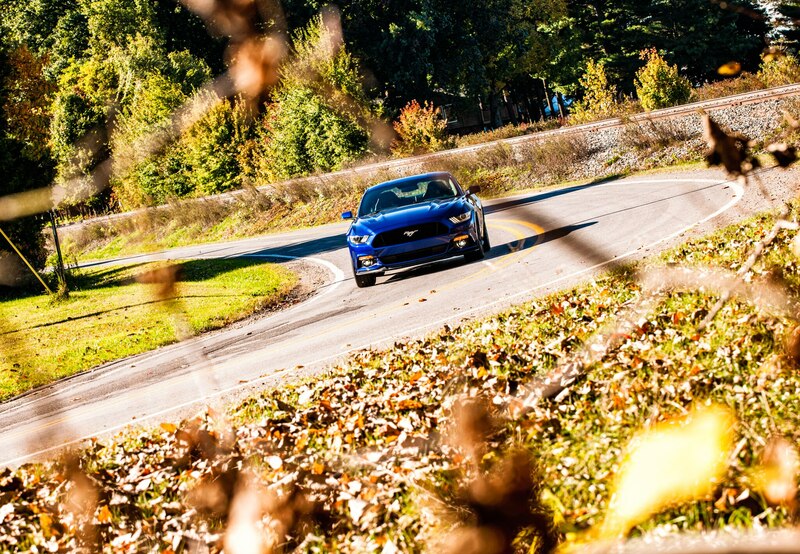 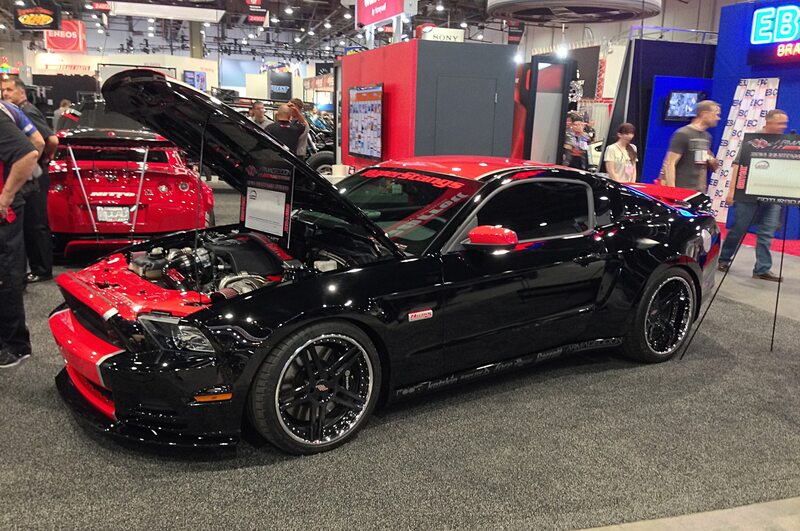 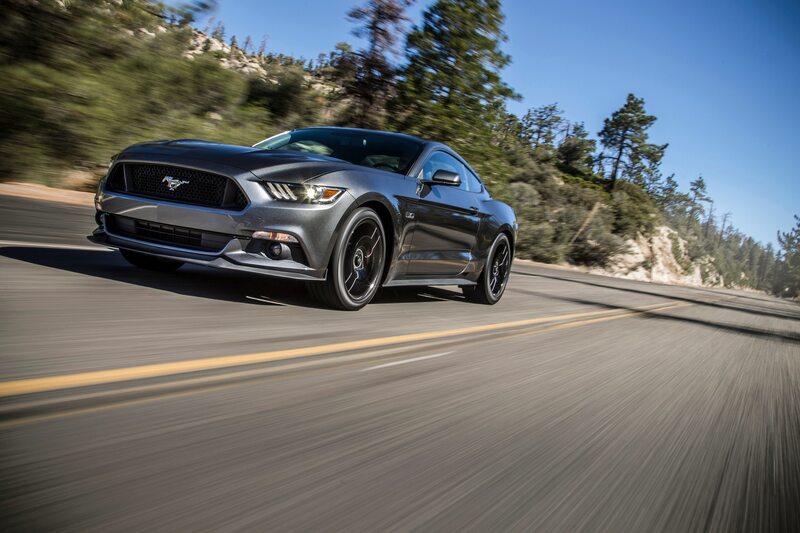 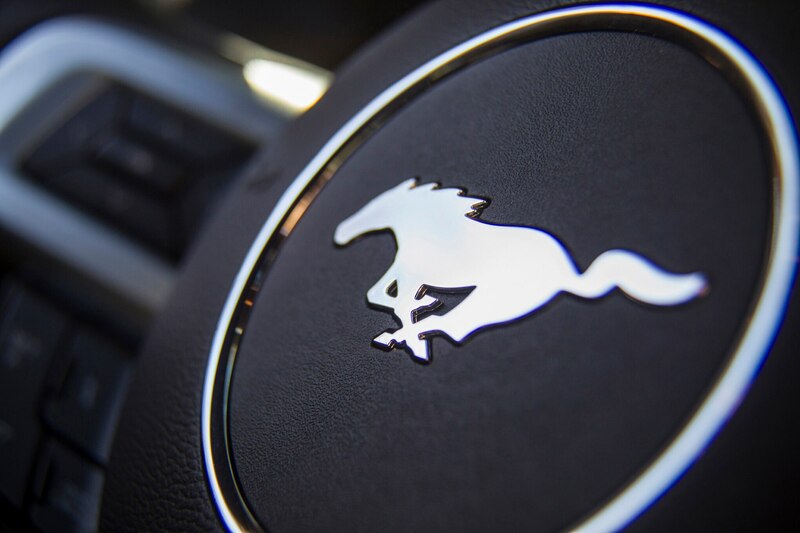 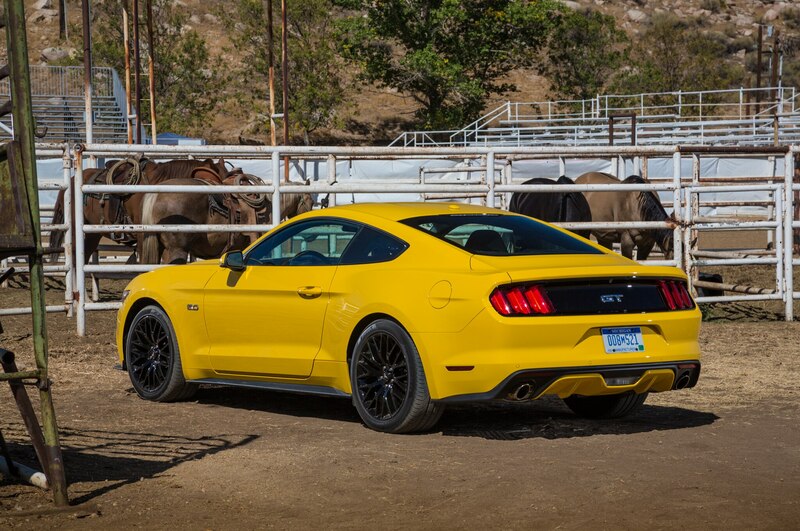 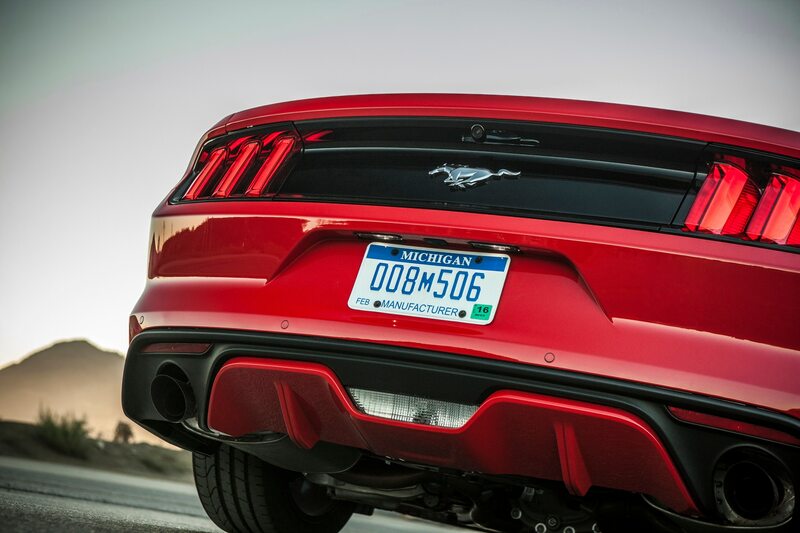 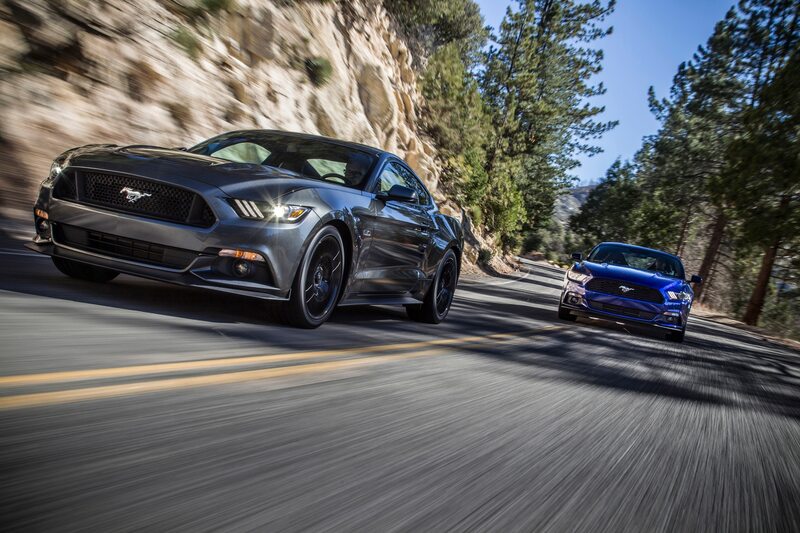 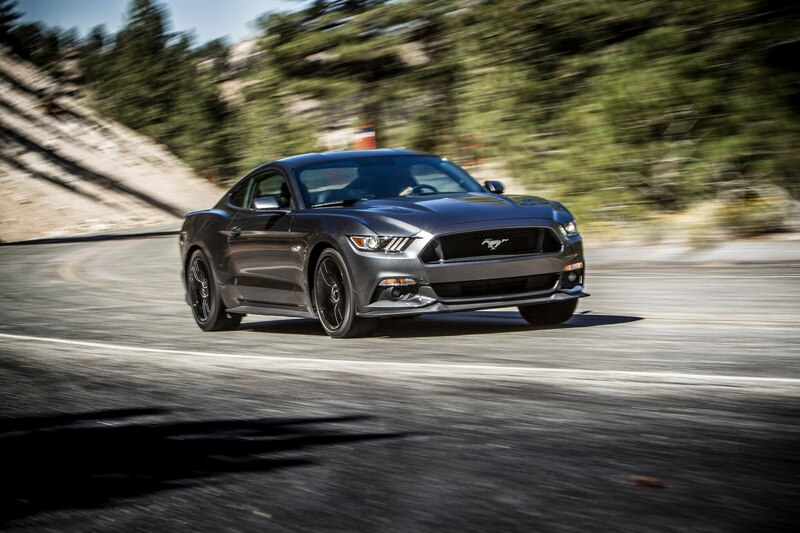 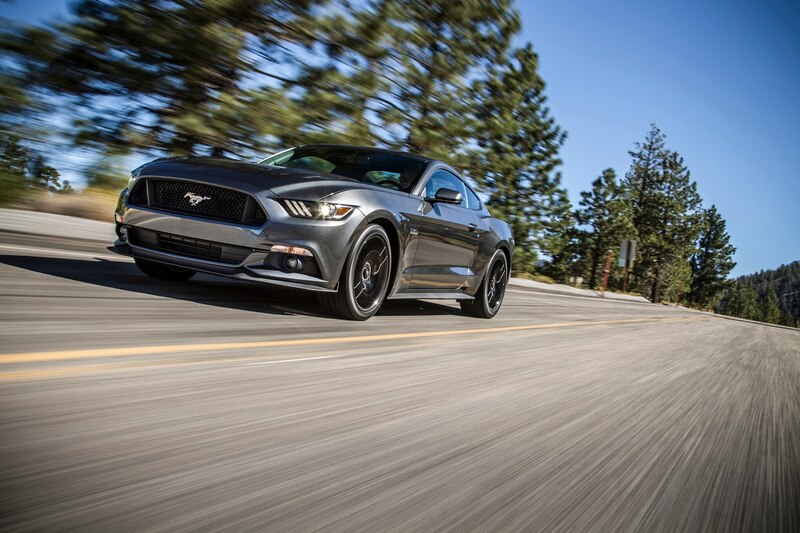 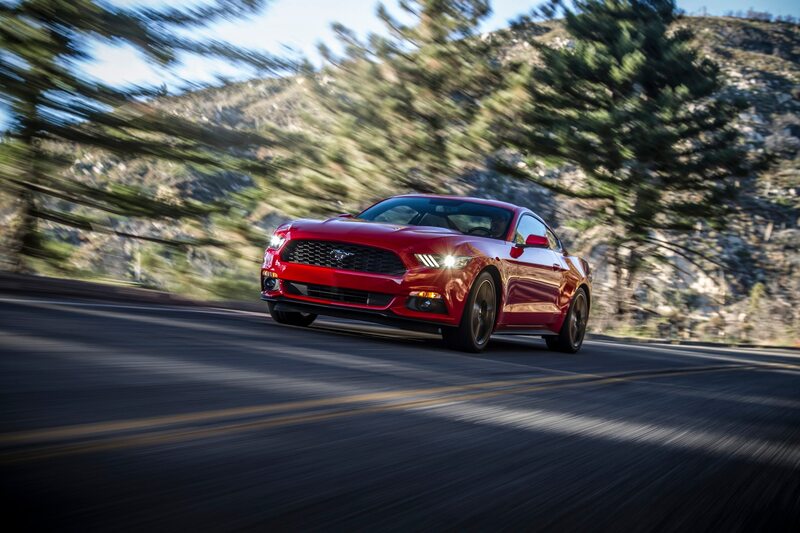 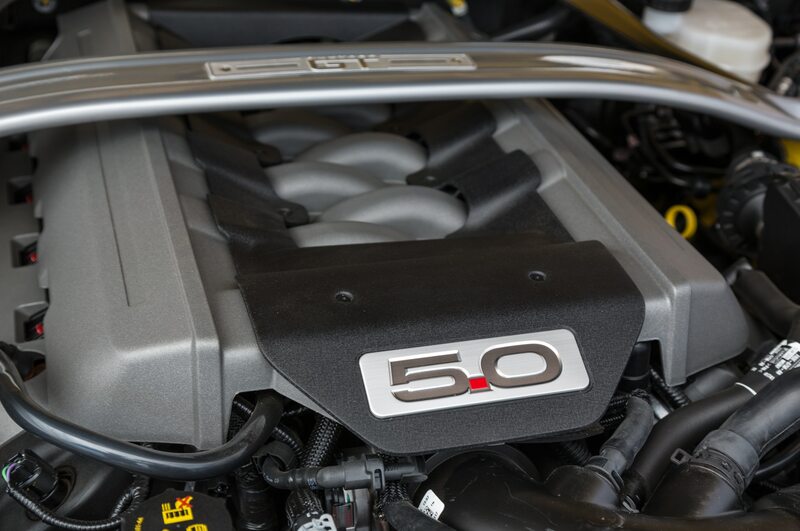 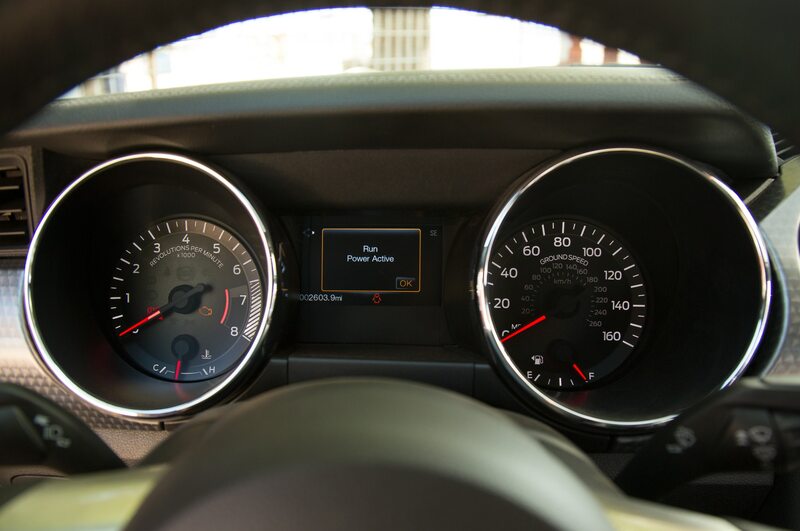 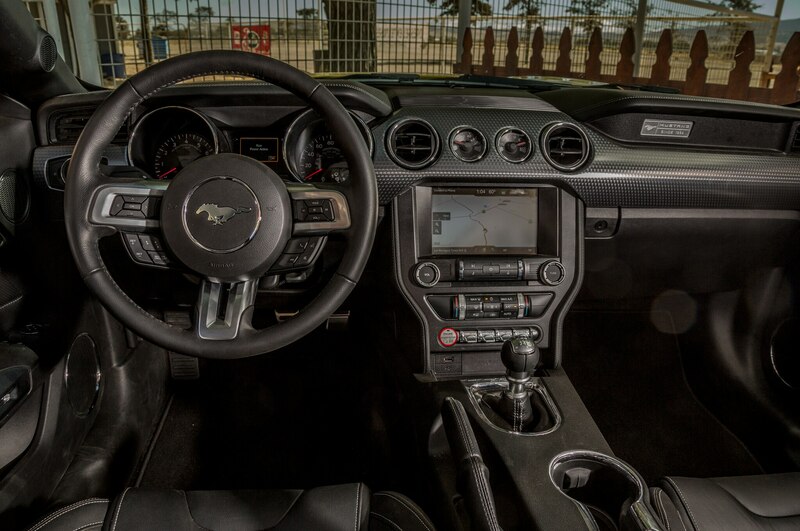 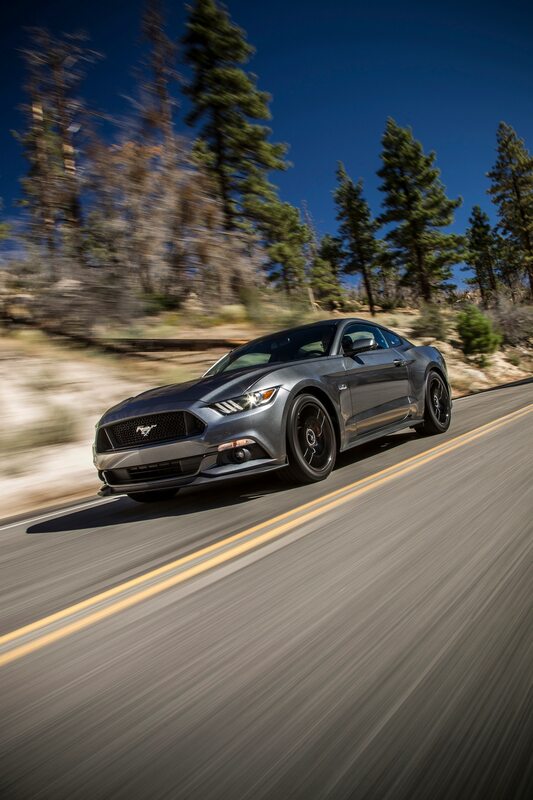 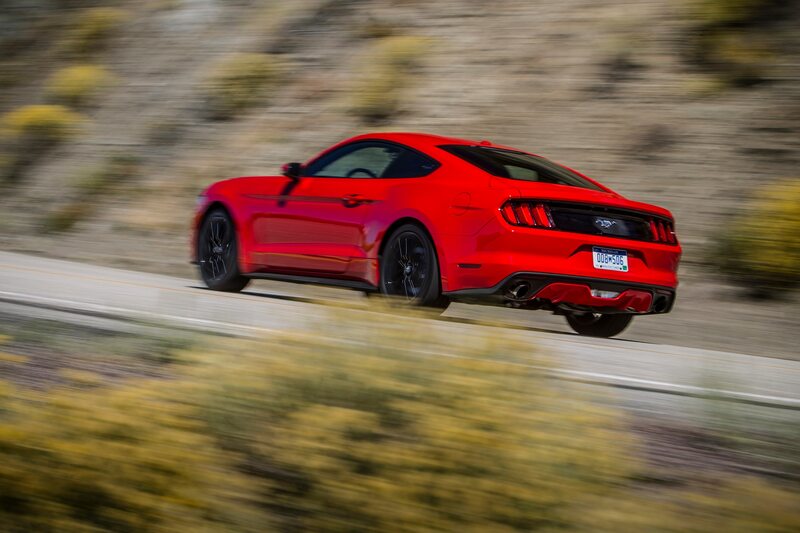 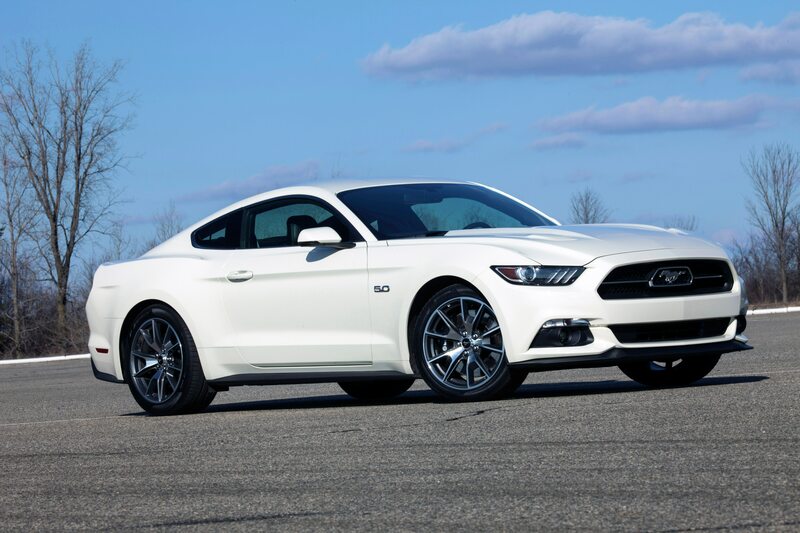 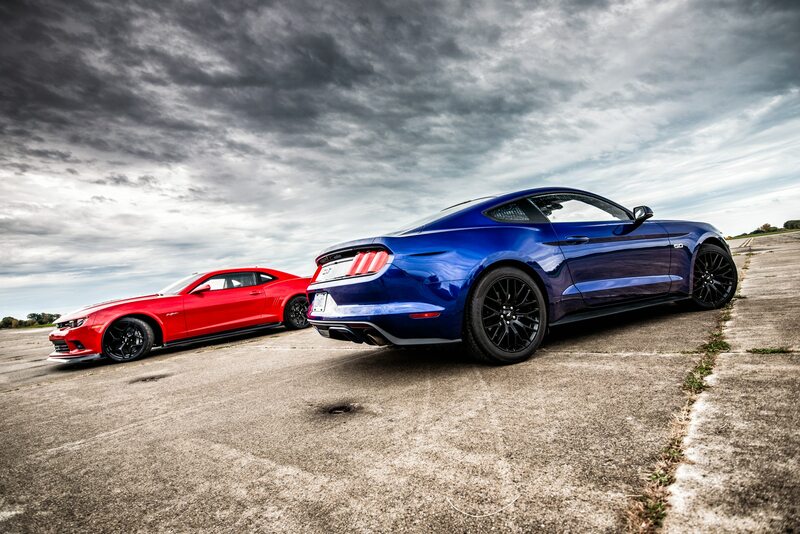 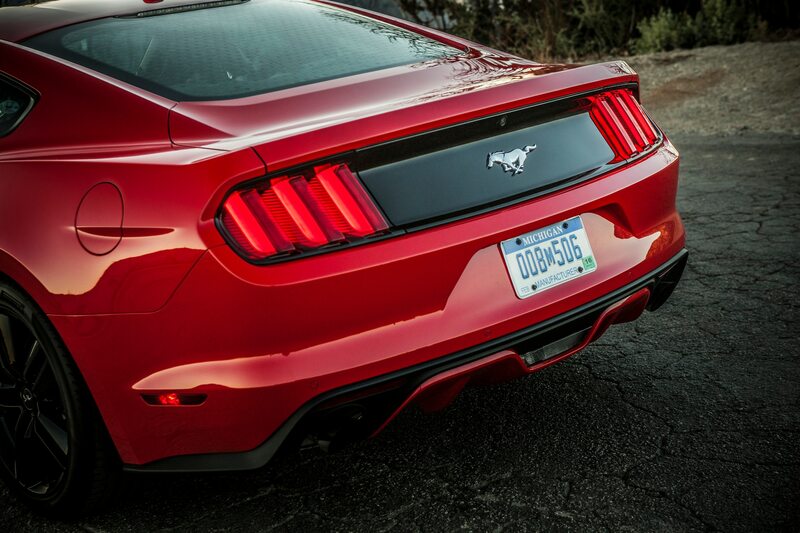 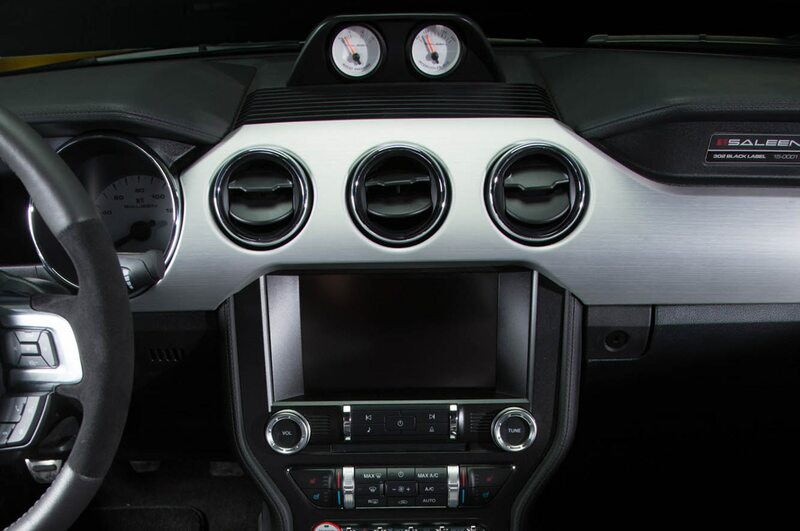 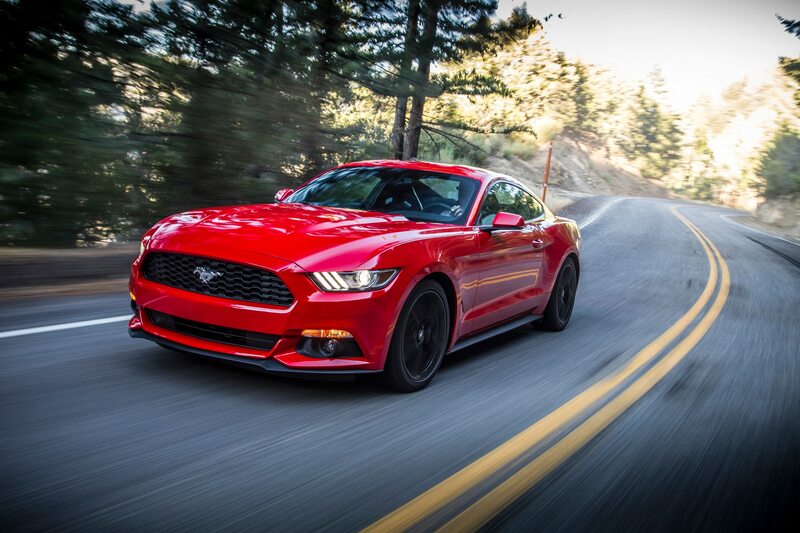 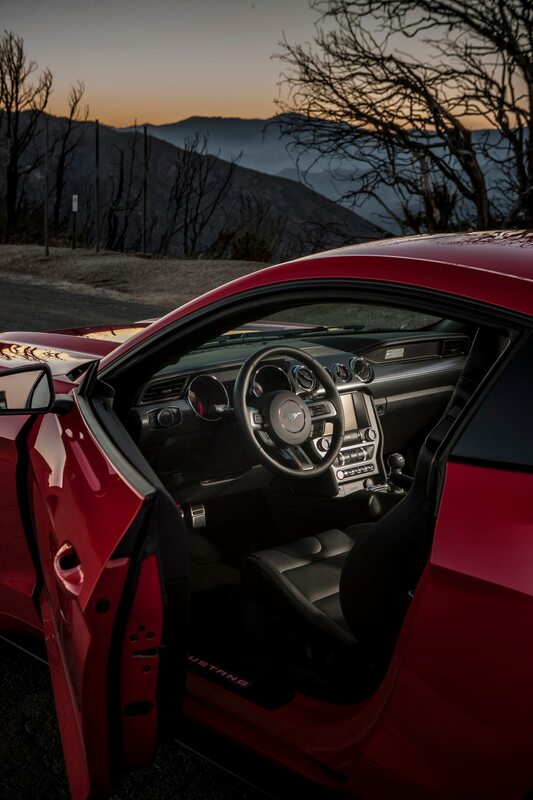 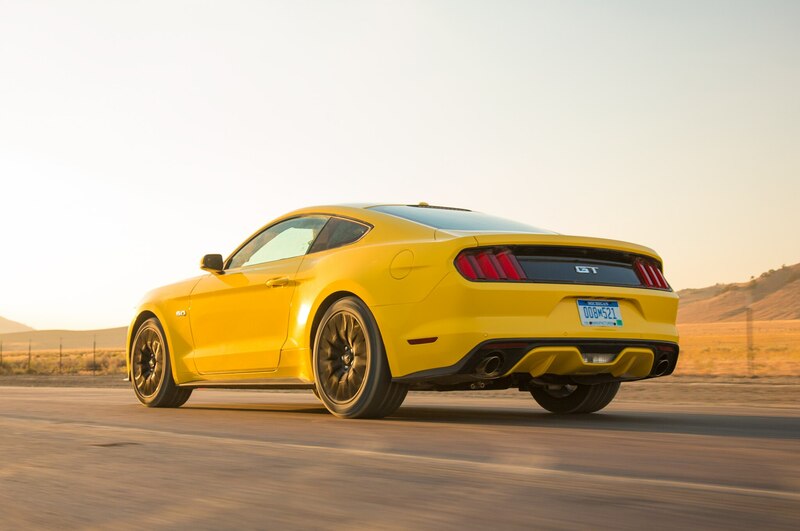 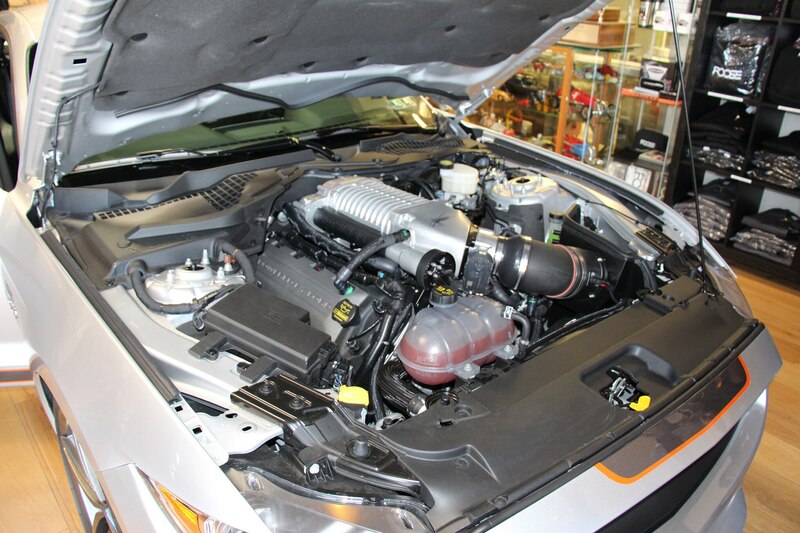 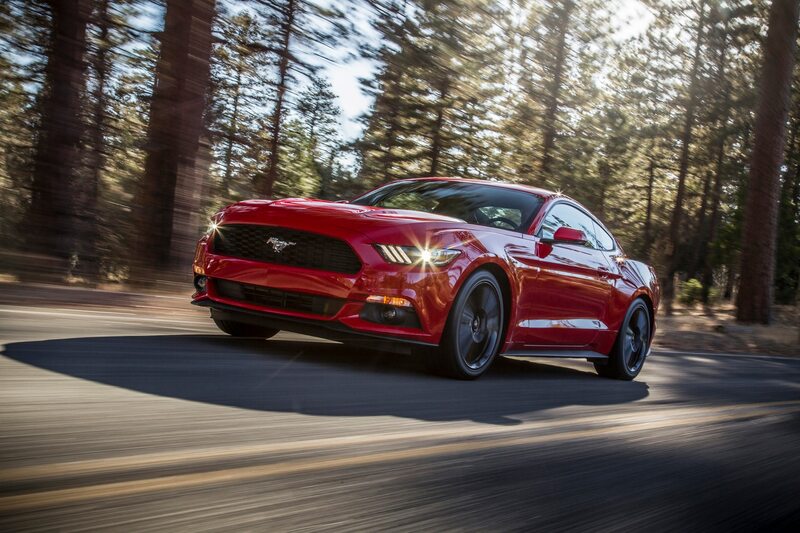 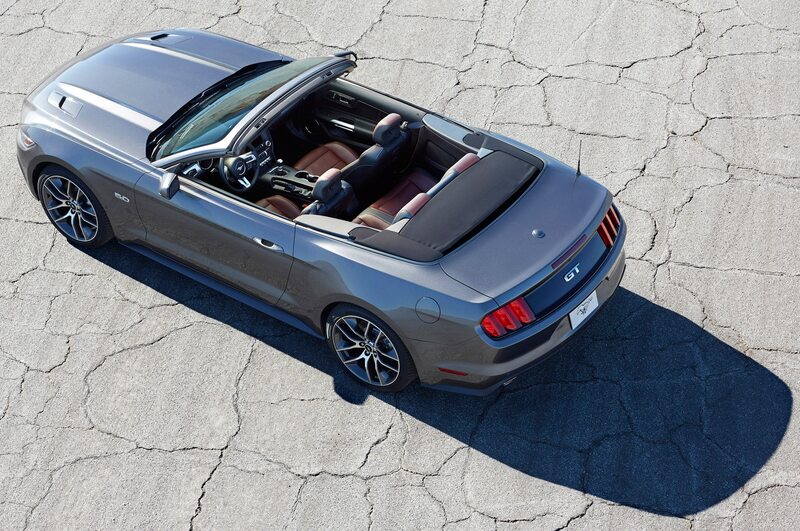 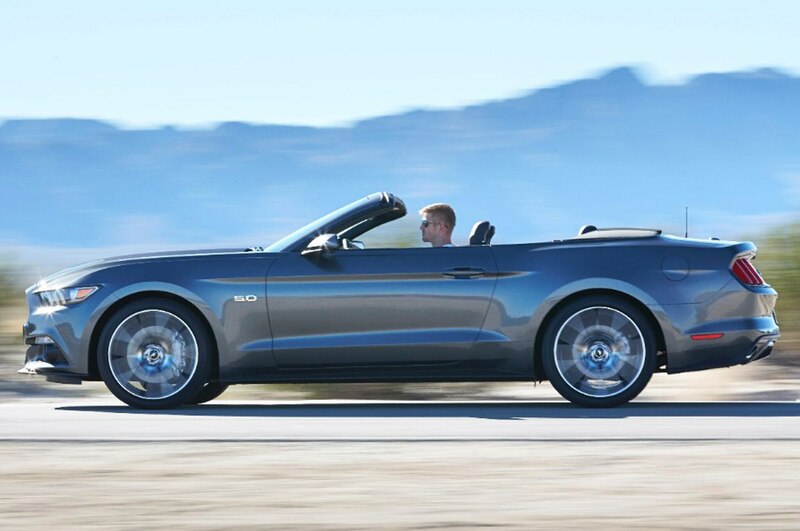 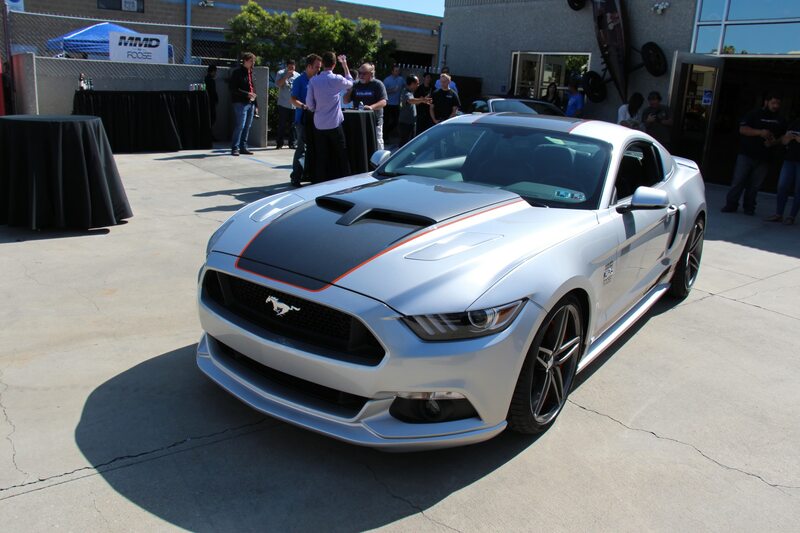 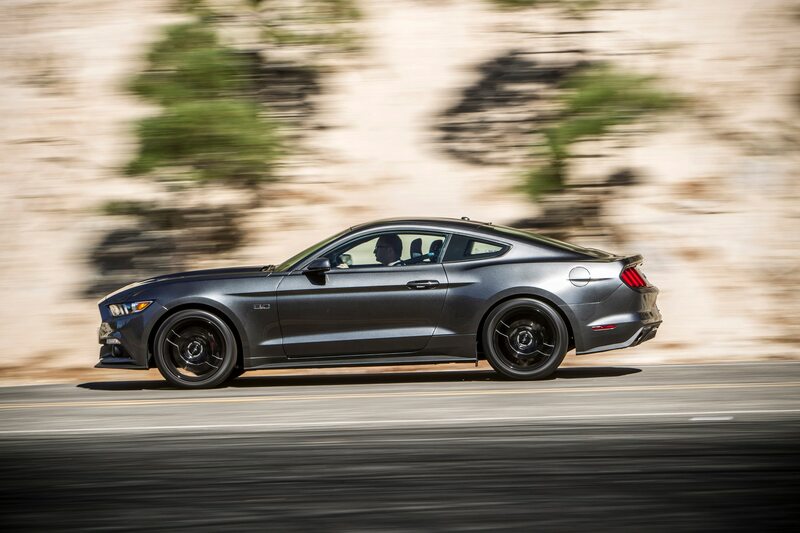 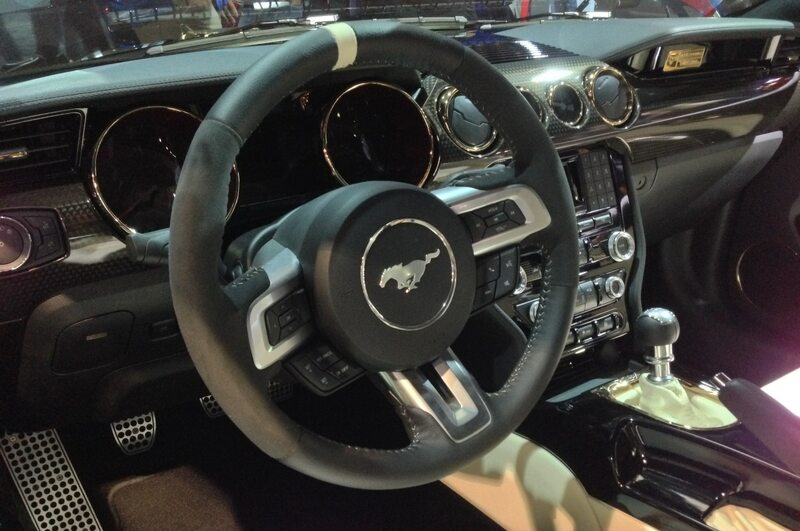 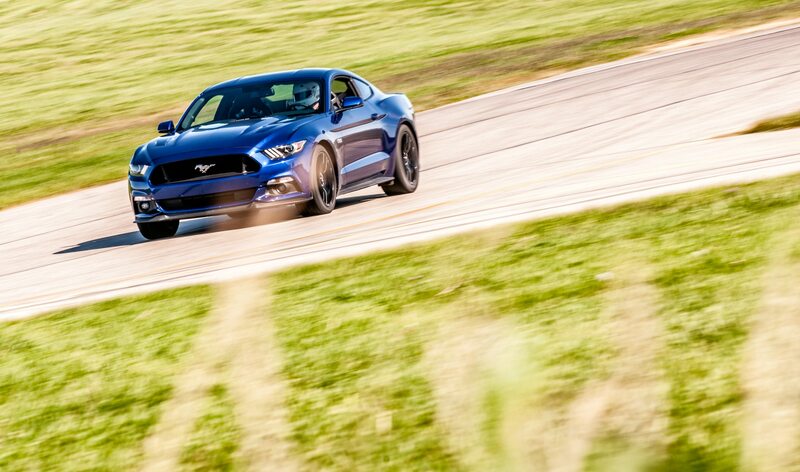 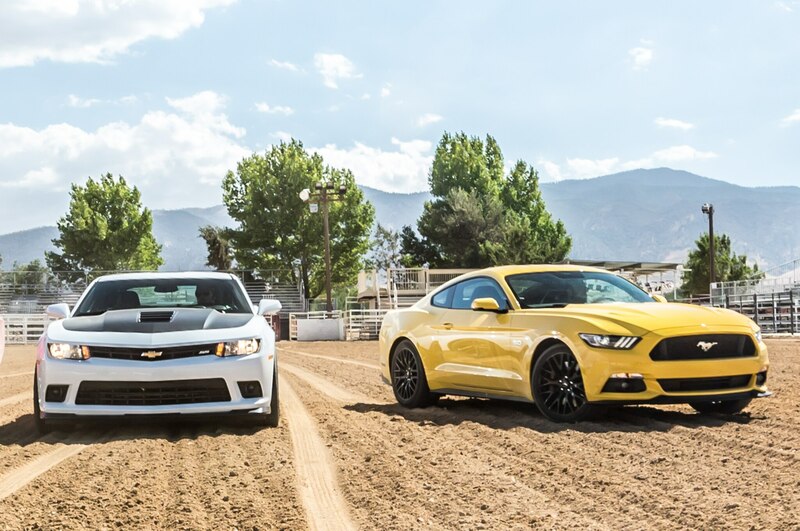 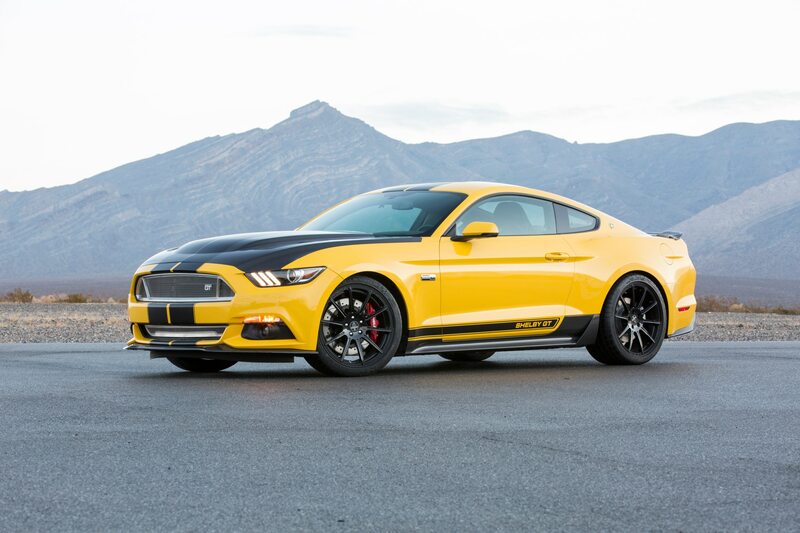 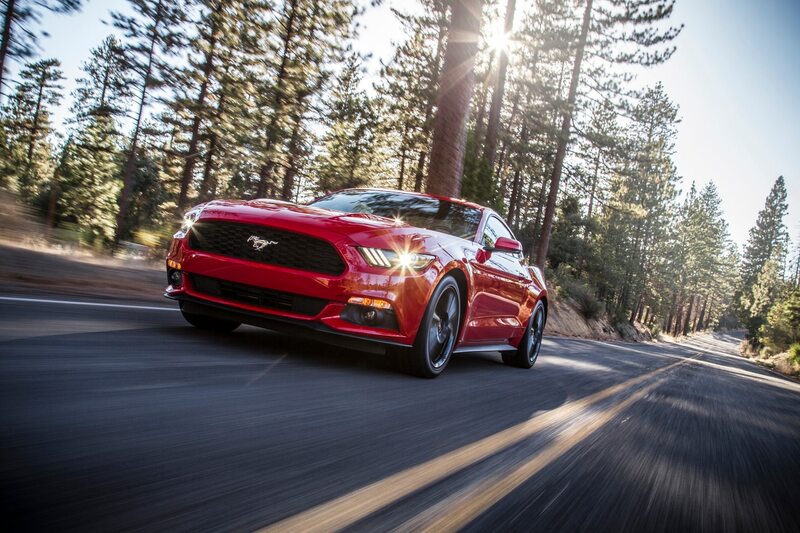 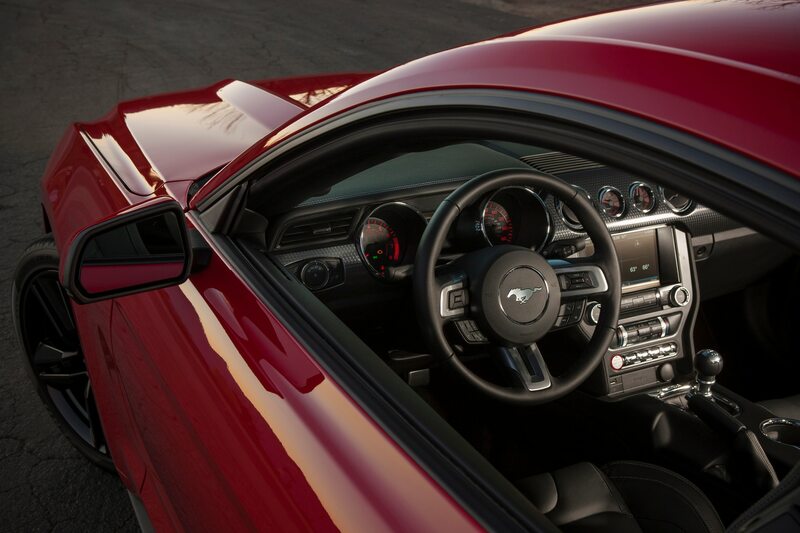 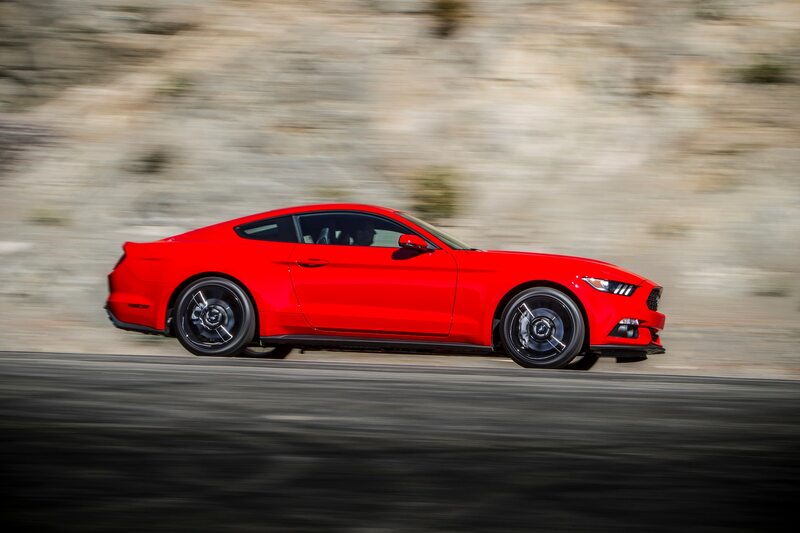 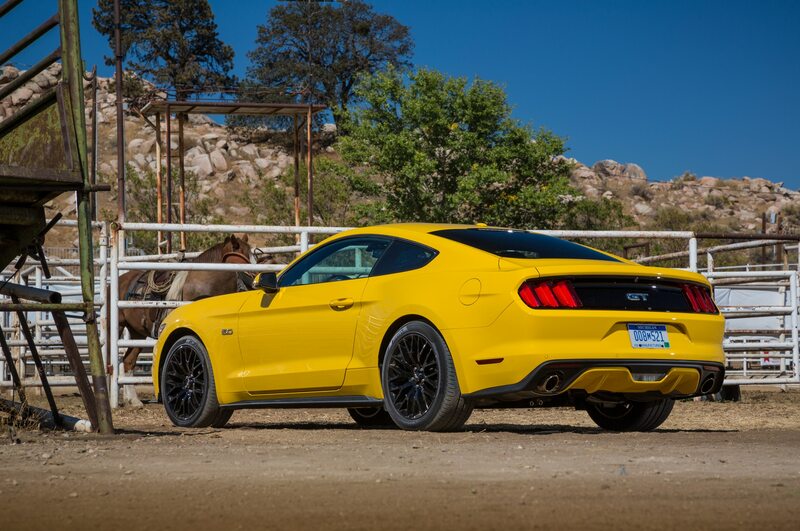 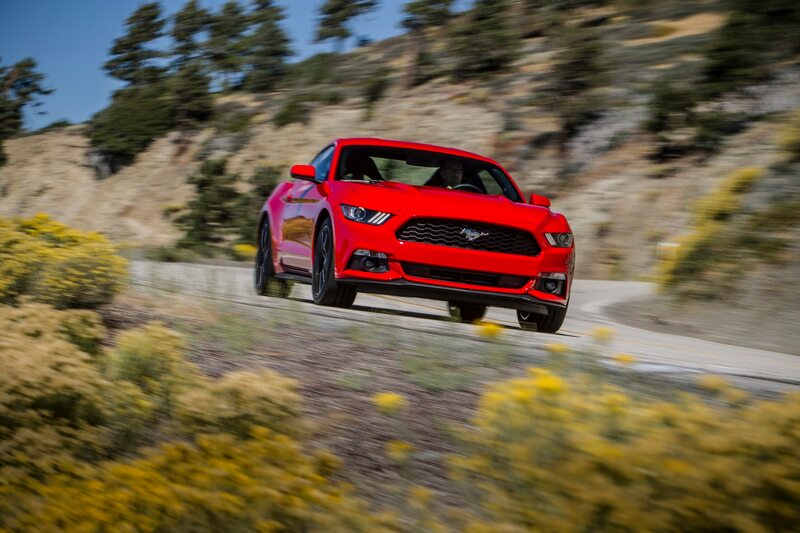 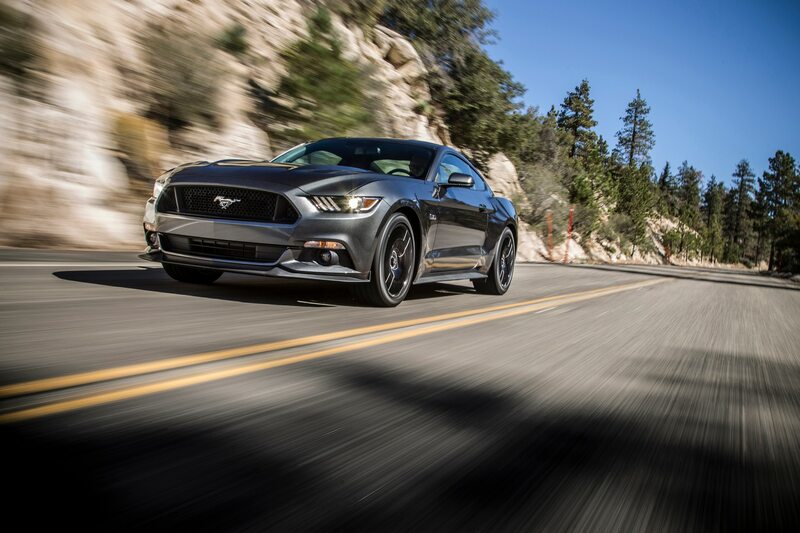 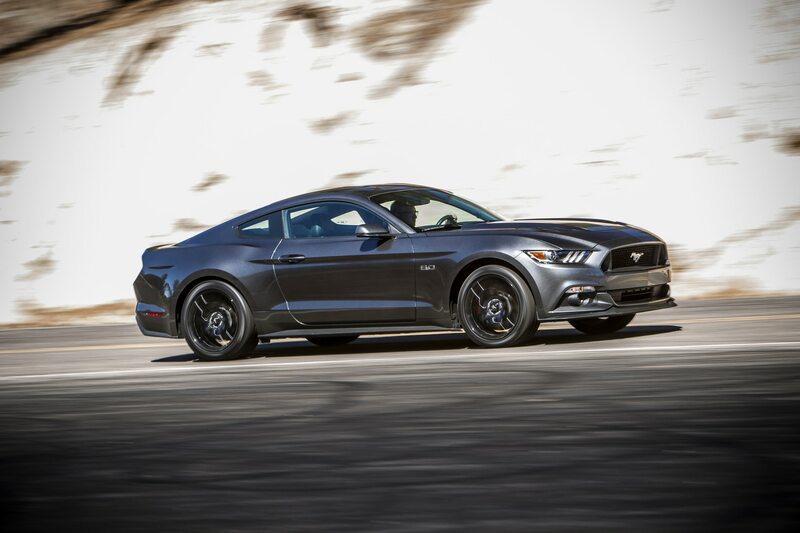 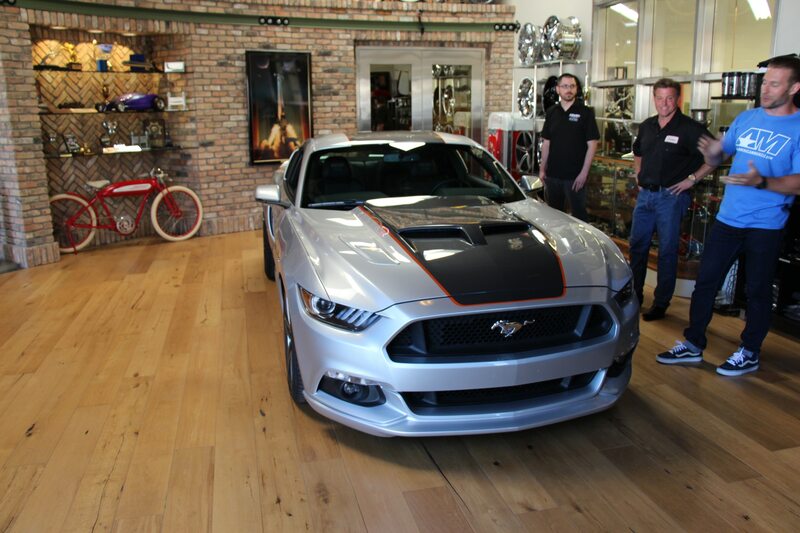 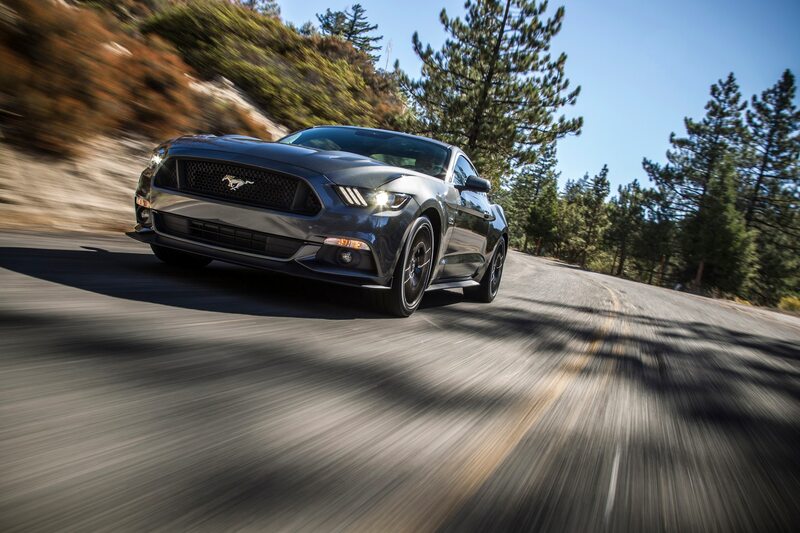 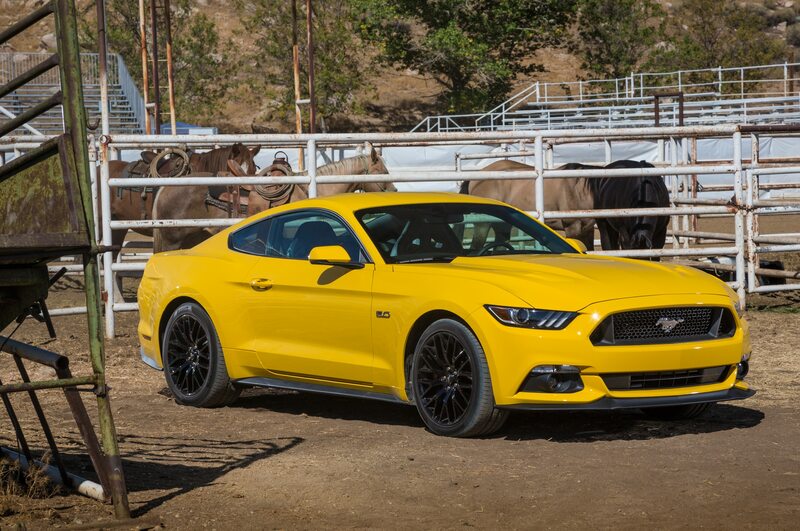 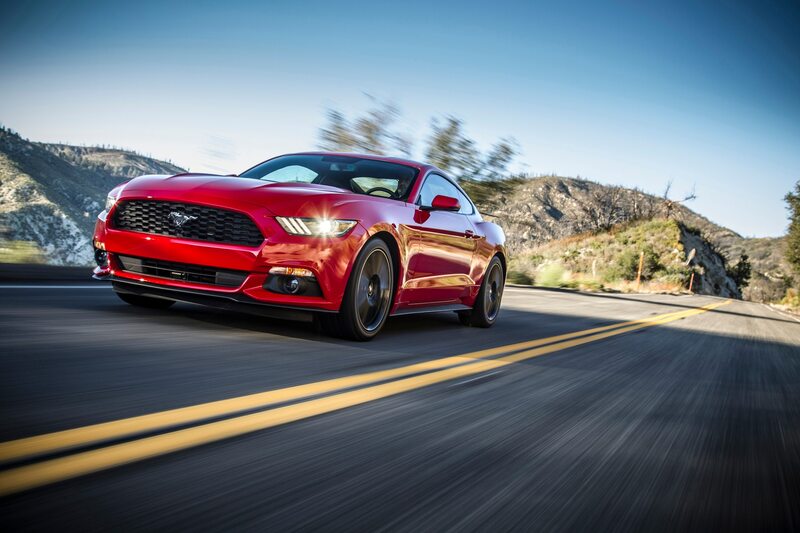 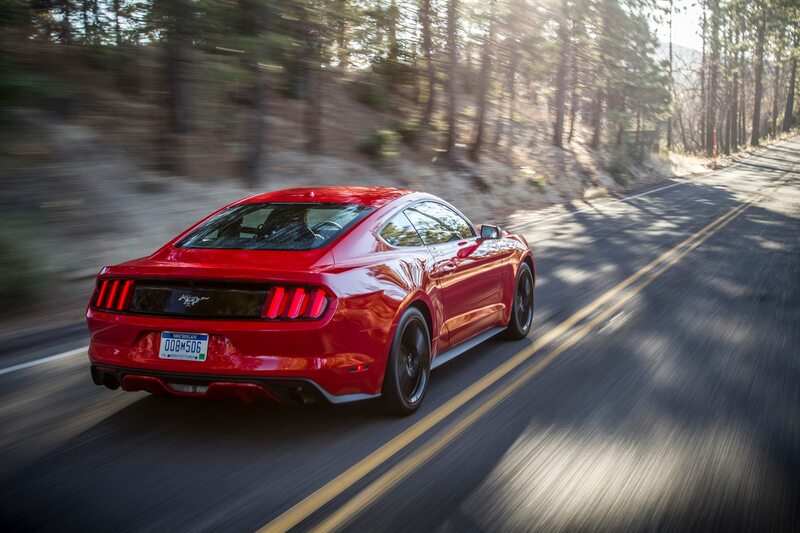 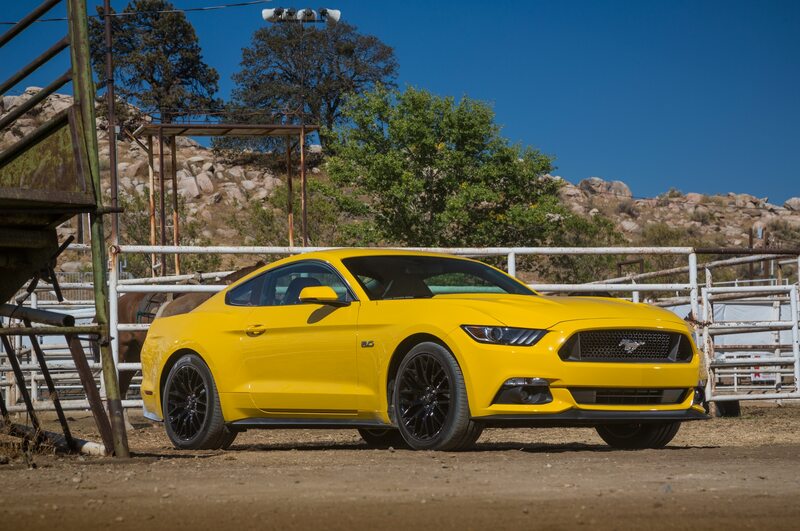 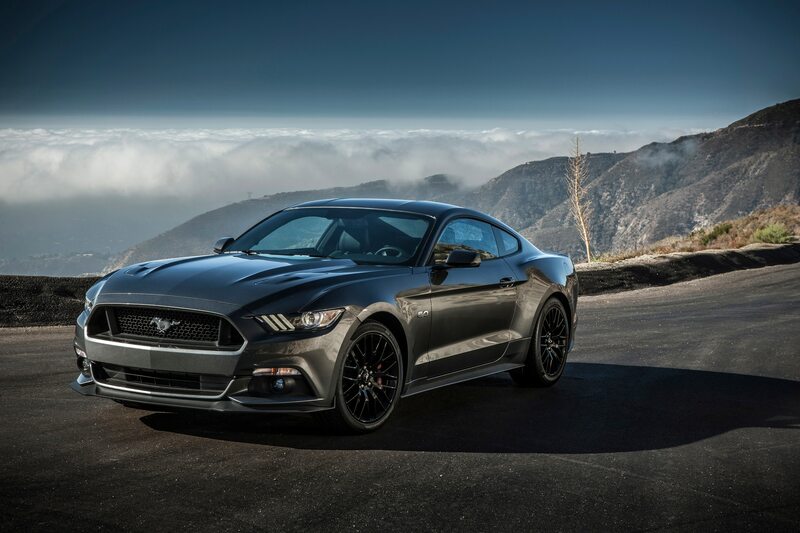 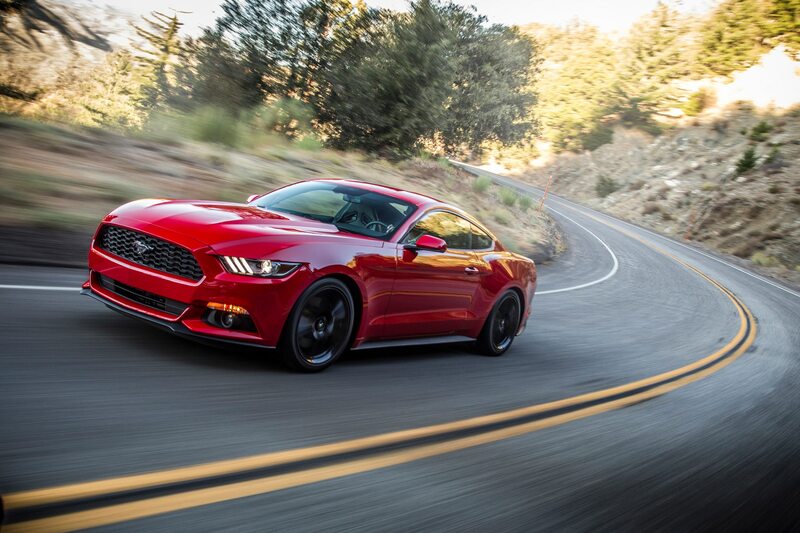 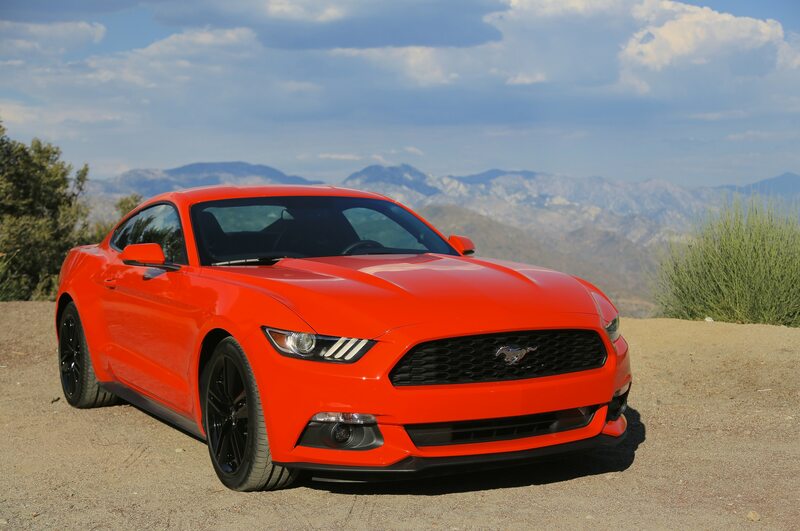 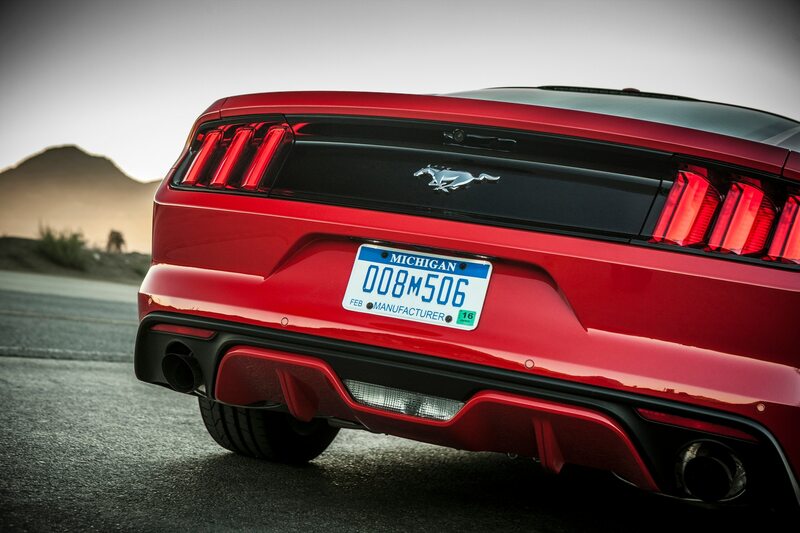 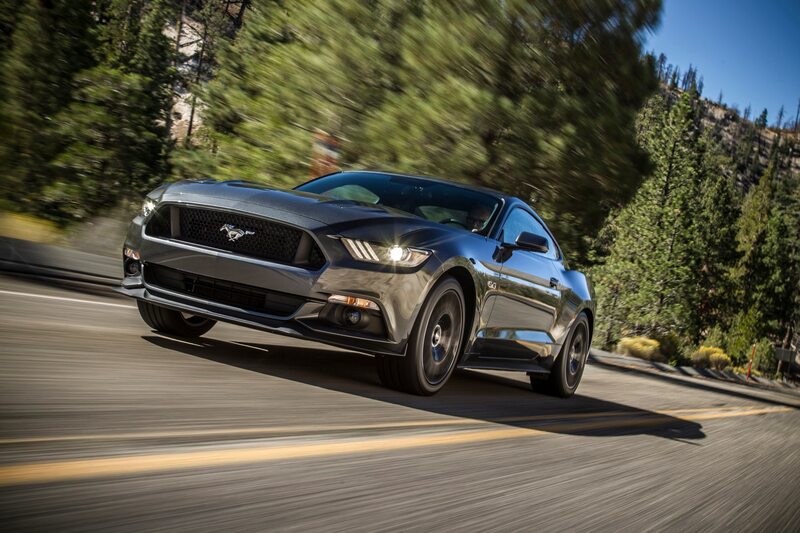 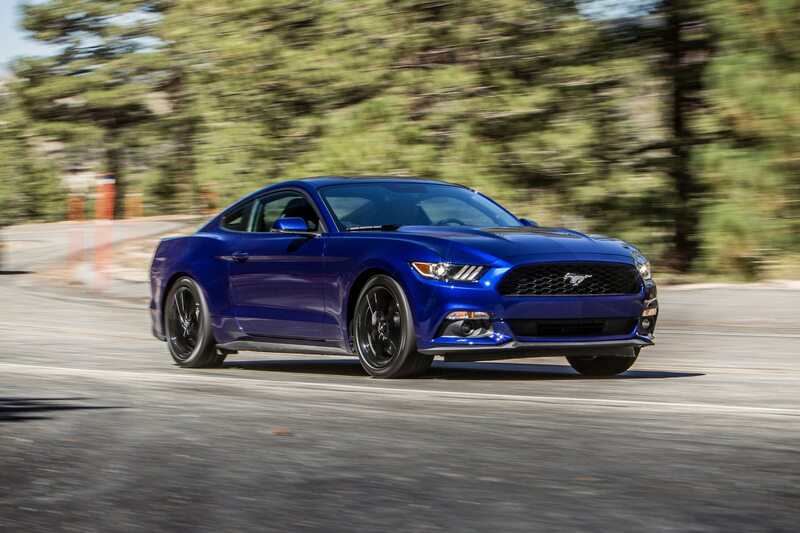 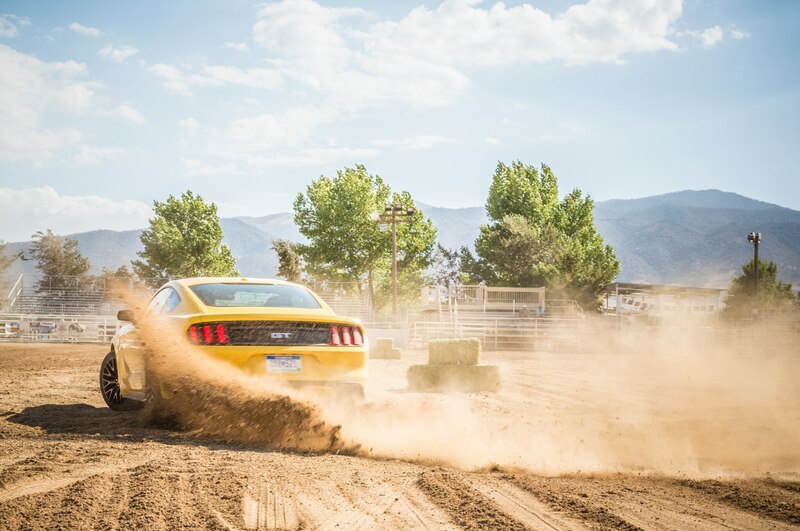 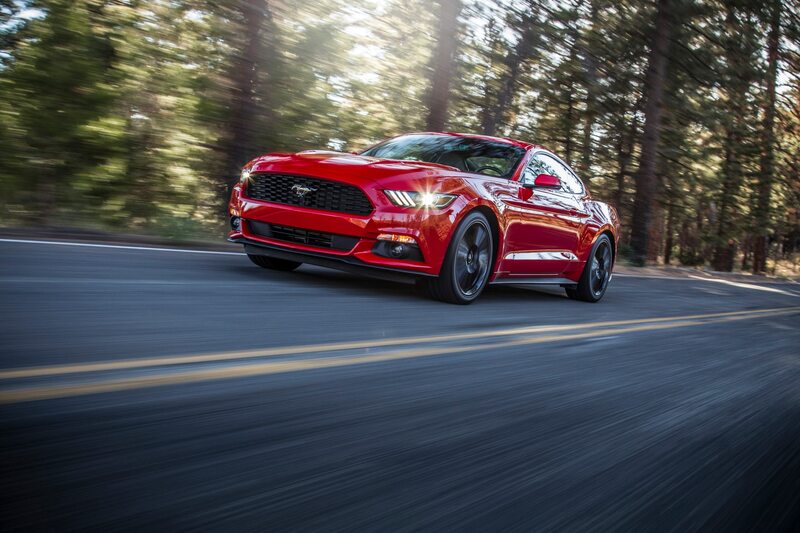 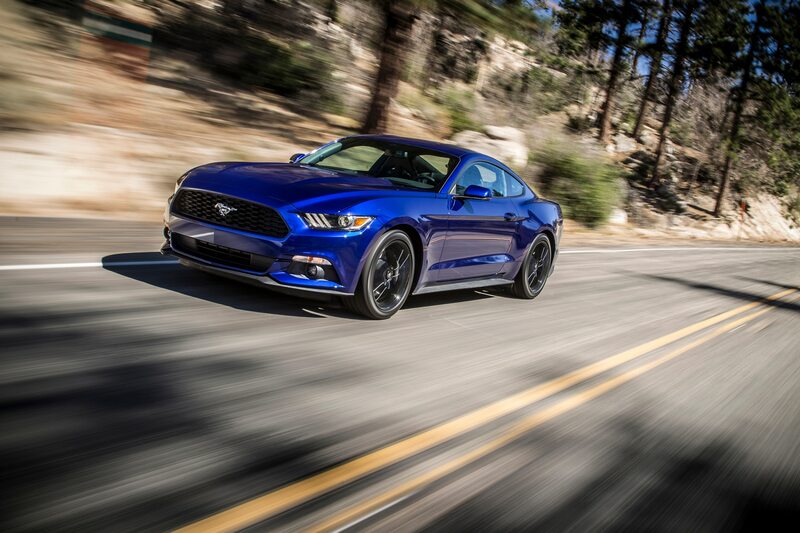 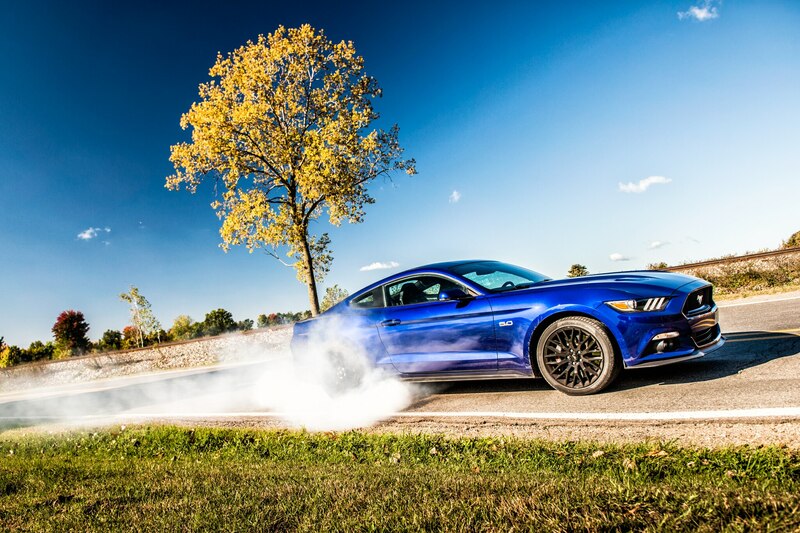 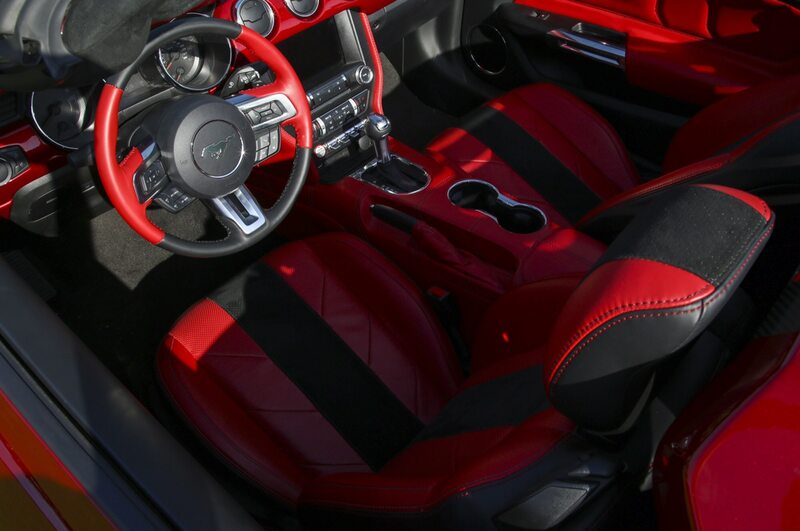 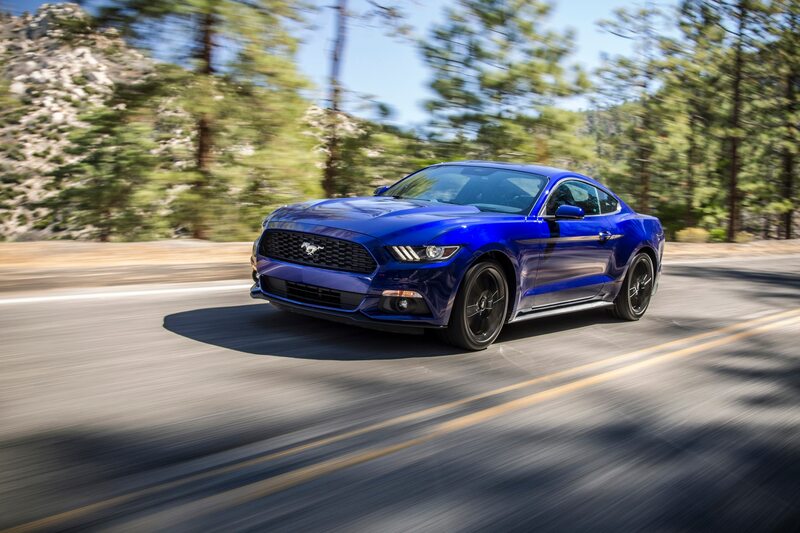 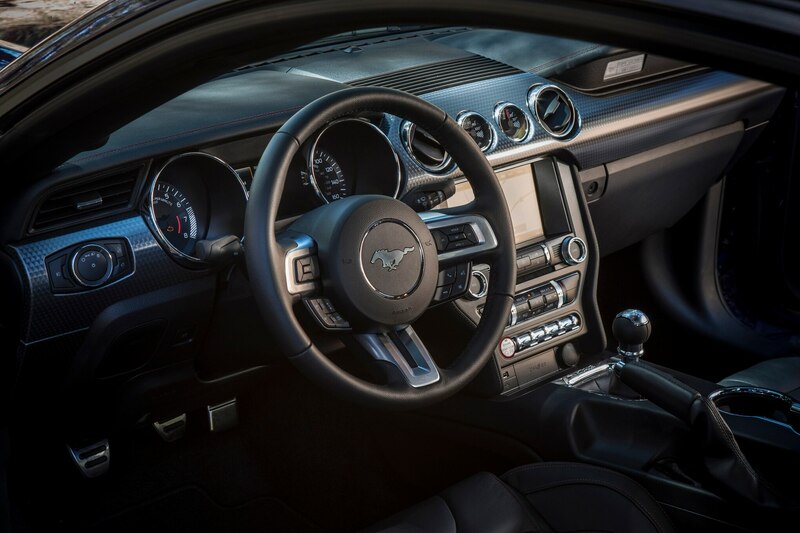 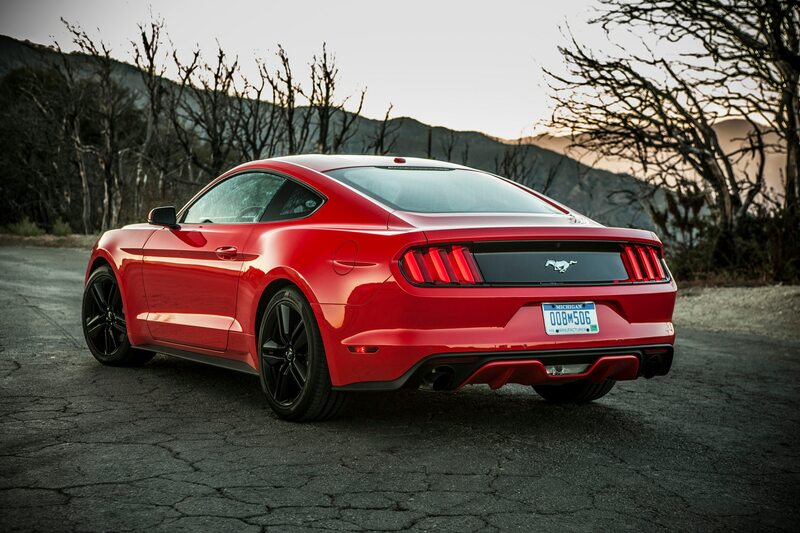 Mustang muscle: The six-speed manual is a perfect mate to the rip-roaring V-8. 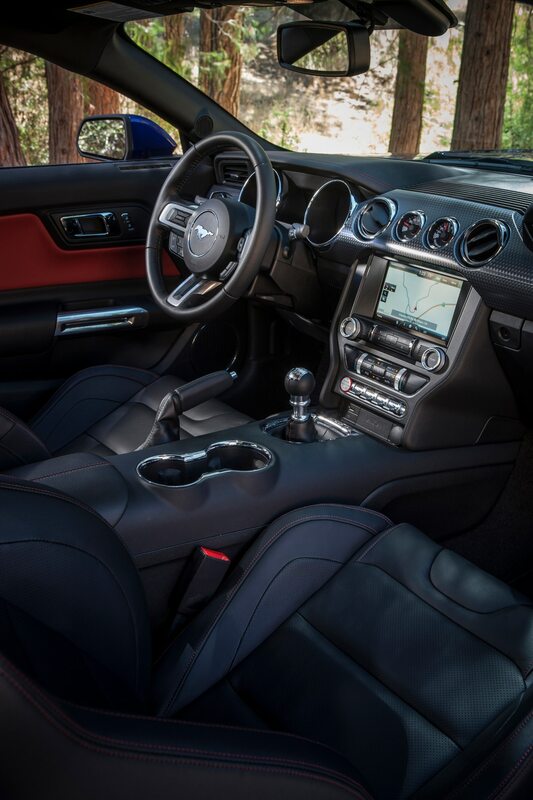 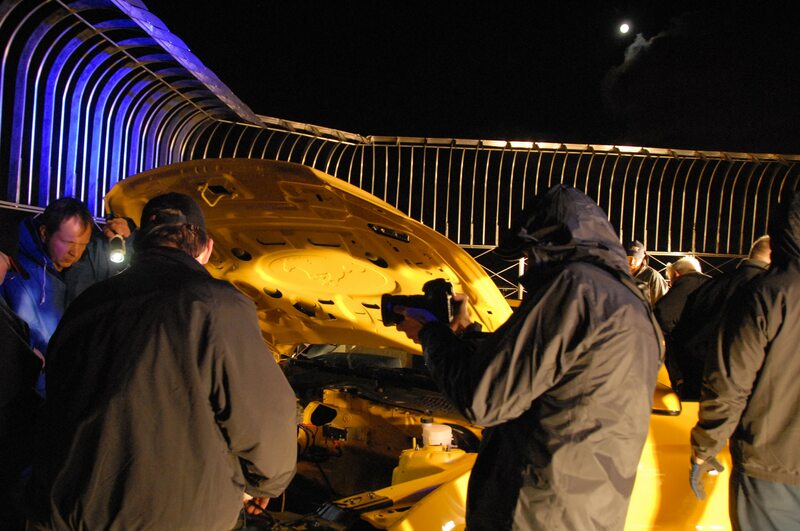 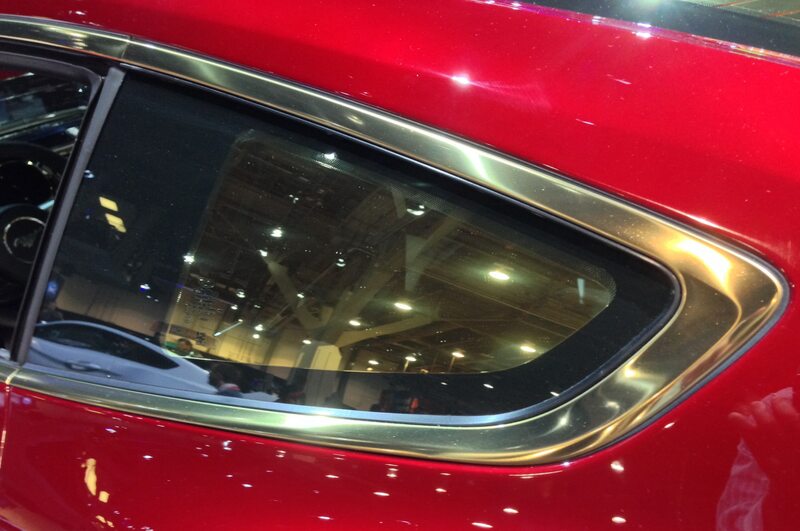 The interior is also much improved. 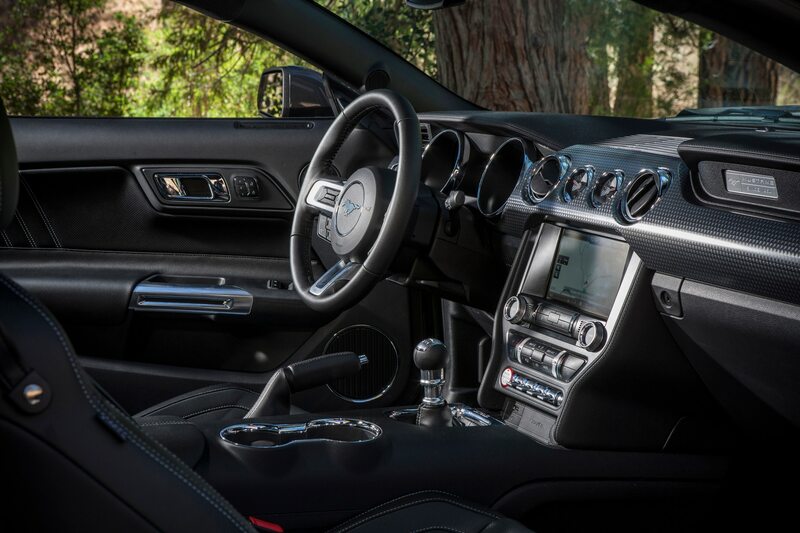 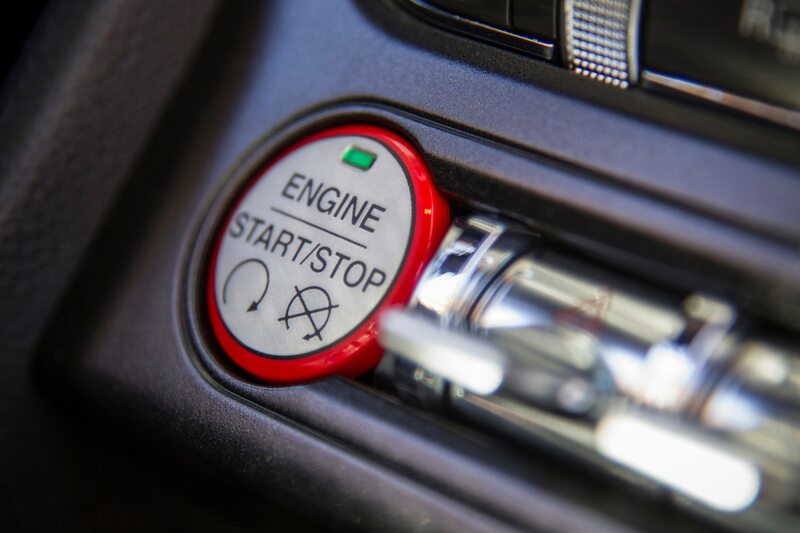 Even as Ferrari has gotten out of the manual transmission business, Ford continues to offer a six-speed stick, and it’s a perfect mate for the rip-roaring V-8. 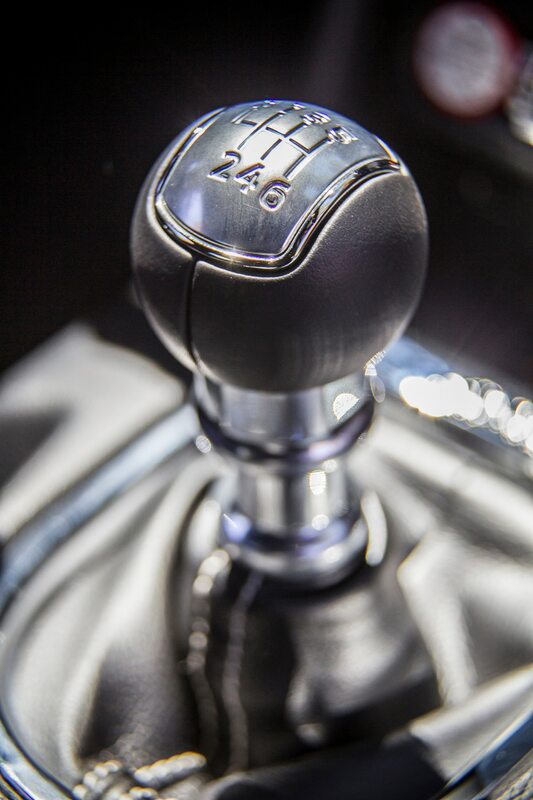 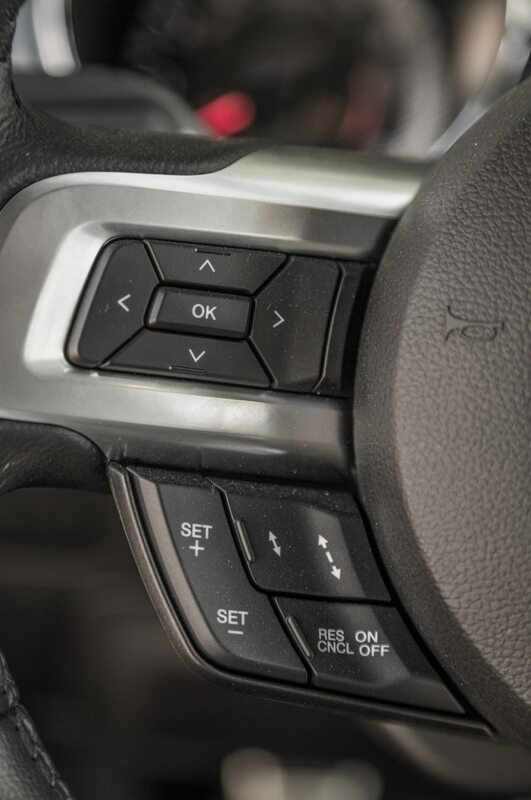 With the hefty shift lever and robust shift motion, the gearbox seems to have come out of an old-school Woodward Avenue street racer. 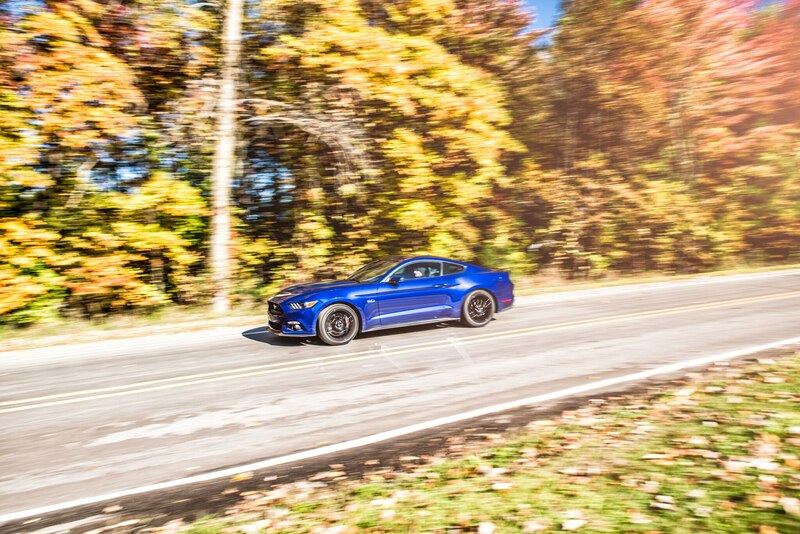 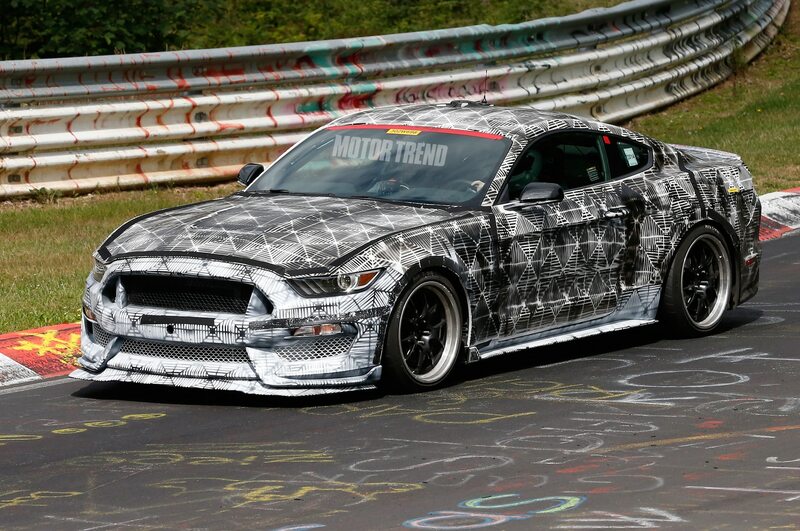 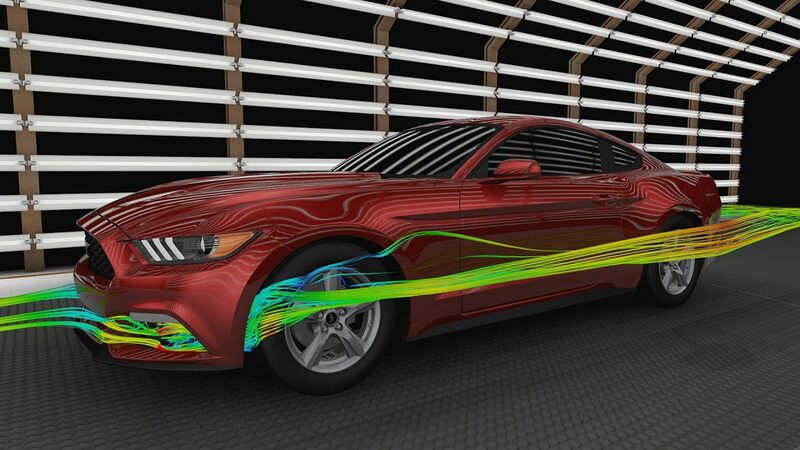 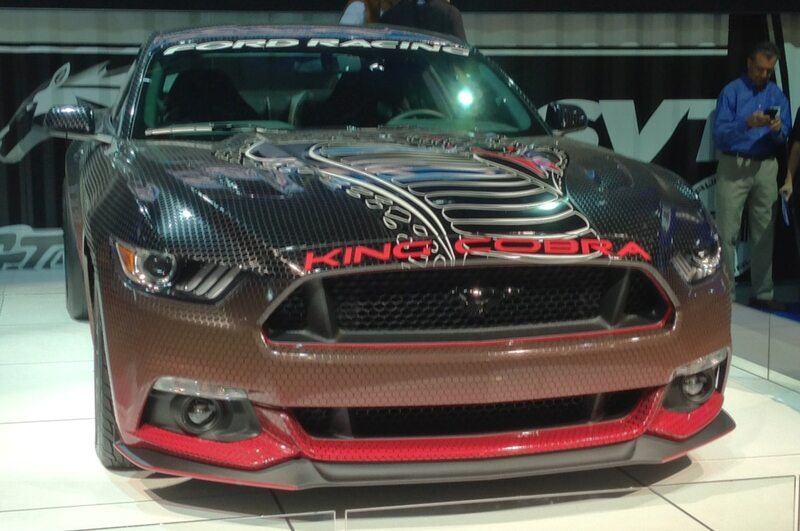 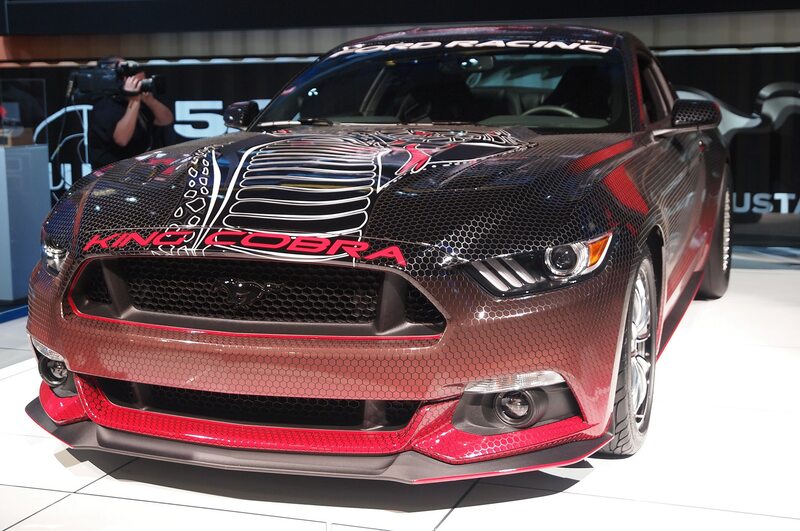 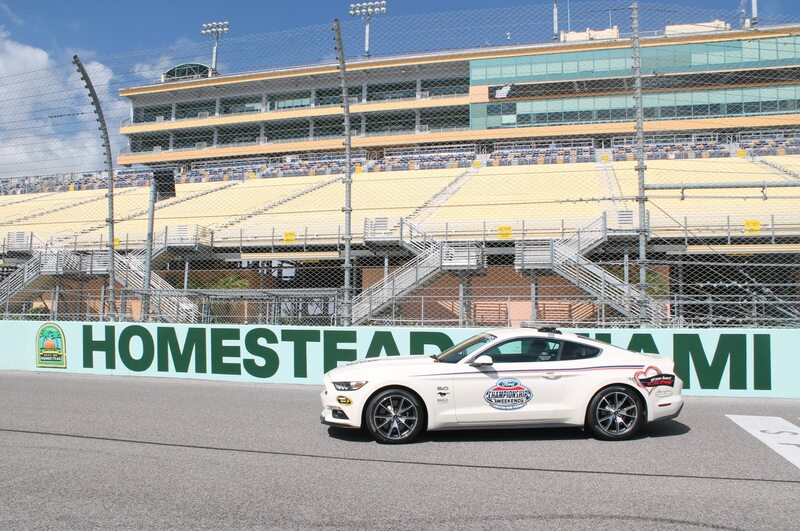 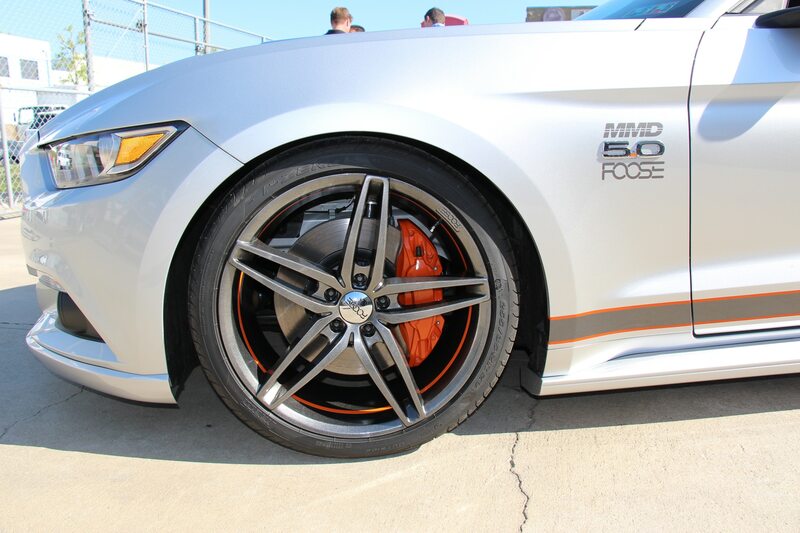 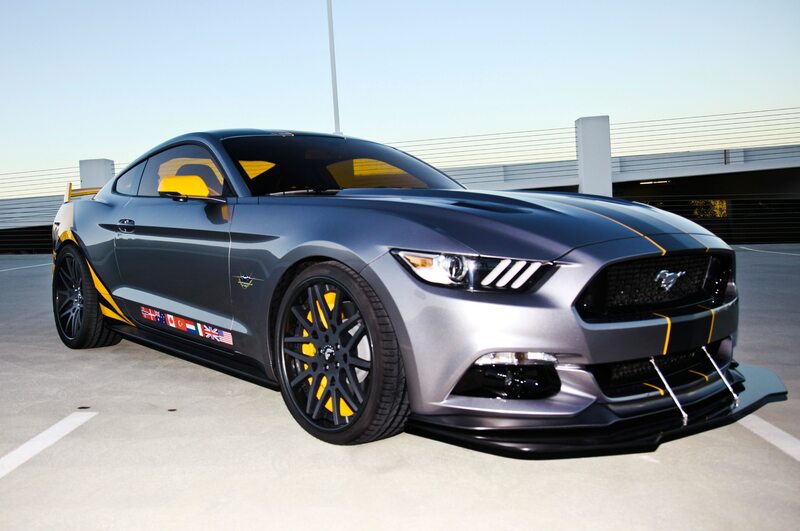 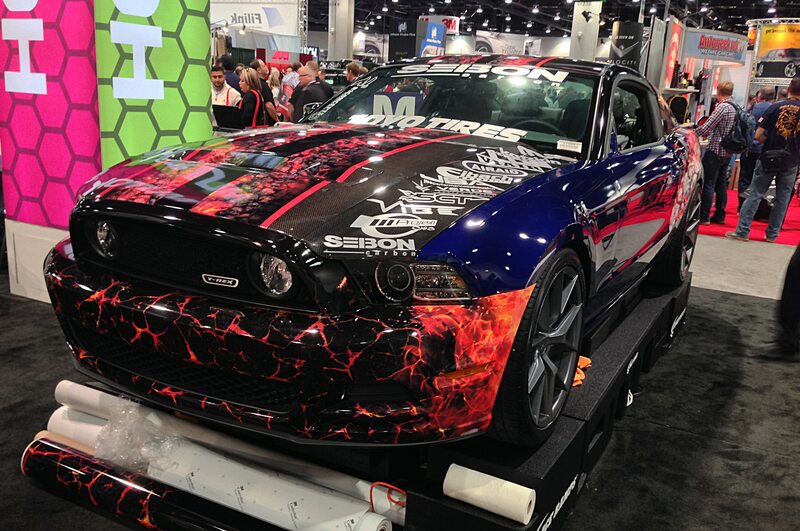 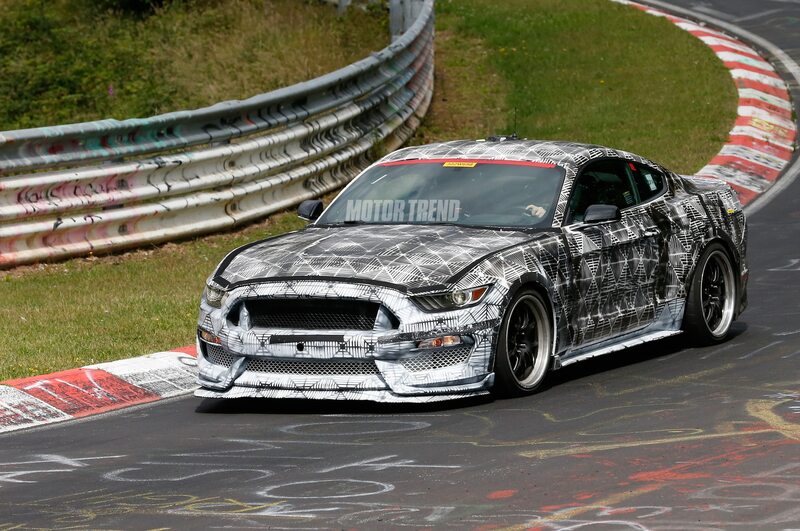 Still, there’s nothing archaic about the Mustang when it’s roaring through the twisties or carving around a road course. 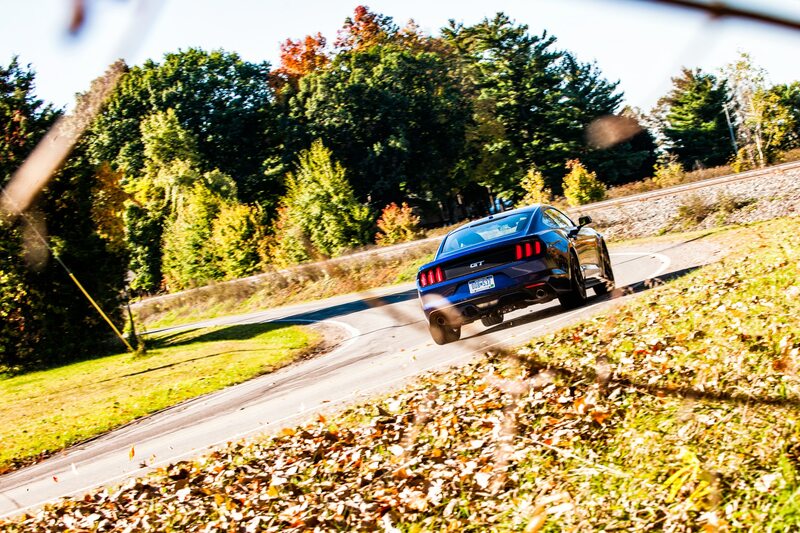 Sure, it’s easy — and fun — to induce power oversteer coming out of slow corners. 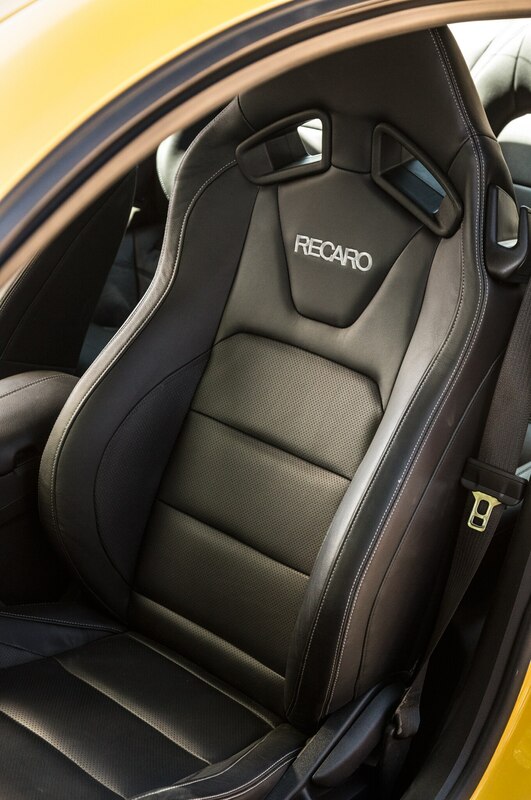 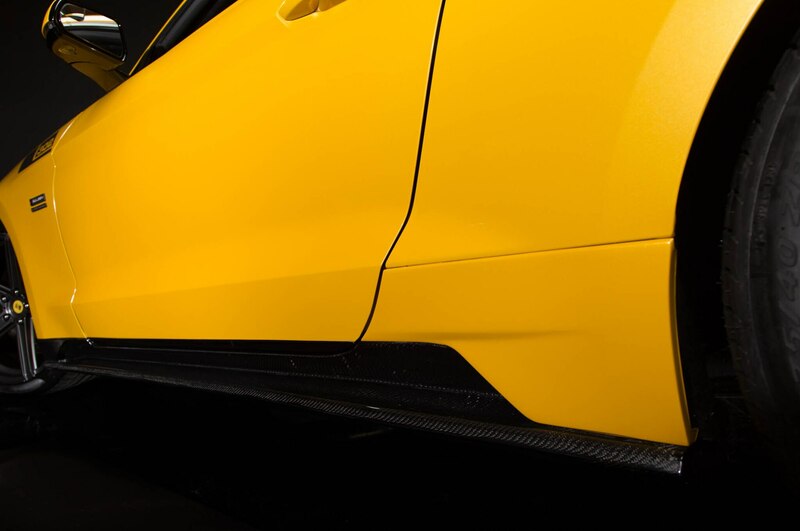 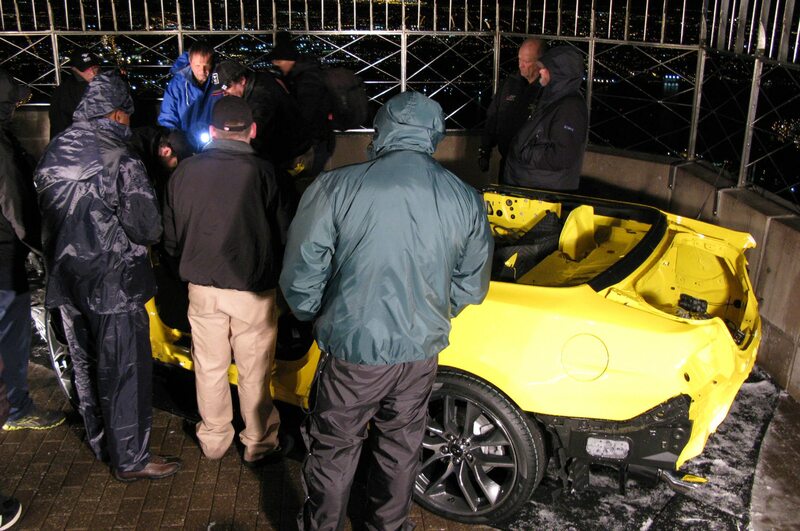 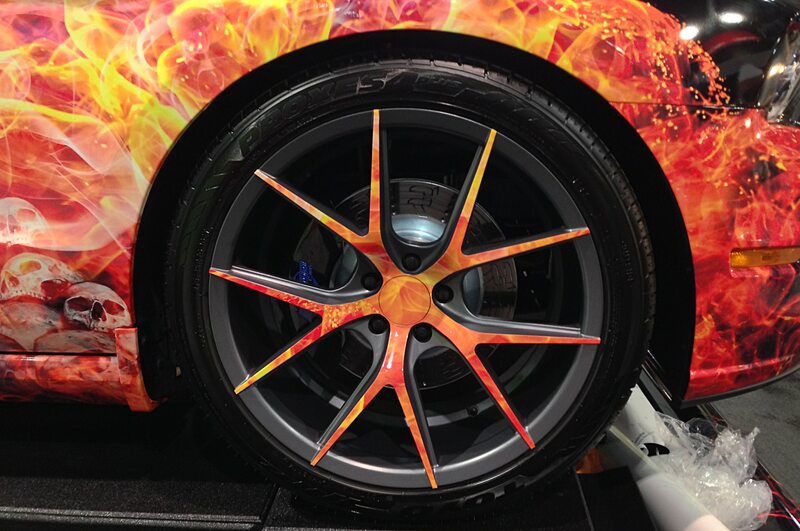 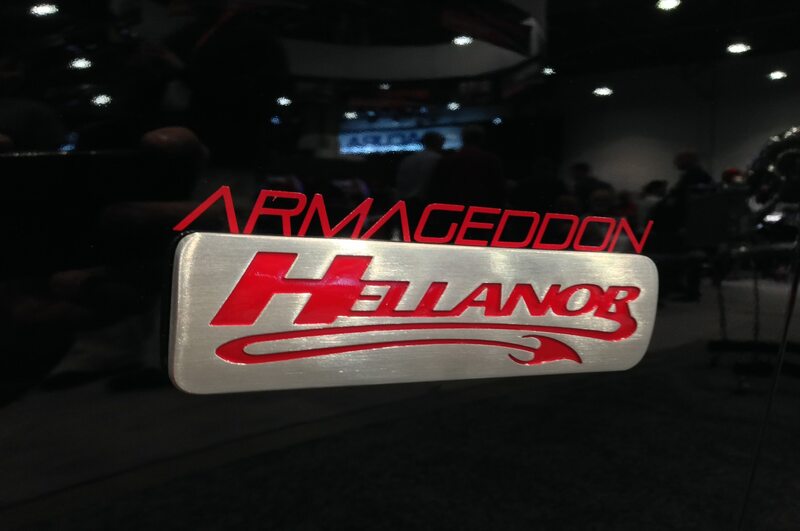 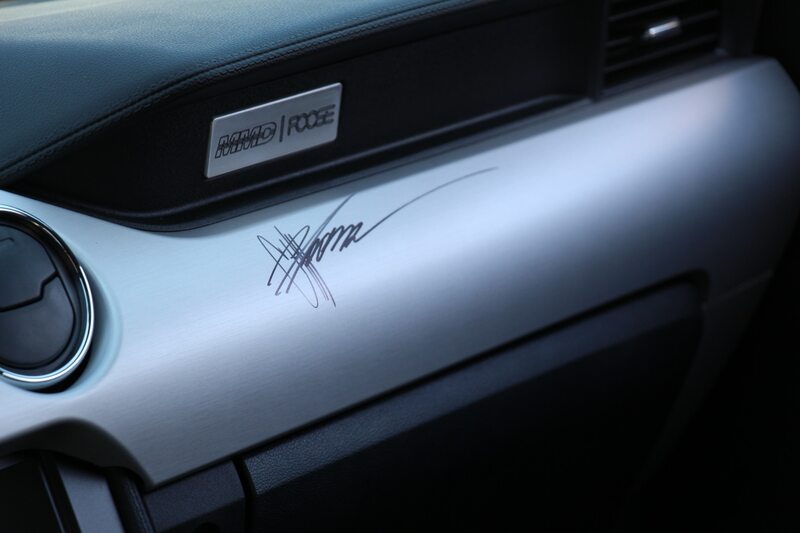 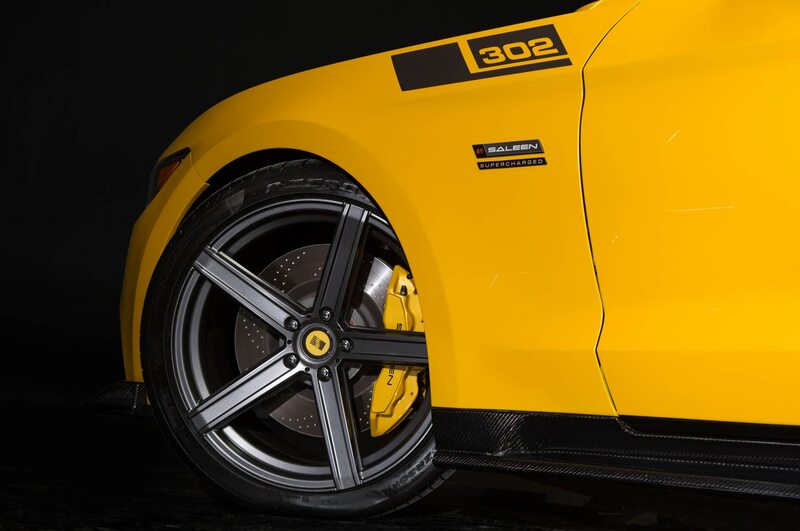 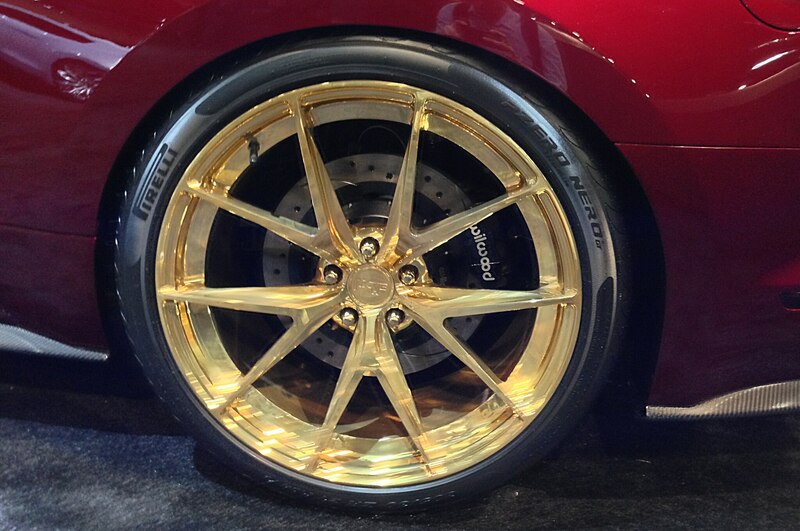 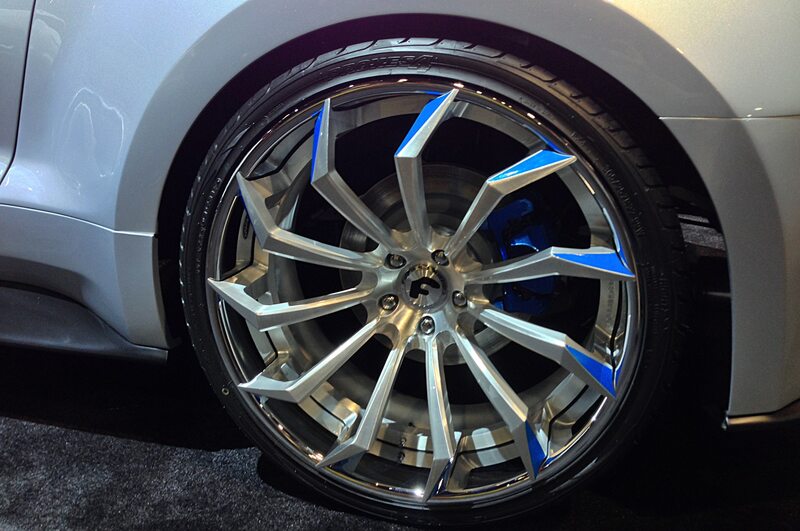 But the chassis is remarkably well composed when driven briskly, and the brakes are a revelation, with a high, hard pedal and more stopping power than you’d expect in a car that weighs more than 3,700 pounds. 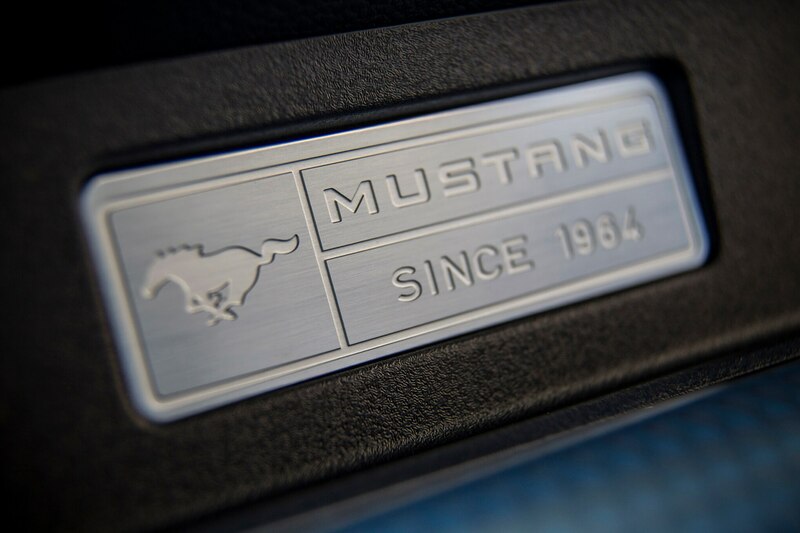 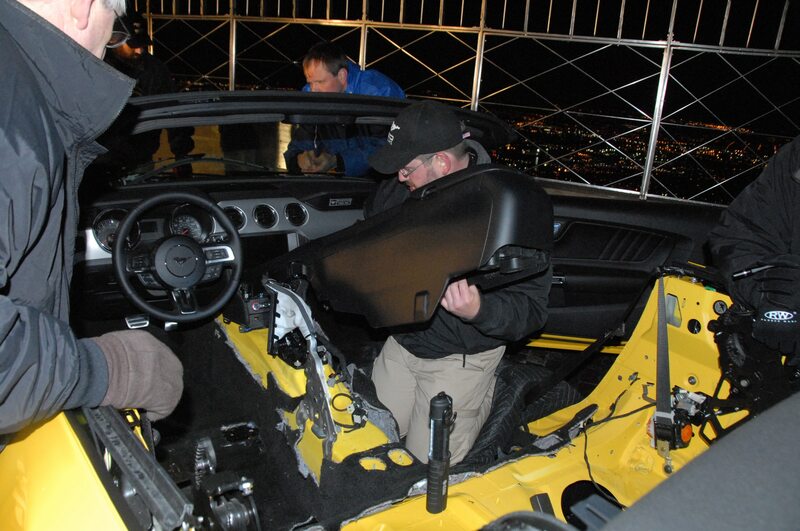 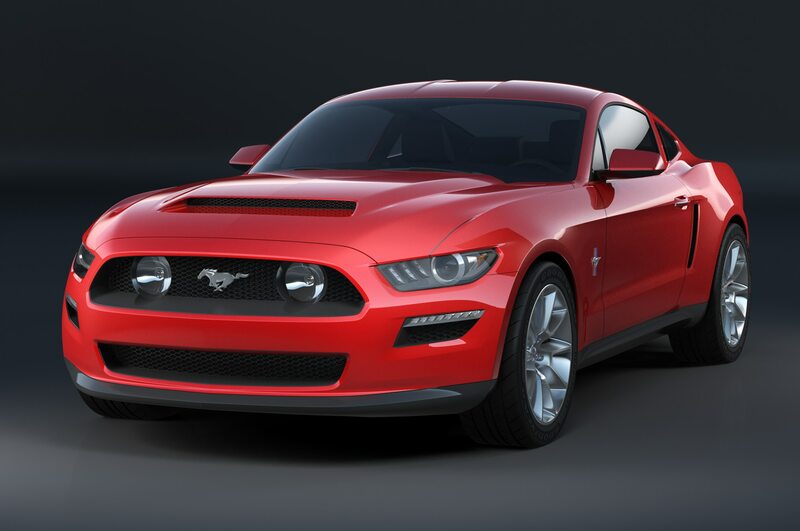 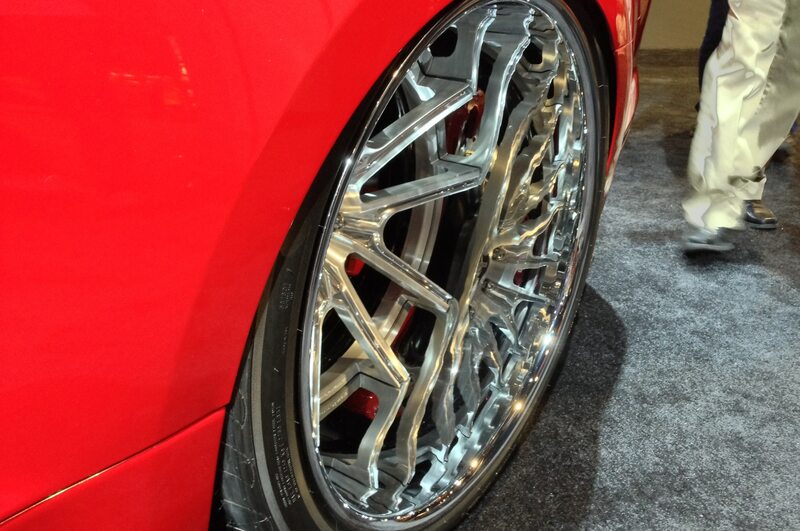 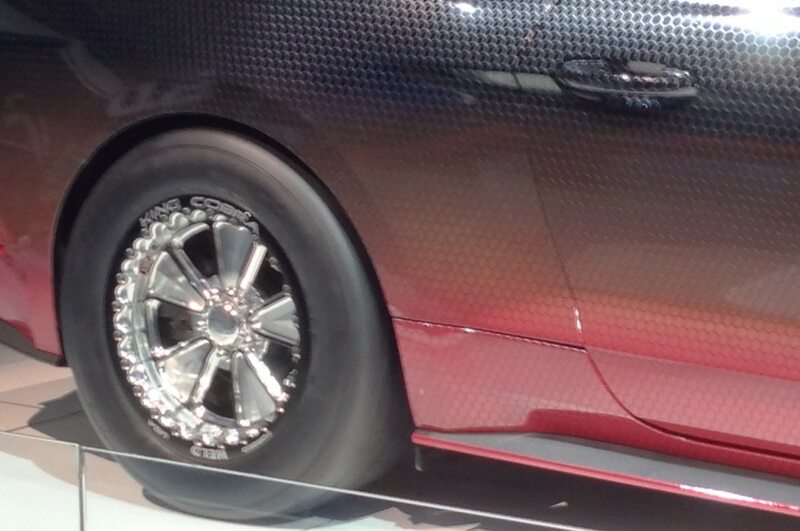 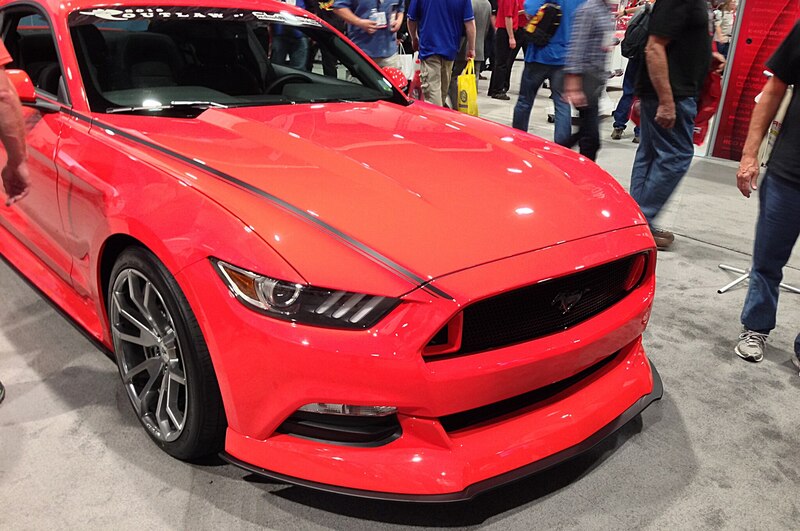 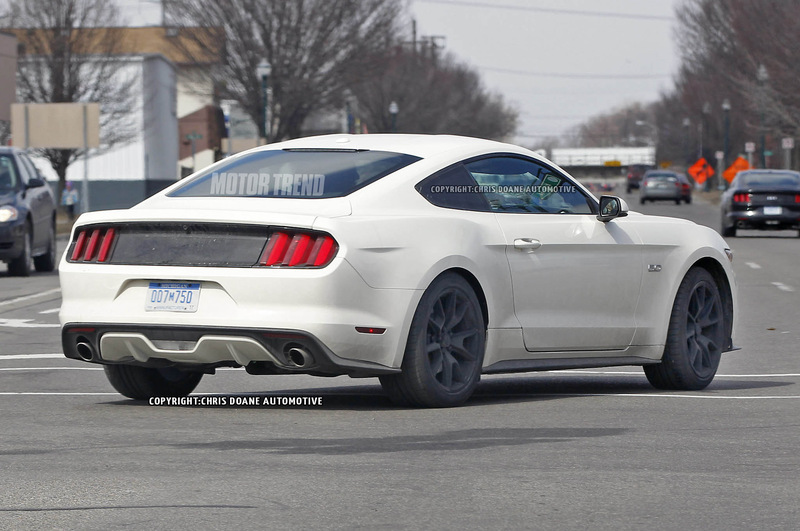 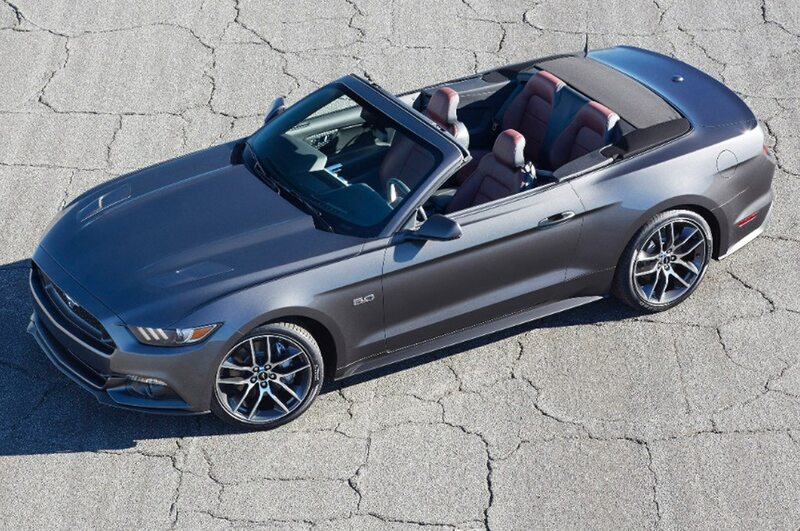 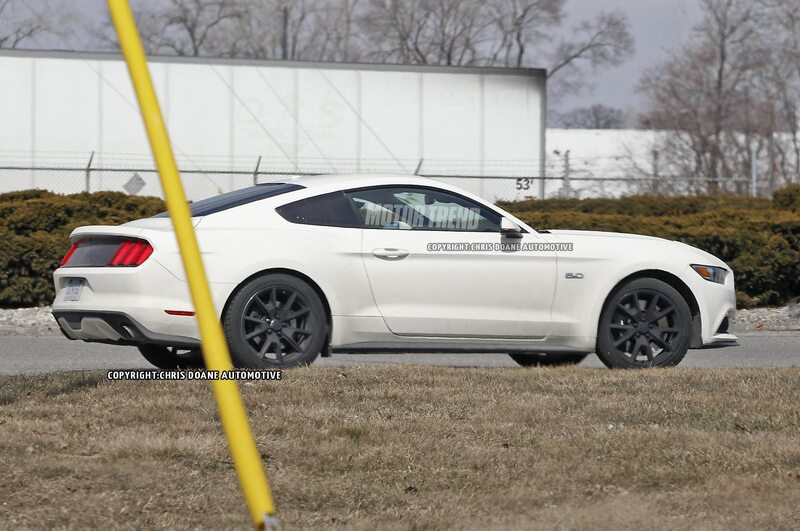 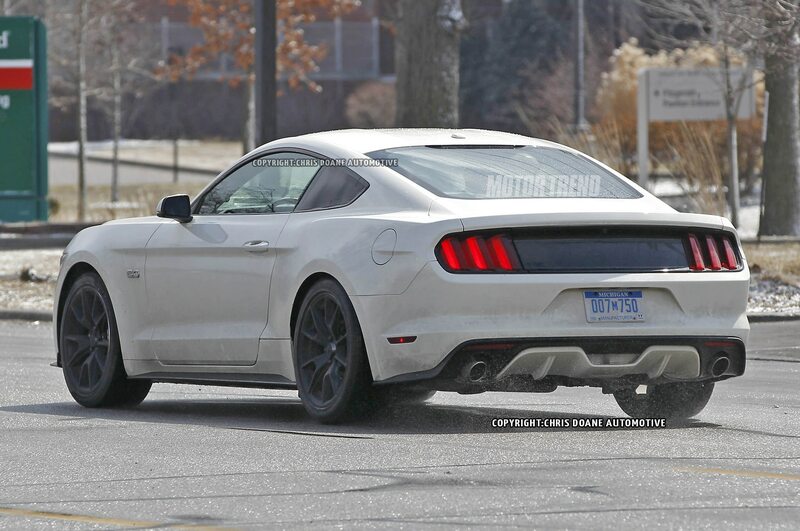 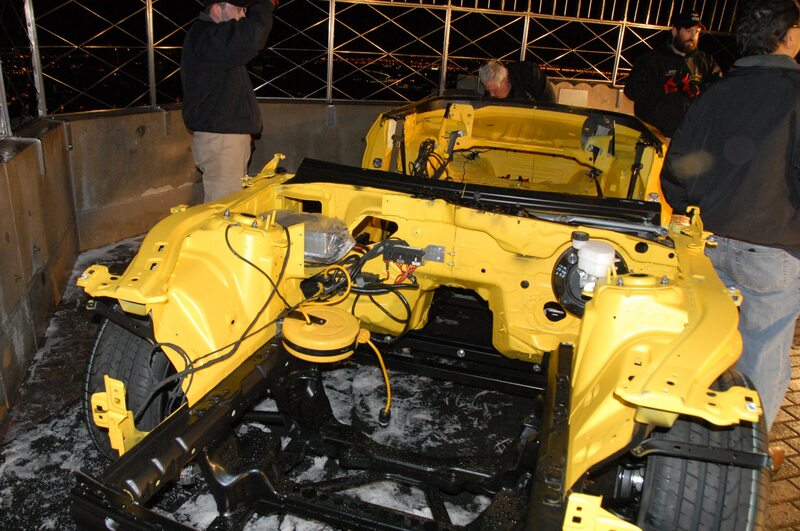 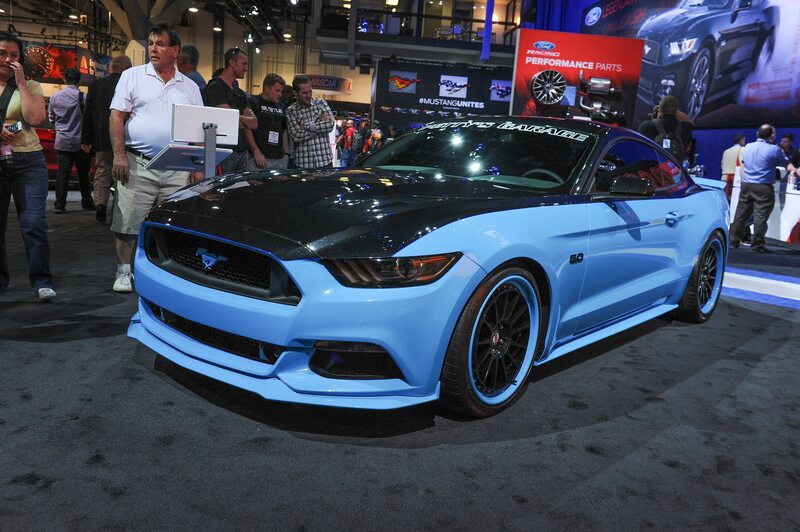 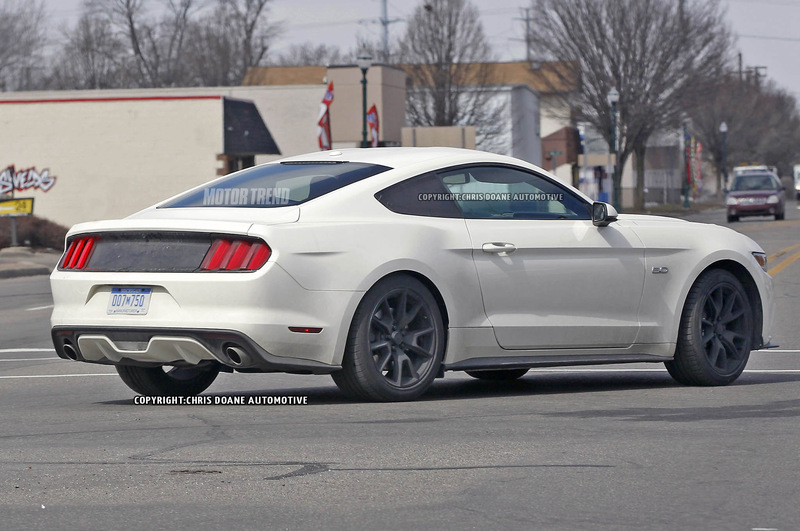 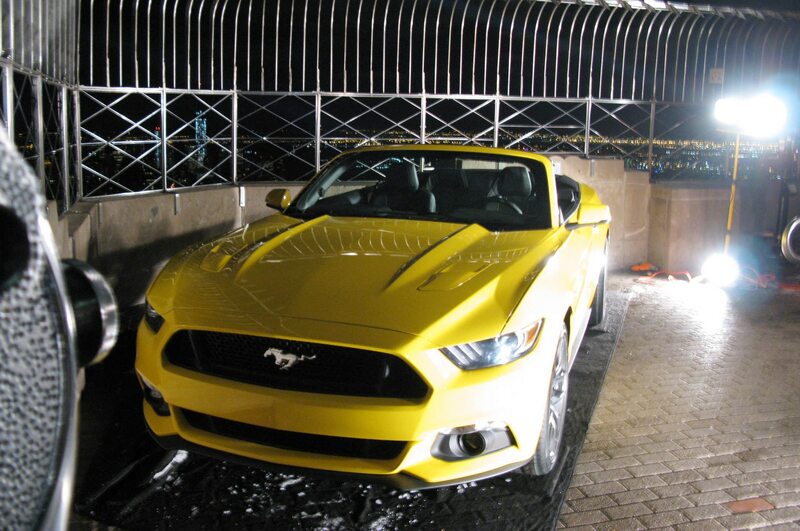 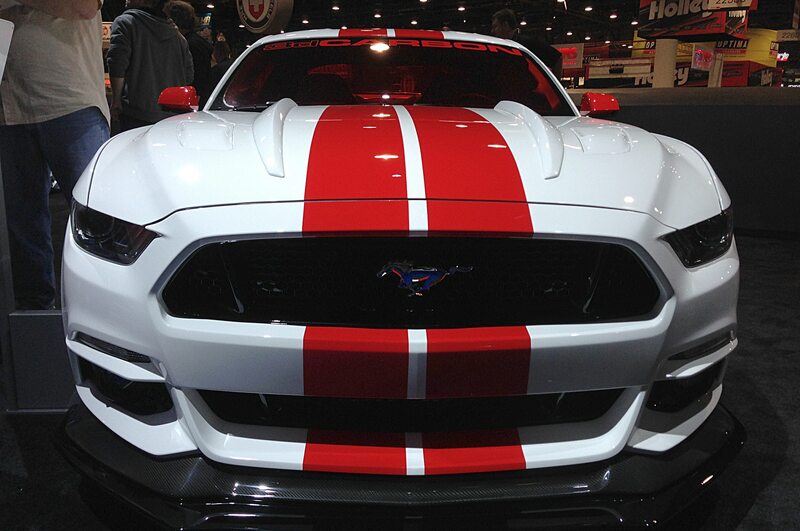 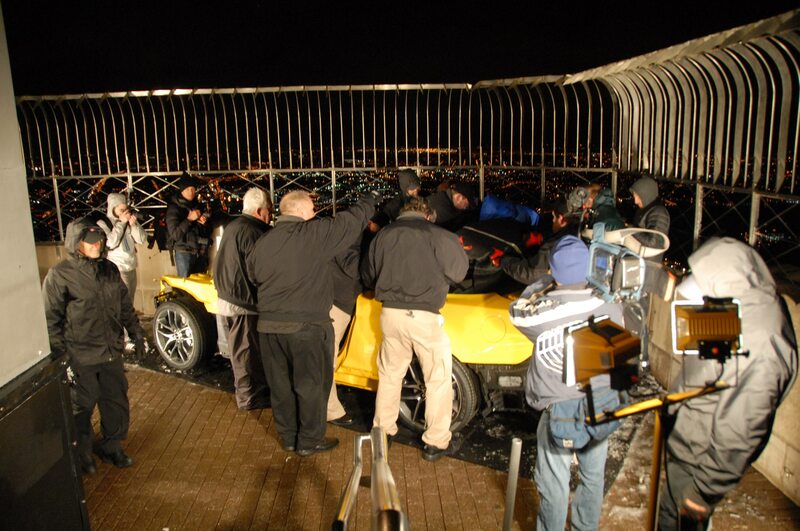 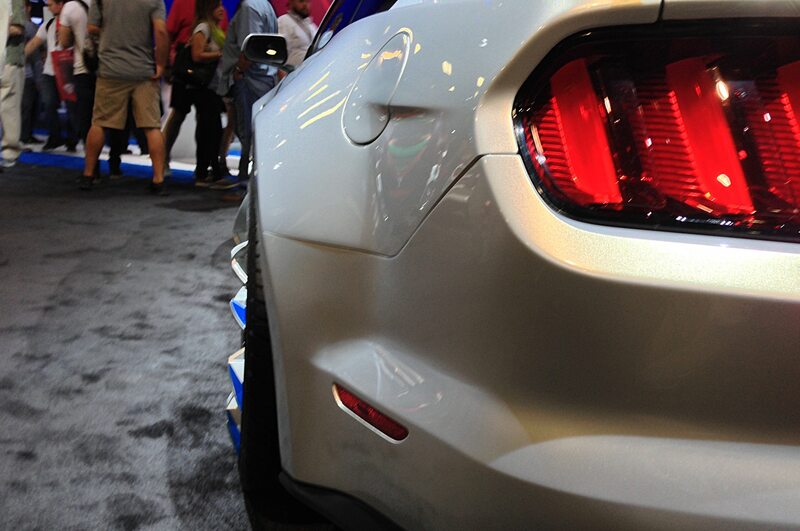 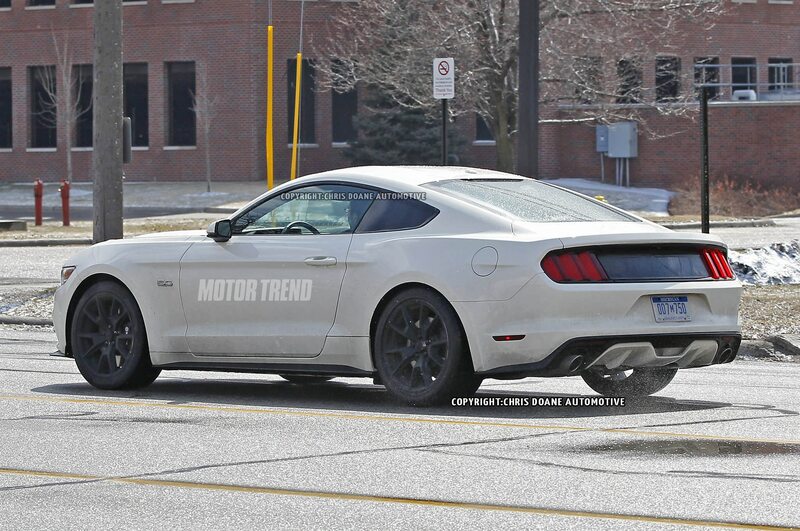 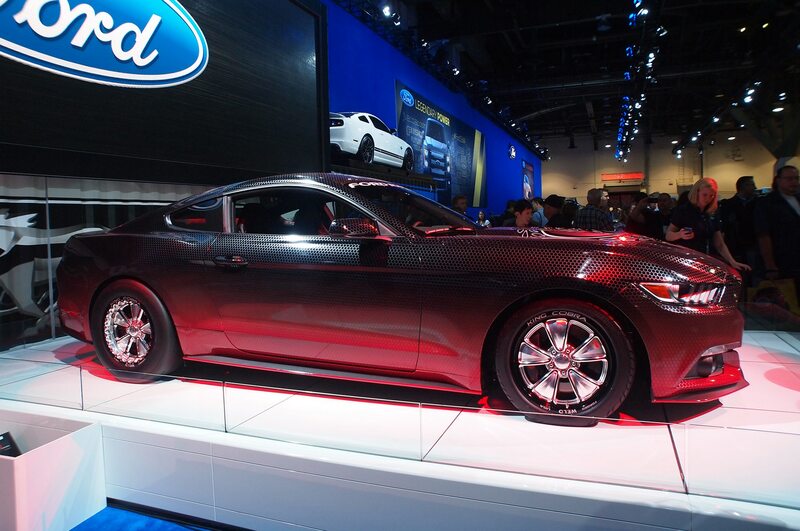 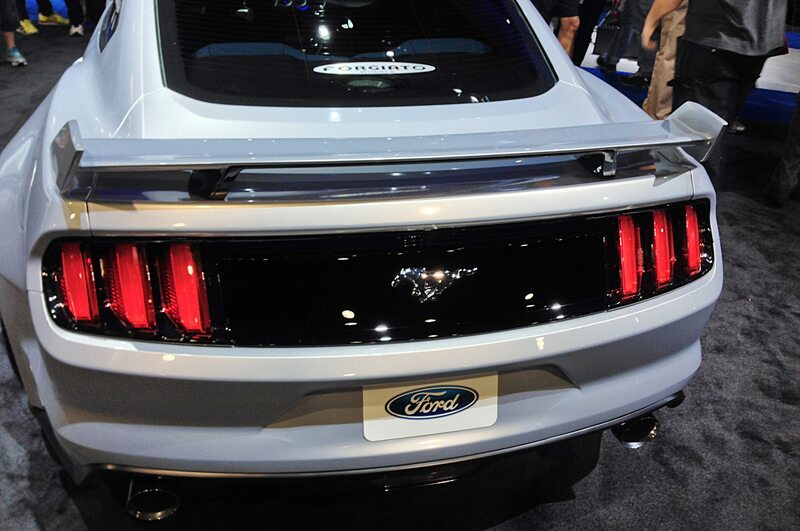 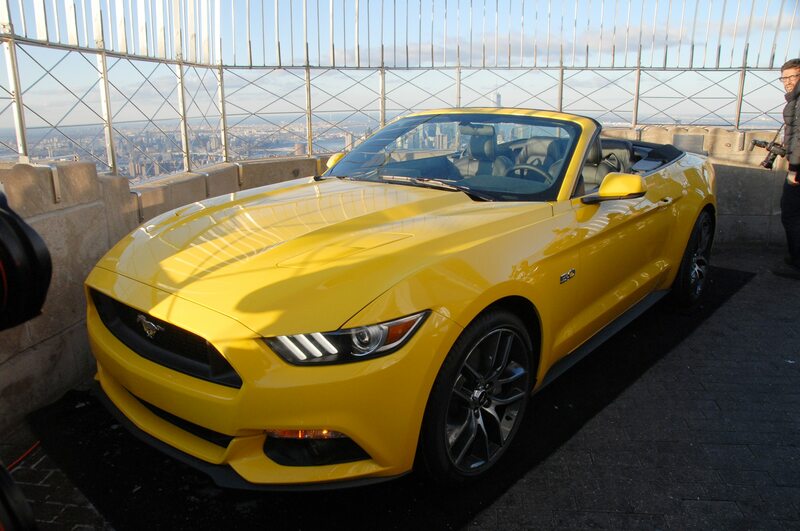 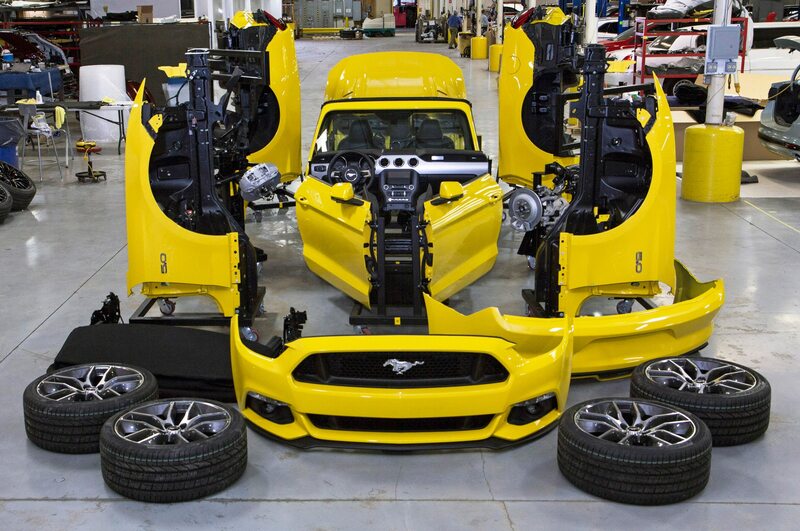 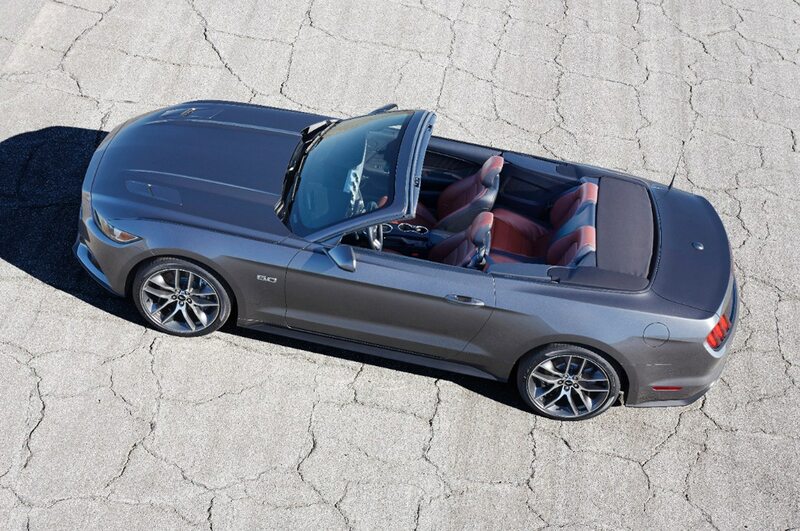 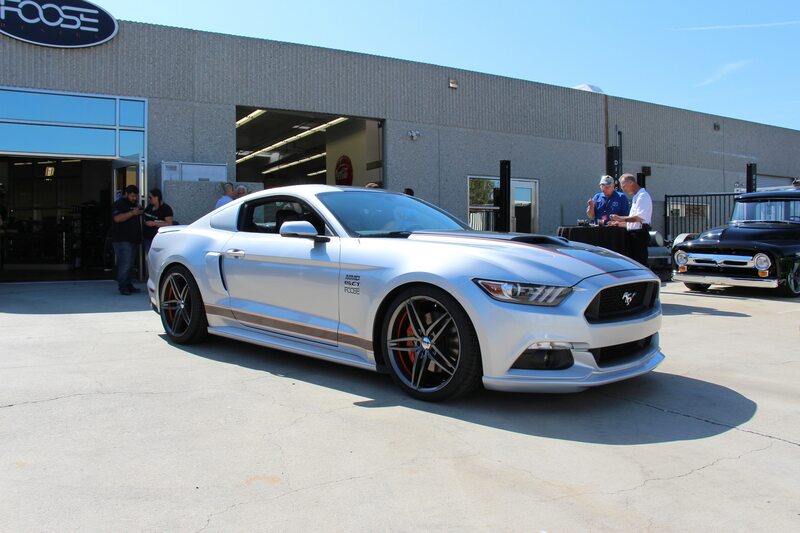 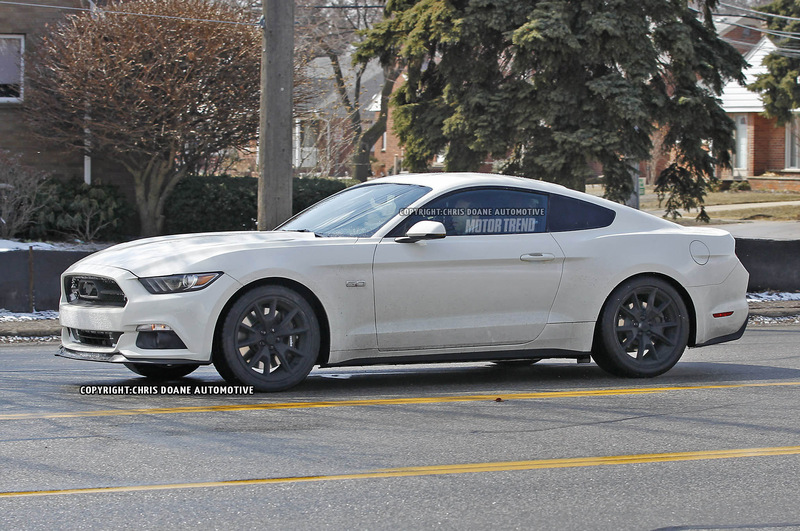 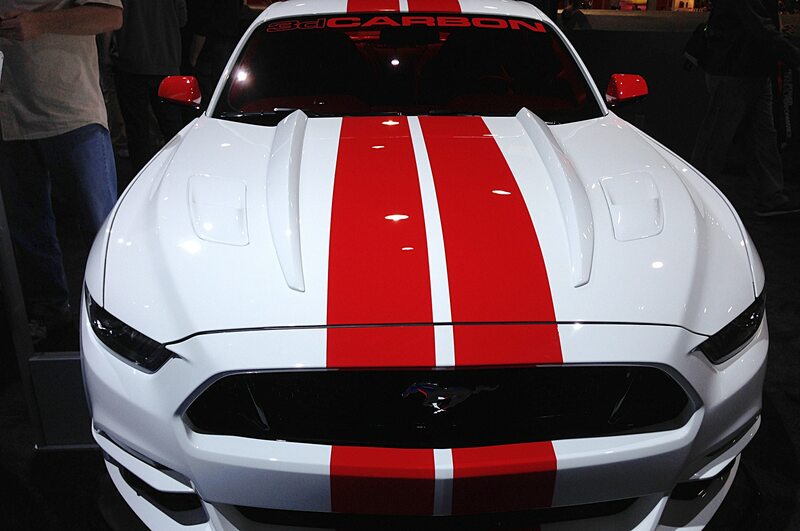 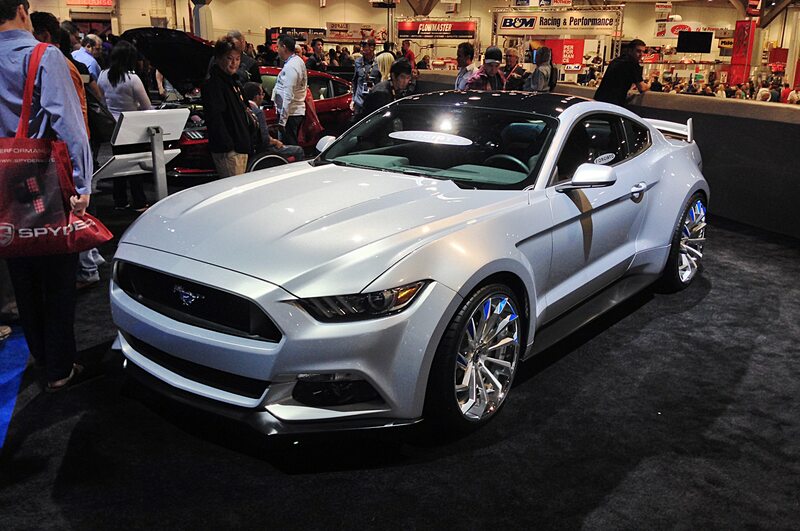 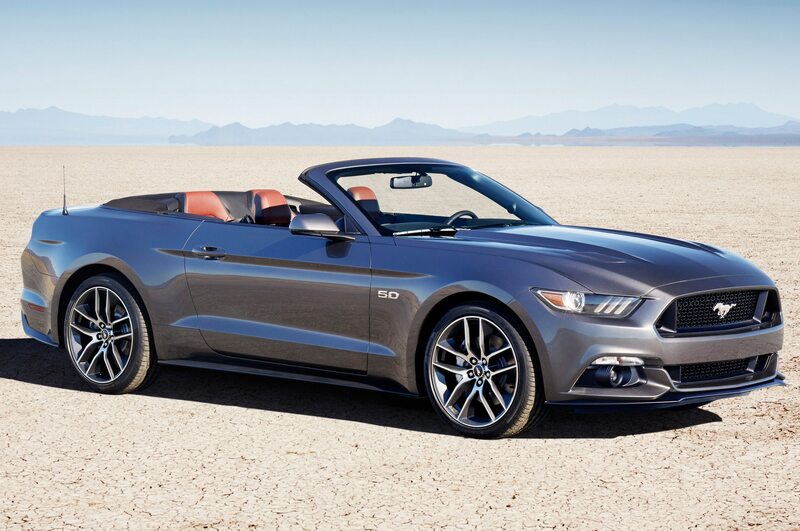 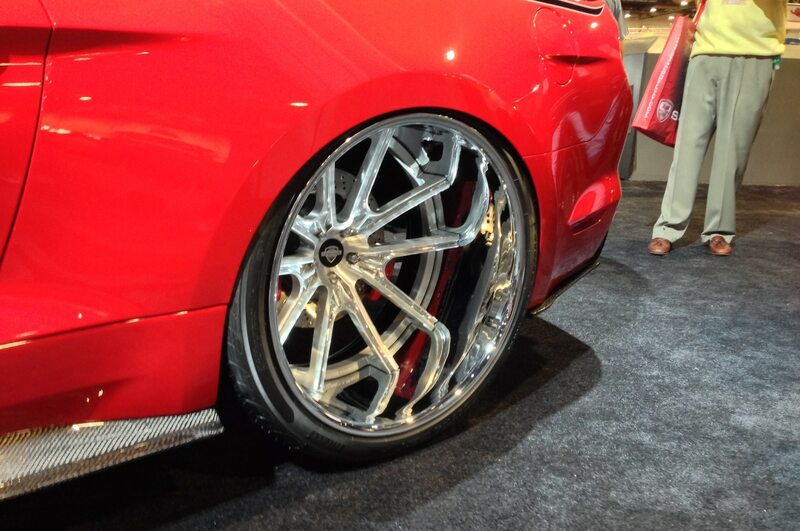 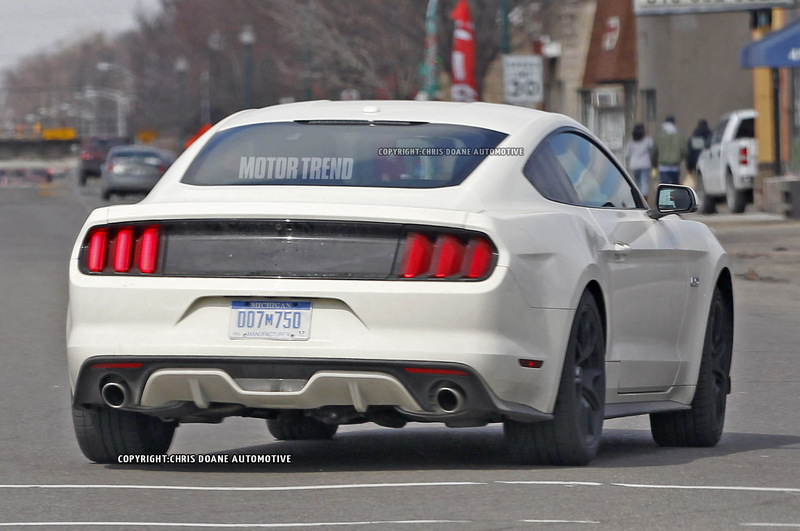 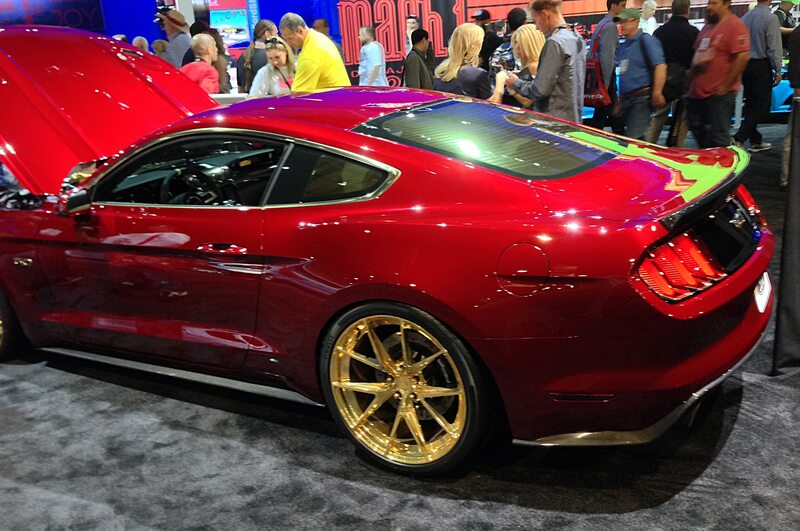 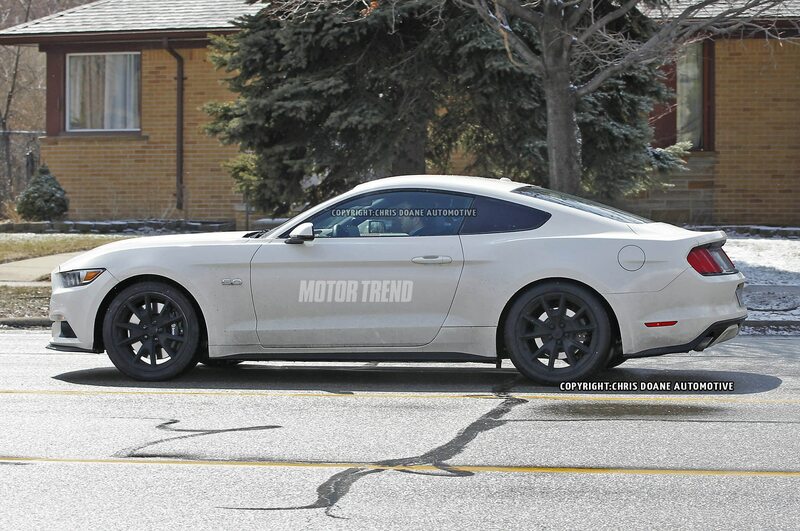 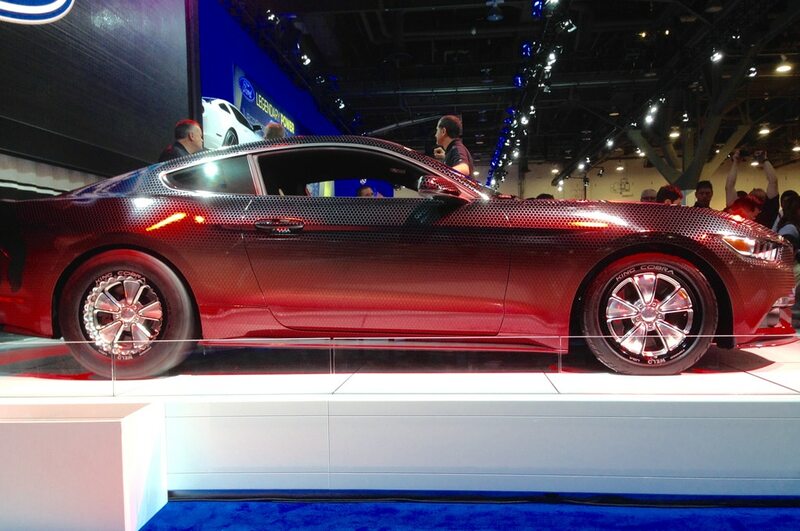 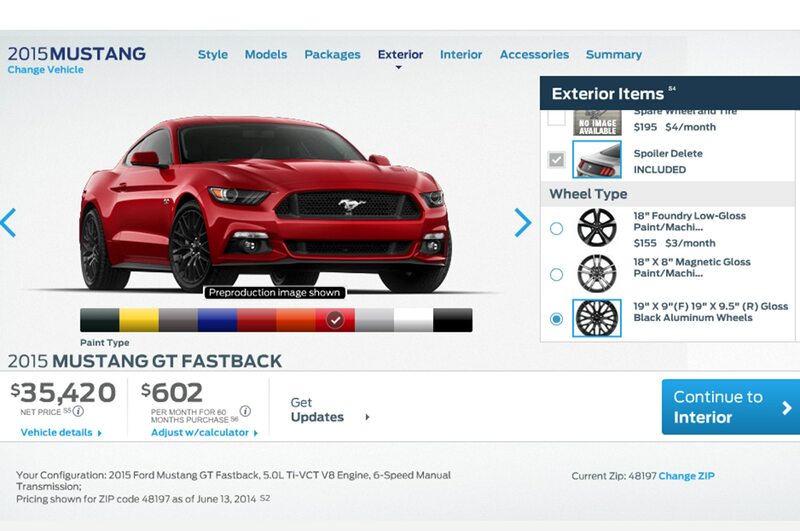 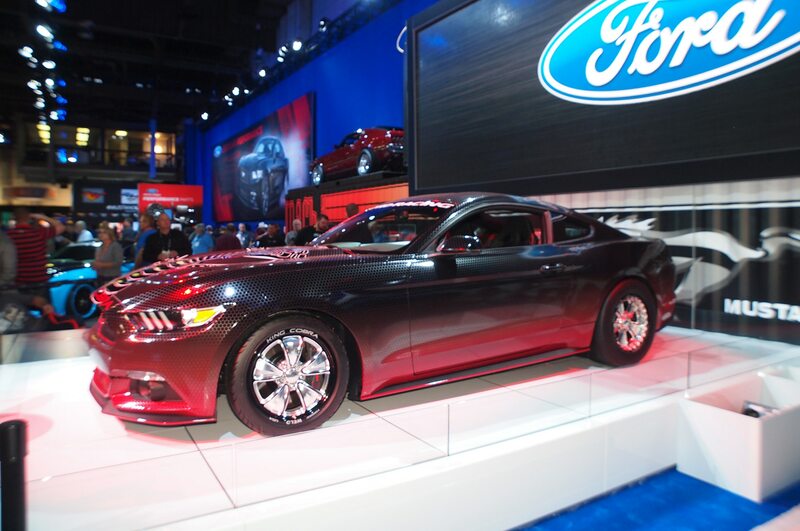 Yes, the Mustang has come a long way from the bare-bones coupe bought by secretaries for a mere $2,368 back in 1964. 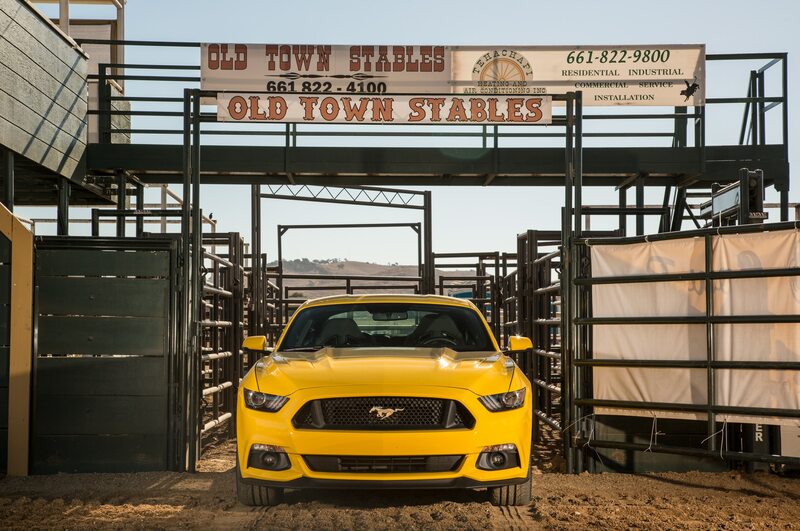 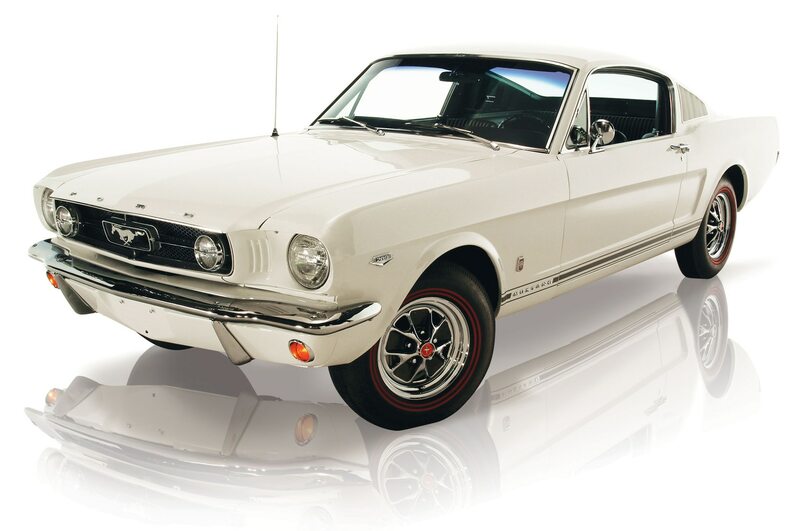 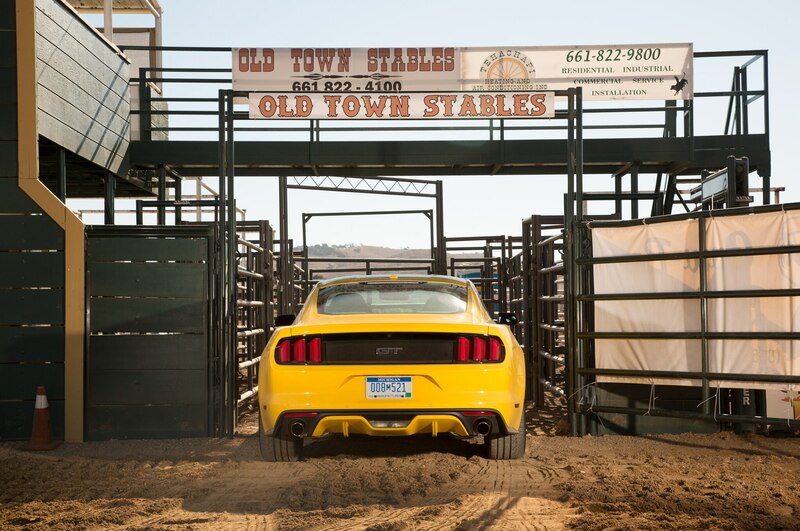 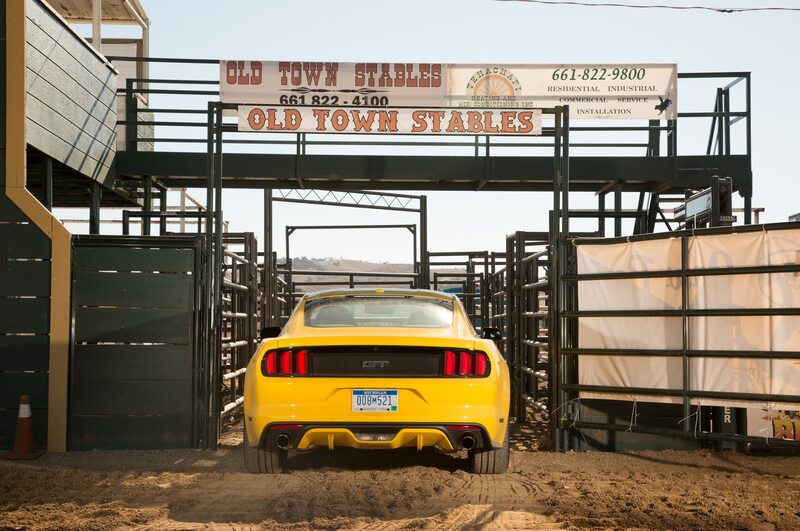 But five decades later, America’s first and foremost ponycar is still a deal any horse trader would love. 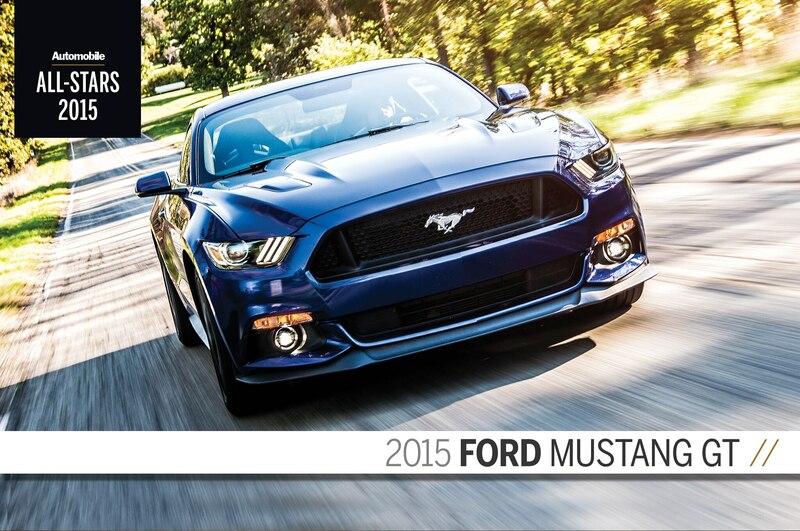 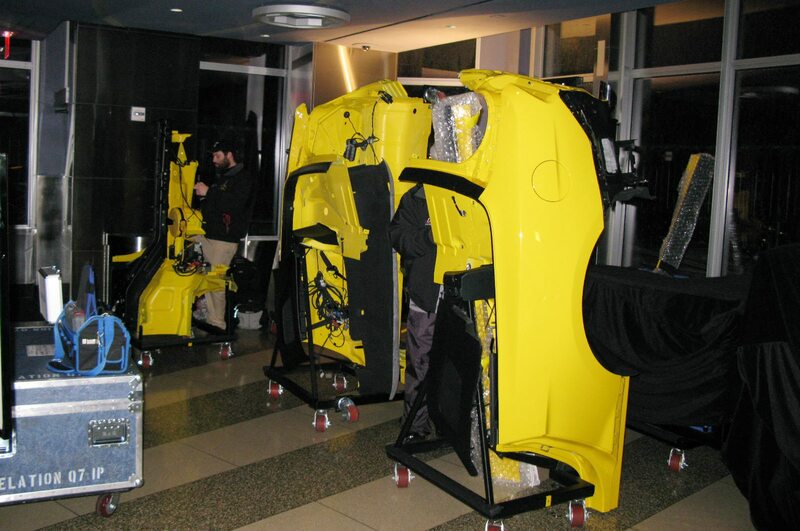 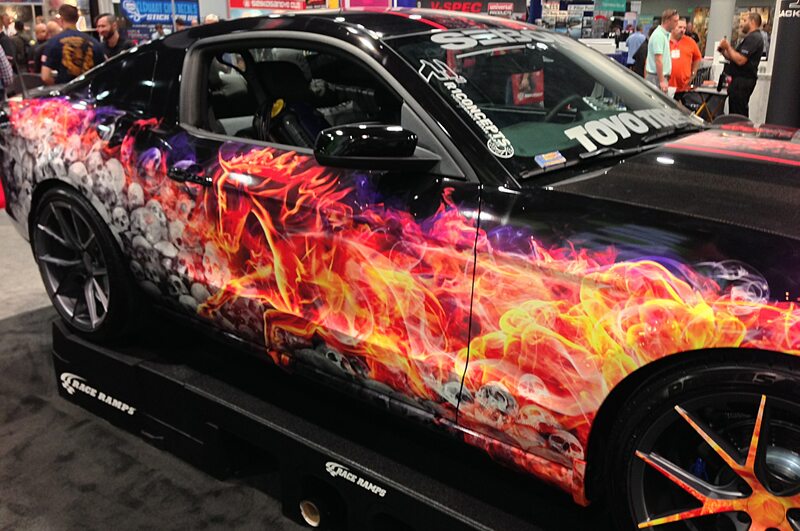 Click here to read about all the 2015 AUTOMOBILE All-Star awards.